2018 marked Barrett-Jackson’s third appearance in the northeast at Mohegan Sun, this year with more cars, more money changing hands and a nearly perfect sale rate. Make no mistake, this is a huge show taking full advantage of Mohegan Sun’s vast new ‘Earth Expo & Convention Center’ to display a few Showcase cars but more importantly to showcase B-J’s vendors and sponsors. They know that bidders, guests and spectators come to B-J armed with money and in an acquisitive mood and offer everything from gold coins to vacation homes to pots and pans. Lines at any exhibitor giving out tee shirts stretch around the booth. It must work, because the exhibitors keep coming back and where, other than at a major automobile show, will Ford, Chevrolet and Dodge all appear under the same roof? Oh, and there’s an auction, too, with all but six lots offered without reserve. The 2018 Barrett-Jackson Northeast was surprisingly short of high dollar lots. Only 25 lots were bid to $100,000 or more. The top lot was, prominently, a pair of ‘last of the series’ cars offered for charity by Fiat-Chrysler, the last Viper and last Dodge Challenger SRT Demon, which sold for $1 million. Other than that, the top lot was a Nova Custom for $275,000. As frequently happens at a Barrett-Jackson auction, there were a few bargains and a few extraordinary results with some of each in the 105 transactions described here. The 105 lots of cars and trucks that follow are sorted by Marque, Model, Body Style and Year for easier search. The run order was Lot #1-200 Thursday, #300-499 Friday and #600-799 Saturday. 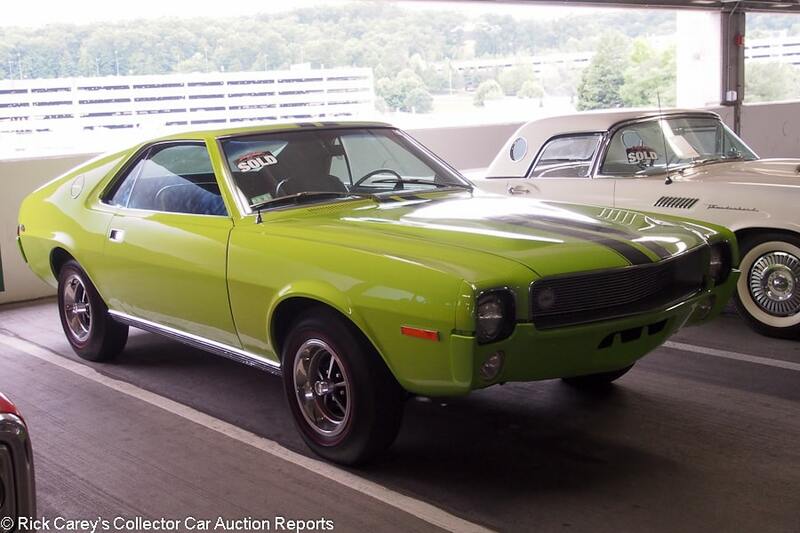 Lot # 68 1968 American Motors AMX 2-Dr. Hardtop; S/N A8C397T291829; Big Bad Green, Black stripes/Black vinyl; Modified restoration, 3- condition; No Reserve; Hammered Sold at $15,500 plus commission of 10.00%; Final Price $17,050 – 343 originally but a 360 now with 10.5:1 pistons, steel rods, headers, MSD ignition, automatic, power brakes, Twin Grip axle, Magnum wheels, red line tires, pushbutton radio, aftermarket tach, tilt steering column – Sound original upholstery, fair older repaint, good chrome except for pitted door handles. Painted bumpers. Underbody has received some attention but the rusty fender supports have been put back on without being painted. A mediocre, modified driver. – Sold here a year ago for $22,000 with 307 fewer miles on the odometer. That was a generous result for a modified car and this one is more realistic. 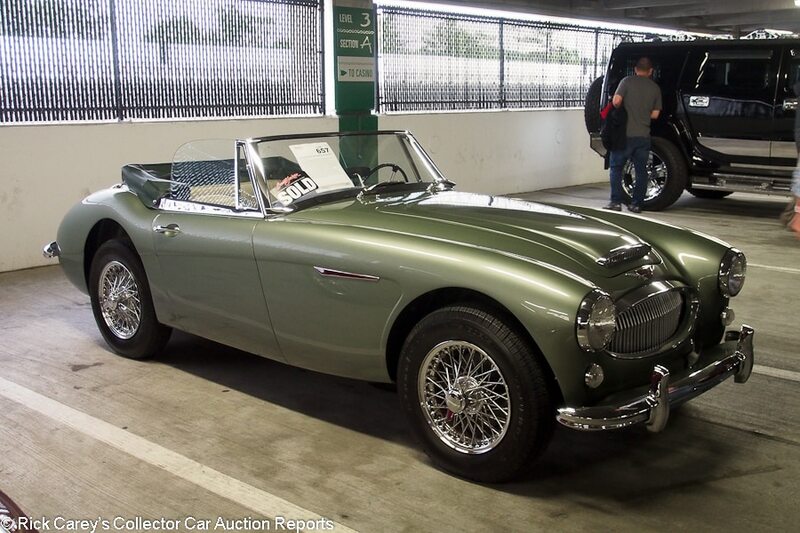 Lot # 657 1964 Austin-Healey 3000 Mk III Phase 2 Roadster; S/N HBJ8L26925; California Sage/Oyster leather; Dark Green leatherette top; Older restoration, 2 condition; No Reserve; Hammered Sold at $100,000 plus commission of 10.00%; Final Price $110,000 – Chrome wire wheels, Touring T/A tires, overdrive, no radio. – Restored by Kurt Tanner with his father’s outstanding paint. The chrome and interior are to the same impeccable standards. If there’s a complaint it’s some paint irregularities along the back edge of the hood. The underbody is so clean it must have been driven sparingly if at all after it left Kurt’s shop. – One of the earliest Phase 2 BJ8s, it was offered at Mecum Dallas in 2013 where it was reported bid to $75,000, then sold at B-J Las Vegas in 2016 for $104,500. This result defies the recent softening trend for BJ8s and is a potentially important benchmark. On the other hand, it was the only Big Healey at Mohegan Sun, a hard to criticize car that apparently queued up bidders looking to take home a fine example of its type. Lot # 2.1 1983 BMW 633 CSi Coupe; S/N WBAEB8407D6995028; Silver/Black leather; Unrestored original, 3- condition; No Reserve; Hammered Sold at $6,000 plus commission of 10.00%; Final Price $6,600 – Automatic, alloy wheels, sunroof, air conditioning, power windows, Kenwood CD stereo. – Represented with 68,680 actual miles. Fairly dull original paint with numerous chips around the hood. Several light scratches on the hood and several more on the roof and sunroof. Scuffed up, lightly scratched wheels and the BMW badge stickers are coming off the caps at all four corners. Dull switchgear. Sound original upholstery. Used but tidy underneath. CARFAX shows an accident in 2003. Very much a used car,. – Sold here two years ago with 2,000 fewer miles showing on its odometer at a price of $6,820, the buyer has had two years and reasonable mileage with minimal financial consequence. 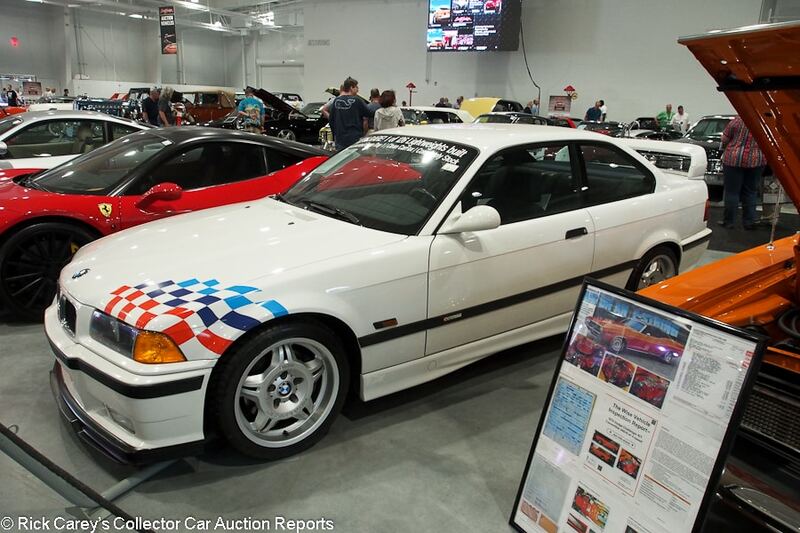 Lot # 676 1995 BMW M3 Lightweight Coupe; S/N WBSBF9321SEH07179; Alpine White/Anthracite cloth; Unrestored original, 2 condition; With Reserve; Hammered Sold at $110,000 plus commission of 10.00%; Final Price $121,000 – 3.23:1 final drive, aluminum doors, reduced sound insulation, stiffer springs and shocks from the European-spec E36 M3 coupe, M-shock tower brace, forged M double-spoke alloy wheels, M3 GT front spoiler lip extension, standard M3 rear spoiler with integrated third brake light, chequered flag decals in BMW Motorsport colors on the left front and right rear corners of bodywork, “BMW Motorsport International” emblems on exterior door moldings, interior door sill plates and trim panel above the glovebox, BMW sport seats covered in Anthracite Hurricane cloth with red highlights, carbon-fiber-look dashboard and center console trim, Anthracite carpeting from the 4-cylinder E36 coupe, air-conditioning delete, radio delete (prewiring for radio and two door speakers included), sound insulation reduction, tool kit delete and console valet delete. – Represented as 5,000 miles from new and looks like it. One of 126 built. – A Hero Car for BMW enthusiasts, with only a few (the actual number is not clear) built the price it brought is the price it should have brought. 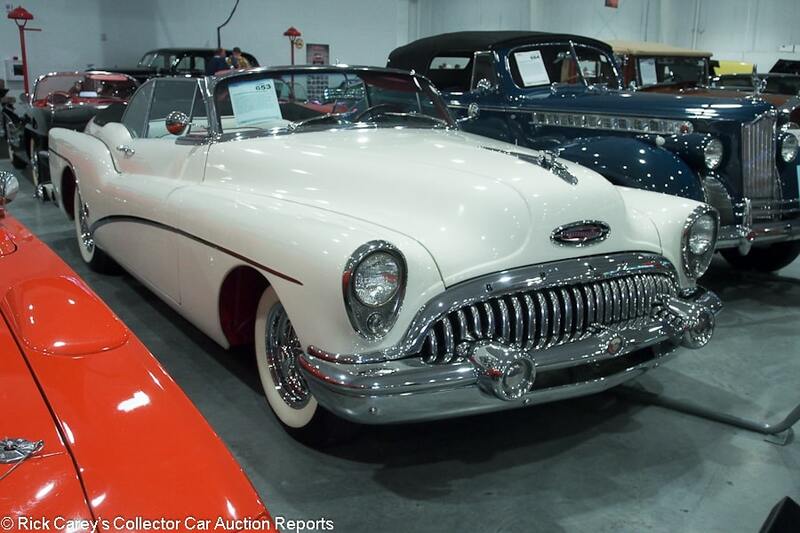 Lot # 653 1953 Buick Skylark Convertible; S/N NH0013024; White/White, Maroon leather; Black cloth top; Older restoration, 2+ condition; No Reserve; Hammered Sold at $90,000 plus commission of 10.00%; Final Price $99,000 – 322/188hp, Dynaflow, WonderBar radio, power windows, brakes and steering, chrome wire wheels, wide whitewalls, power antenna – An older show quality restoration that shows 1,164 miles on the odometer but a fraction of that on the car. The paint, chrome, stainless and interior all are very good. There does appear to be a small repair in the right rear wheel arch. No one should be reluctant to show this Skylark next weekend, despite its NH assigned VIN. – This is a $30,000 better car than the price it brought here, even with the assigned VIN. 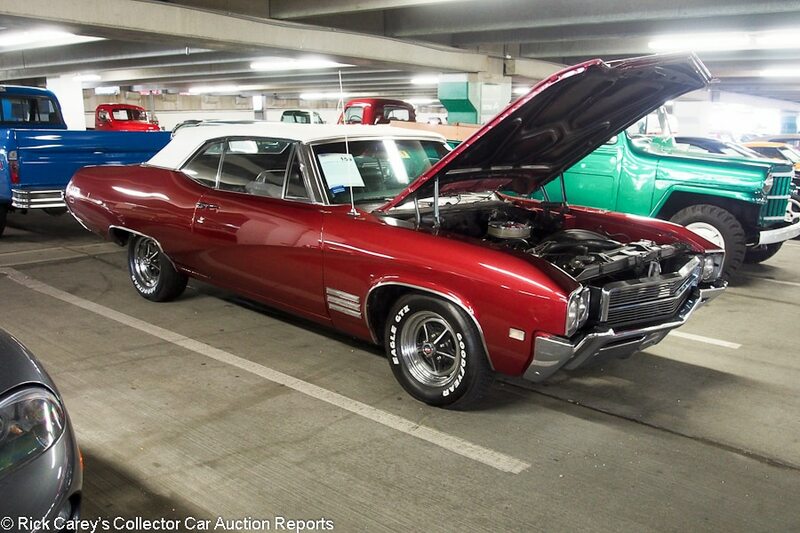 Lot # 159 1968 Buick Skylark Convertible; S/N 444678Y156127; Ruby Red/Black vinyl; White vinyl top; Visually maintained, largely original, 3 condition; No Reserve; Hammered Sold at $14,000 plus commission of 10.00%; Final Price $15,400 – 350/230hp, 4-barrel added, automatic, power steering but not brakes, pushbutton radio, Sony CD stereo under the dash. – Sound repaint except for sags and cracks on the right front fender. Flaking grille chrome, pitted windwing frames. Old, dusty engine compartment. The underside looks the same. It’s just a car, without much going for it other than the convertible top. Claimed to have an ‘engine and transmission refresh … within the last two years.’ – That ‘refresh’ could be anything from new plug wires to a rebuild although the engine compartment’s condition leans toward plug wires. The bidders paid a realistic price for it and the prospect of a few months’ fun in the summer sun. 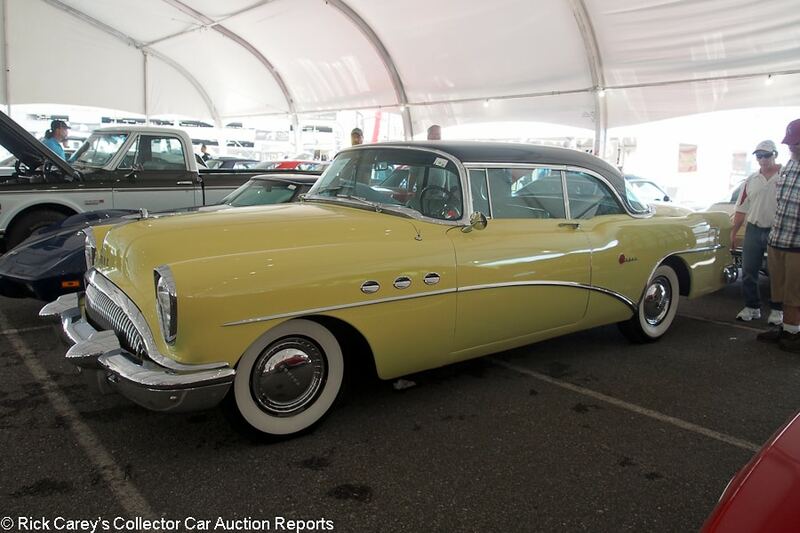 Lot # 451 1954 Buick Super 2-Dr. Hardtop Riviera; S/N A1035385; Condor Yellow, Black roof/Green vinyl, cloth; Unrestored original, 3+ condition; No Reserve; Hammered Sold at $23,000 plus commission of 10.00%; Final Price $25,300 – 322/177hp, Dynaflow, power steering, pushbutton radio, wheel covers, wide whitewalls, original window sticker documented. – Represented as two owners from new. Good original paint with door chips along the back of the left front fender. Very good original chrome and bright trim. Good original interior with a few seams starting to pull. The underbody is clean and well maintained. Driver’s door window is cracked. Everything points to an easy life. – There are several easily addressed flaws, none of them difficult or expensive to fix. It’s a sound and honest car in distinctive colors that make it stand out. A choice preservation class entry the result here has a deserved premium for originality and is a sound value. 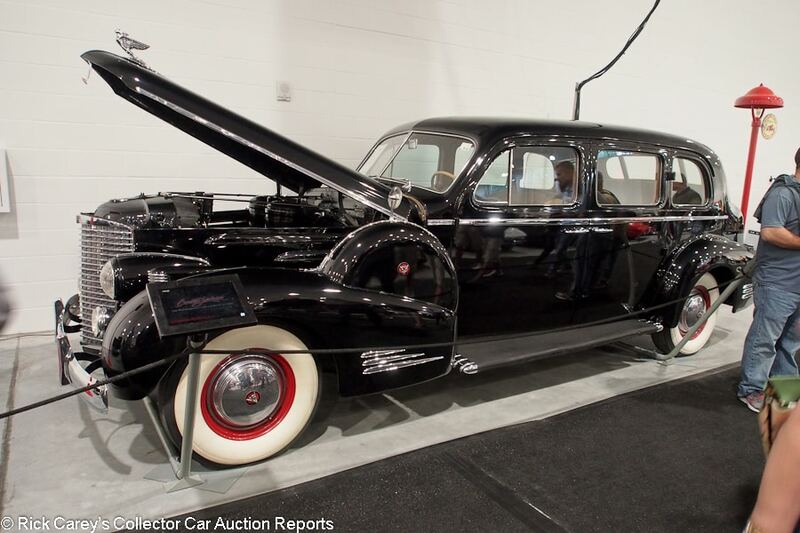 Lot # 701.1 1938 Cadillac 38-90 V-16 4-Dr. Sedan; S/N 5270127; Black/Beige cloth; Visually maintained, largely original, 3- condition; No Reserve; Hammered Sold at $55,000 plus commission of 10.00%; Final Price $60,500 – Red wheels, large hubcaps, wide whitewalls, fog lights, radio missing, dual enclosed sidemounts, footrests, no division, smokers’ kits. – Failing old microblistered paint, good major chrome and mostly original interior. Quickly repainted underbody over old paint. Cracked driver’s door window and delaminating rear window. Scraped left front hubcap. Dirty original engine compartment. Formerly painted Blue. Stately but tired. Ashton Collection. – Sold at Worldwide’s Houston auction in 2012 for $60,500, then at Auburn Fall four months later for $48,950. After inconclusive appearances at Leake Tulsa in 2013 ($49,000 bid) and Auburn Fall again in 2013 ($43,000 bid) it sold at Barrett-Jackson WestWorld in 2014 for $52,800. The bidders here must have been impressed into paying this imposing price by its imposing presence because its condition is showing signs of age and inattention. Lot # 338.1 1958 Chevrolet 3200 Apache Pickup; S/N 3B58L114688; White, Light Blue/White, Light Blue vinyl; Recent restoration, 2 condition; No Reserve; Hammered Sold at $35,000 plus commission of 10.00%; Final Price $38,500 – 236/145hp six, 4-speed, power steering, hubcaps, wide whitewalls, long bed stepside body, cassette stereo, heater, turn signals, chrome grille and bumpers. – Most chrome is very good but the door handles are pitted. Very good unblemished paint. The chassis has been restored like new. Good bed floor wood with stainless strips. This truck is restored like a car and is very handsome. – The new owner will be proud to drive this Chevy long bed, a truck that has been done thoroughly. Lesser pickups bring lesser money and this truck was worth its premium price. 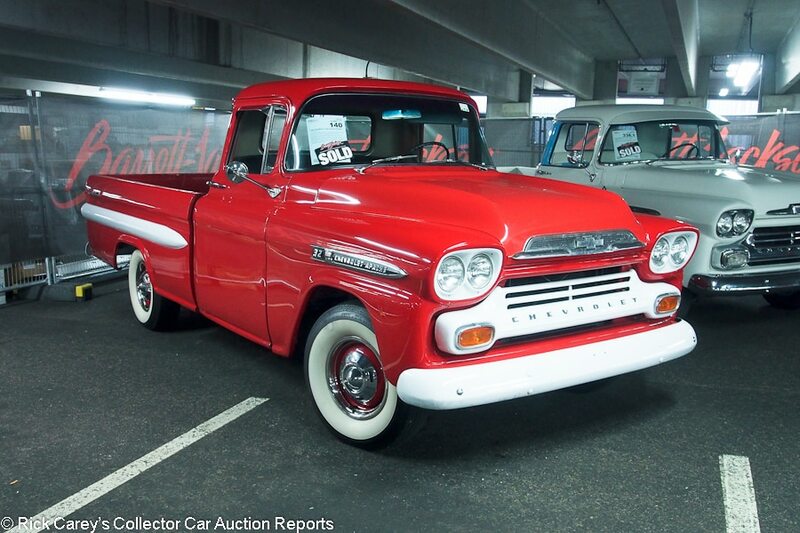 Lot # 140 1959 Chevrolet 3200 Apache Pickup Fleetside; S/N 3B59K116553; Red, White accent/Black vinyl; Truck restoration, 3- condition; No Reserve; Hammered Sold at $19,000 plus commission of 10.00%; Final Price $20,900 – 235 six, 4-speed, hubcaps and trim rings, whitewalls – Orange peely, microblistered, scratched paint. Sound upholstery but otherwise old and neglected dash, instruments and interior. Hood doesn’t close flush. Generally terrible masking. Weak trim chrome. Rusty bed strip bolts. Dry, dirty chassis. Sound but unattractive. 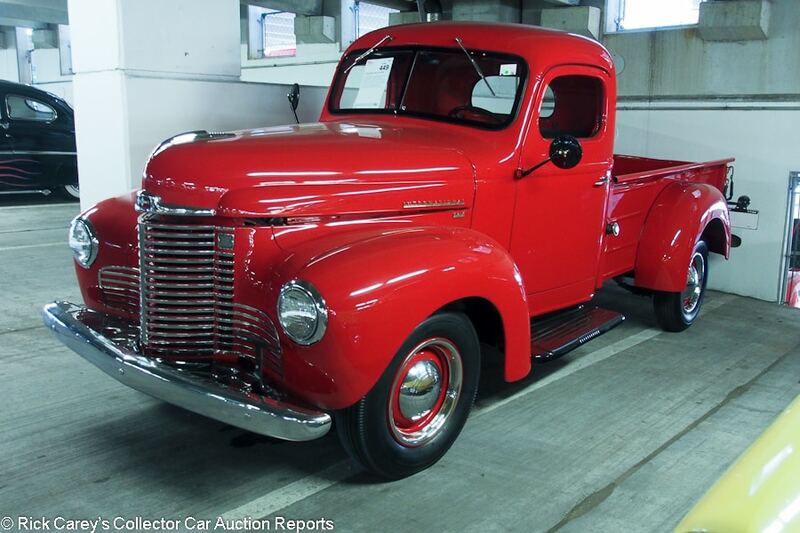 – Sold here a year ago for exactly the same result and the seller, assuming it’s the buyer from twelve months ago, should be overjoyed to break even (nearly, after commission) on this marginal Chevy pickup. 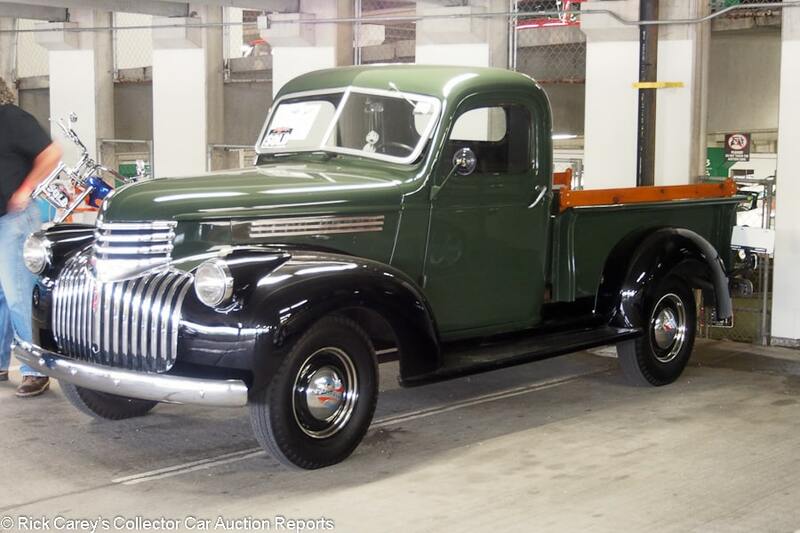 Lot # 141 1941 Chevrolet AD Pickup; S/N AD346661; Green, Black fenders/Black leatherette; Truck restoration, 4+ condition; No Reserve; Hammered Sold at $30,000 plus commission of 10.00%; Final Price $33,000 – 216 six, 3-speed, wood bed floor and sideboards, dual taillights, top-hinged windshield, heater, hubcaps and trim rings. – Dull but sound old repaint with scratches and scrapes. Sound upholstery. Good chrome and bed wood. Unfortunately, the rest of the truck is original, dirty and faded. The steering wheel and instrument panel are particularly repugnant. This is a neglected old work truck with lipstick. – Described on the car card as a ‘beautifully restored’ truck, this Chevy was nothing like that. 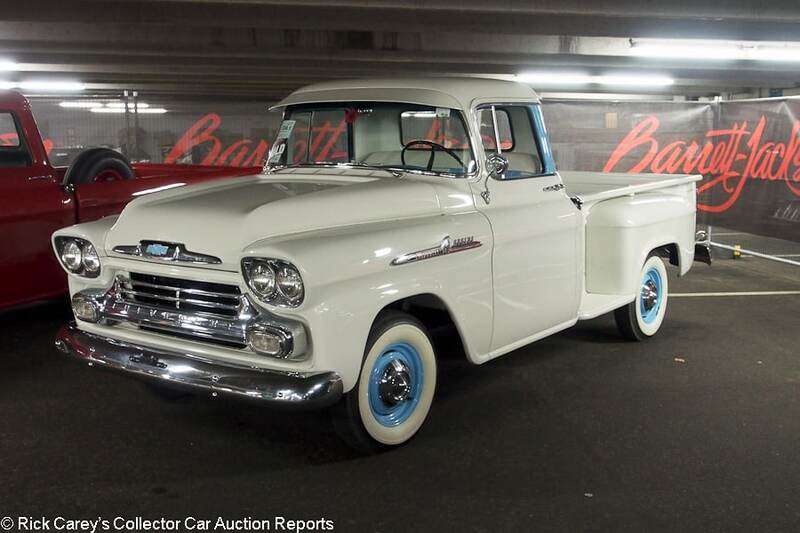 In its favor, Chevy pickups of this era are rare things but in this case its rarity doesn’t come close to offsetting its superficial presentation designed to look good under the lights on the auction block. 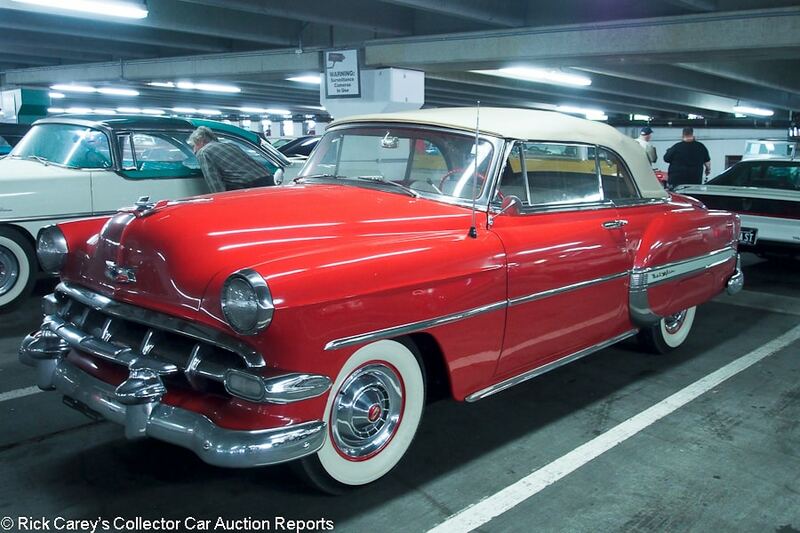 Lot # 94 1954 Chevrolet Bel Air Convertible; S/N C54J008022; Red/Red, White vinyl; Beige cloth top; Older restoration, 3 condition; No Reserve; Hammered Sold at $34,000 plus commission of 10.00%; Final Price $37,400 – 235/115hp six, Powerglide, power steering, pushbutton radio, heater, wheel covers, wide whitewalls, grille guard, skirts. – Decent old paint, dull chrome, good interior and top. Four small scrapes on the left front fender. Dirty all over. Restored underbody shows little evidence of use. Restored a while ago and neglected since but will clean up to be a presentable driver. – This Bel Air was viewed on the first preview day, Wednesday, when it looked like it’d just been given a dirt bath. By the next morning it was cleaned up and looked a lot better and this price reflects that. Lot # 646 1956 Chevrolet Bel Air Convertible; S/N VC56N076341; Engine # F56FB; Onyx Black/Charcoal, Ivory vinyl; Black vinyl top; Older restoration, 2- condition; No Reserve; Hammered Sold at $70,000 plus commission of 10.00%; Final Price $77,000 – 265/205hp ‘FB’ Powerglide block, dual quads, 3-speed, manual steering and brakes, wire wheel covers, whitewalls, remote spotlight-mirror, pushbutton radio. – Excellent paint, interior and chrome except for lightly scuffed windowsill trim. The engine compartment is nearly like new but oil misted and dirty down deep. Good enough to show, not too good to drive. – What goes around, comes around was never more fitting than with this ’56 Bel Air which was reported sold at Mecum Indy in 2012 for $72,610, then at Mecum’s Monterey auction in 2013 for $85,600 and at B-J WestWorld in 2017 for $63,800. The difference between these results and today is a few bids and while its engine might not be what it aspires to be, it’s still a sweet Tri-Five Chevrolet convertible at a price that demonstrates the continuing popularity and value of these cars. A Chevy like this is on pretty much every collector’s short list of desired cars. 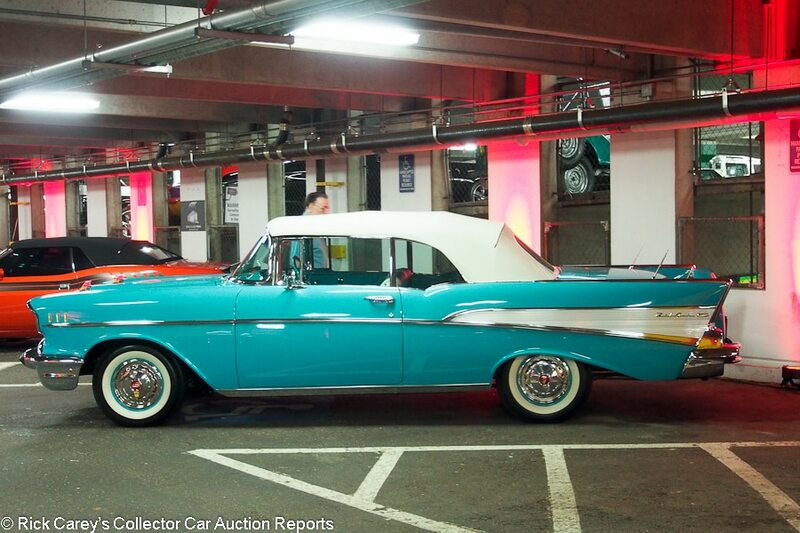 Lot # 678 1957 Chevrolet Bel Air Convertible; S/N VC57L162969; Tropical Turquoise/White, Turquoise vinyl; White vinyl top; Older restoration, 2+ condition; No Reserve; Hammered Sold at $90,000 plus commission of 10.00%; Final Price $99,000 – 283/220hp, automatic, power brakes, steering, windows and bench seat, 3.42Positraction, WonderBar radio, spinner wheel covers, whitewalls, dual rear antennas, continental kit, power steering, electric wipers, windshield washers, vacuum ashtray. 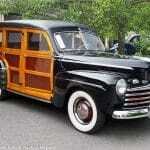 – 1998 AACA National First Prize and Classic Chevy International Platinum award. Excellent paint, chrome, interior and top. The engine compartment is like new with only a little dust and age. The lower body is unevenly but lightly filled. Still showable and a quality car with a quality restoration. – A ‘vacuum ashtray’? Back in the Fifties everyone smoked and the vacuum ashtray sucked the ashes from the driver’s Old Golds or Camels into the intake manifold, adding nothing to performance but keeping the passenger compartment free of noxious tobacco remnants. This is an impressively restored and equipped ’57 Chevy convertible sold for $108,000 at Mecum Kissimmee in 2016 and $121,000 at the same venue in 2016. By that standard (or any other) this is a superior ’57 Bel Air and a sound value if only for its many options. 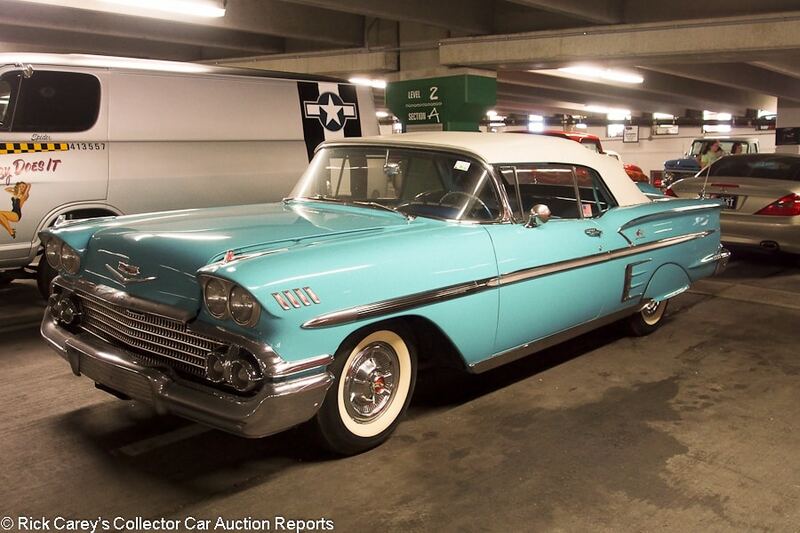 Lot # 358.1 1958 Chevrolet Bel Air Impala Convertible; S/N F58T179970; Engine # T219H; Tropical Turquoise/Turquoise vinyl; White vinyl top; Cosmetic restoration, 3- condition; No Reserve; Hammered Sold at $51,000 plus commission of 10.00%; Final Price $56,100 – 348/250hp, Turboglide, spinner wheel covers, whitewalls, skirts, dual rear antennas, continental kit, pushbutton radio, no power steering or brakes. – Soiled soft top, dirty engine compartment and chassis. Orderly interior. Decent paint and chrome. Neglected and aged but reasonably sound. Honestly described on the car card as ‘an older, driver-quality restoration’, exactly what it is. – Bought advantageously but in need of attention pretty much everywhere, it’s going to be hard to decide where to start with this Impala, and then when to stop. To appeal to today’s collectors, for whom power steering and brakes are considered standard equipment, those two missing items should be added, taking advantage of working under the hood to give it a good cleanup and touchup, and maybe add aftermarket air conditioning while it’s apart. At the price paid here all this is possible without spending more than the Impala will be worth when they’re done. Lot # 92 2007 Chevrolet Callaway Corvette Coupe; S/N 1G1YY25U475118884; Victory Red, Black hood bulge/Black leather; Unrestored original, 2- condition; No Reserve; No Result – 6.0/600hp supercharged Callaway LS2, 6-speed, sound system, Fikse 18/19-inch wheels, Michelin tires. – Supercharger drive belt is missing. Good original paint and interior. No apparent nicks, bumps or scratches. Belt replaced by Saturday. – Present but not reported by B-J and probably pulled on its way to the block when it parted company with the blower drive belt. 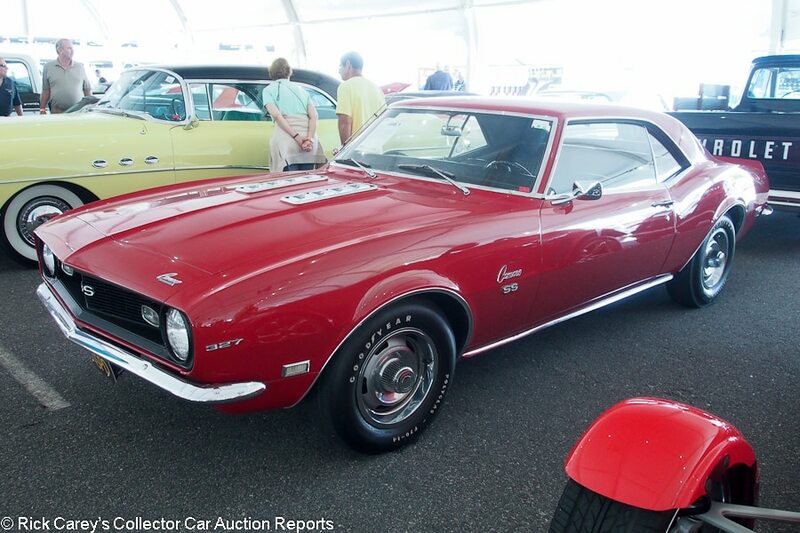 Lot # 448.1 1968 Chevrolet Camaro SS 2-Dr. Hardtop; S/N 124378N393967; Red/Black vinyl; Visually maintained, largely original, 3 condition; No Reserve; Hammered Sold at $29,000 plus commission of 10.00%; Final Price $31,900 – 327/210(? )hp, 4-speed, Hurst shifter, steering column mounted Sun tach, Positraction, underdash gauges, console, Rally wheels with trim rings, F70-14 Polyglas tires, Protect-o-Plate documented. – Dull old repaint with chips along the edge of the spoiler. 4-inch scrape on the right rear fender. Paint is buffed through on the hood. Stone chipped nose. Good original interior, clear sharp gauges. Dirty, surface rusted underbody and chassis. Sound and not abused, represented as the original engine. – Other than that it is the ‘original 327ci V8’ the consignor didn’t bother to specify which of the 327 options it left Norwood with and that, needless to say, is a factor in its value. No matter which one, however, this result has a significant premium for originality despite the obvious at least partial repaint, but not enough to make it expensive. 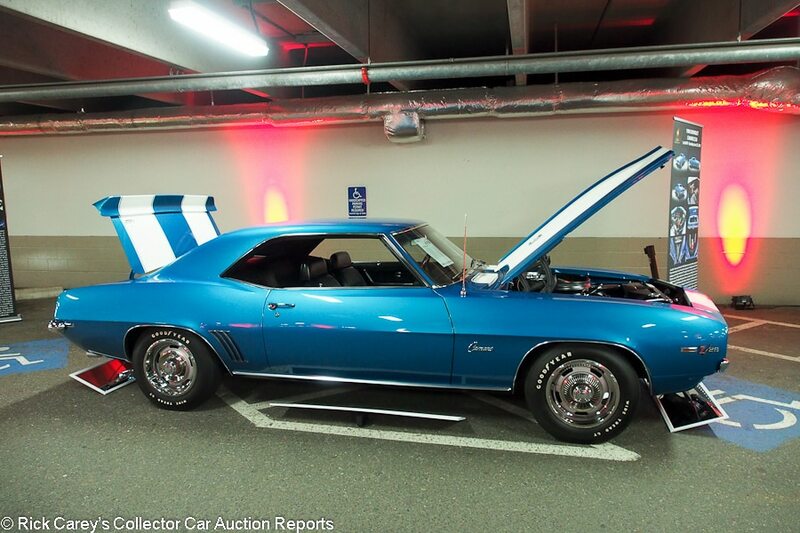 Lot # 679 1969 Chevrolet Camaro Z/28 2-Dr. Hardtop; S/N 124379L529925; LeMans Blue, White stripes/Black vinyl; Older restoration, 2+ condition; No Reserve; Hammered Sold at $100,000 plus commission of 10.00%; Final Price $110,000 – 302/290hp, 4-speed, Hurst shifter, console gauges, radio delete, power steering and front disc brakes, Rally wheels with trim rings, Wide Tread GT tires, cowl induction, 3.73 Positraction, build sheet documented. – Legend Award from the American Camaro Association. Excellent paint, chrome and original interior. Clean, sharp engine compartment and chassis. Represented as the matching numbers engine, transmission and rear axle. Restored like new and maintained like that. 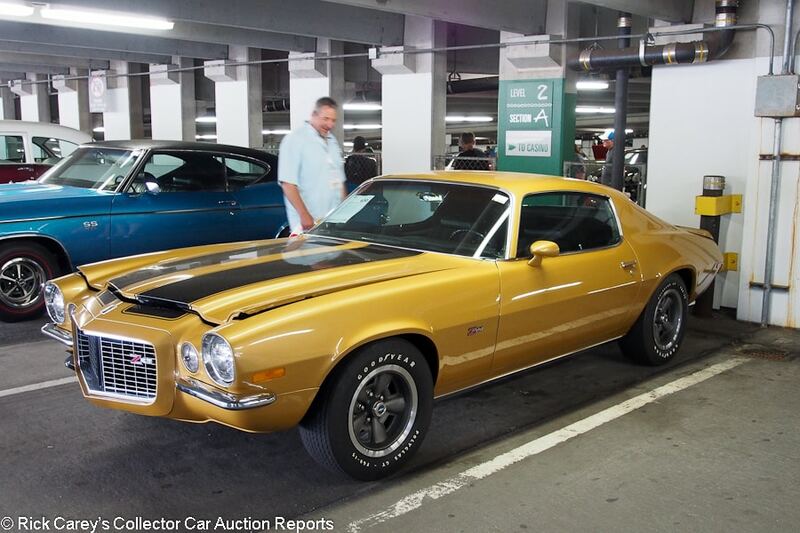 – This is a multi-judged and flawless Z/28 that brought a superior but deserved price. It needs no excuses and that is worth a lot, a car to be proud to own and drive sparingly. 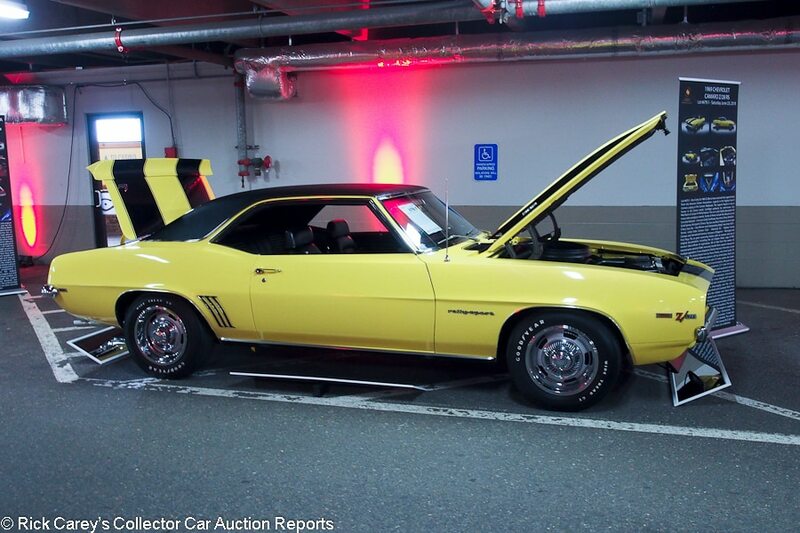 Lot # 679.1 1969 Chevrolet Camaro Z/28 RS 2-Dr. Hardtop; S/N 124379N570338; Engine # V1218DZ; Daytona Yellow, Black stripes and vinyl roof/Black vinyl; Older restoration, 2+ condition; No Reserve; Hammered Sold at $90,000 plus commission of 10.00%; Final Price $99,000 – 302/290hp, 4-speed, Hurst shifter, 4.1 Positraction, tinted glass, console gauges, Rally wheels, Wide Tread GT tires, pushbutton radio, power brakes, cowl induction. – Known ownership from new, documented with the MSO and first owner’s registration. Represented as the matching numbers engine, transmission and rear axle. Legend Award from the American Camaro Association, along with many other awards and still presents as new and spotless. The driver’s door doesn’t close quite flush but that’s a minor issue with an otherwise outstanding Camaro. – Z/28 overload may be the reason this ’69 Z/28 sold for $11,000 less than the equally impressive one that preceded it across the block. Sometimes it’s good to keep your powder dry and take the Yellow one. Lot # 630 1970 Chevrolet Camaro Z/28 RS Coupe; S/N 124870N521223; Gold, Black stripes/Black vinyl; Older restoration, 2- condition; No Reserve; No Result – 350/360hp LT1, M21 4-speed, power brakes and steering, mag-style wheel covers, F60-15 Polyglas GT tires, woodgrain instrument panel, Hurst shifter, 4.10 axle, original window sticker documented. – Very good recent clearcoat paint and interior. The engine compartment was restored to showroom condition and has been lightly and carefully driven. Some detailing should make a big difference. – Viewed on-site but with no result reported, no inference is possible. 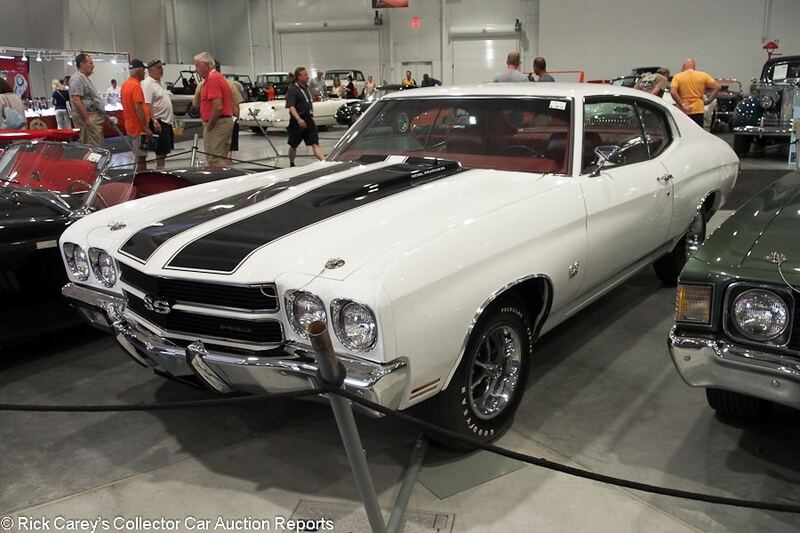 Lot # 670 1970 Chevrolet Chevelle LS6 2-Dr. Hardtop; S/N 136370K171889; White, Black stripes/Red vinyl; Older restoration, 2 condition; With Reserve; Hammered Sold at $157,000 plus commission of 10.00%; Final Price $172,700 – 454/450hp LS6, automatic, 4.1 Positraction, power steering and brakes, SS wheels with trim rings, F70-14 Polyglas tires, buckets and console, sport steering wheel, pushbutton radio, tilt steering column, cowl induction, 8-track stereo. – Excellent paint, chrome and interior. The engine compartment and chassis are like new. Restored five years ago but looks more recent. Represented as the matching number engine, original carburetor and exhaust. Several awards, but none from specialist judging other than an Eckler’s Chevy Classics Platinum in 2013. – It’s impossible to fault this Chevelle, except for the absence of independent specialist judging credentials. The bidders here at Mohegan Sun didn’t seem to be bothered and after being bid to a more optimistic result it set a standard for its type. This is a full retail price. 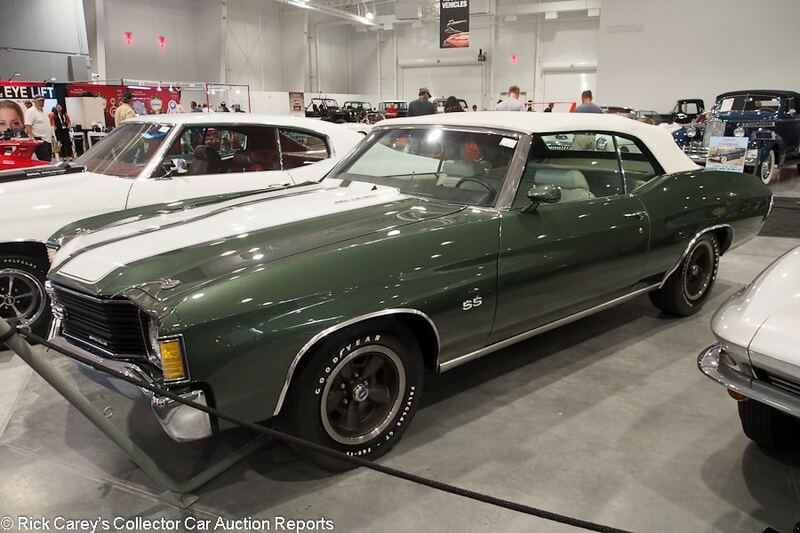 Lot # 752 1972 Chevrolet Chevelle Malibu SS Convertible; S/N 1D67U2B697098; Engine # T0519CTB; Green, White stripes/White vinyl; White vinyl top; Older restoration, 2- condition; No Reserve; Hammered Sold at $65,000 plus commission of 10.00%; Final Price $71,500 – 402/240hp LS3, automatic, cowl induction hood, hood pins, bench seat, column shift, pushbutton radio, air conditioning, power steering and brakes, Rally dash, build sheet and Protect-O-Plate documented. – Represented as matching numbers and 50,628 miles. Very good paint and chrome. Excellent top. Very good interior. Tidy underneath. Looks like a body-on restoration done a while ago but very well kept since. It is a smog choked ’72, but it has the looks of the more valuable earlier cars and with the 402 LS3 engine, it has that year’s hottest smallblock powertrain. – Sold by Mecum in Dallas in 2012, then at the same venue in 2017 for #36,300. It no-saled at Mecum Louisville two weeks later, then was reported sold at Kissimmee in January of this year for $45,100. Its odometer has added just 11 miles in the last nine months on and off transporters. None of which accounts for this result, which is generous by a few bidding increments and a profit of over $15,000 since Kissimmee even after the seller’s commission. Of such results are Barrett-Jackson legends made. 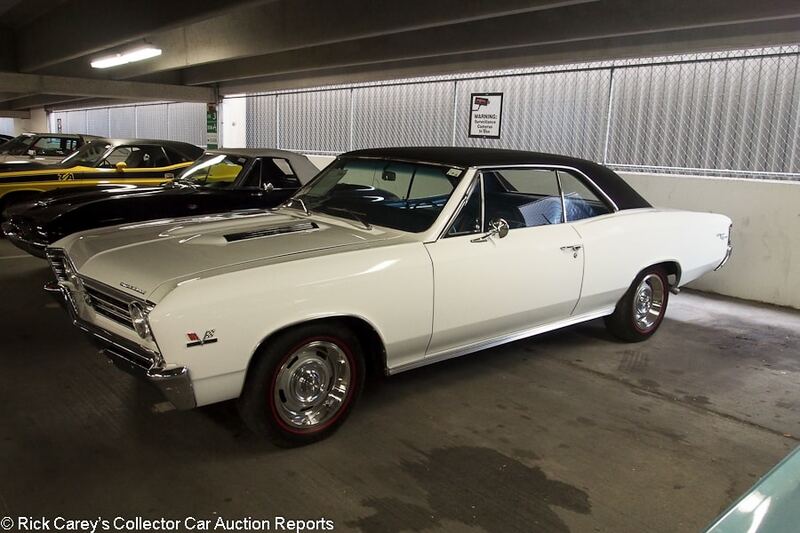 Lot # 396 1967 Chevrolet Chevelle SS 396 2-Dr. Hardtop; S/N 138177Z158482; Ermine White, Black vinyl roof/Blue vinyl; Recent restoration, 2 condition; No Reserve; Hammered Sold at $39,500 plus commission of 10.00%; Final Price $43,450 – L34 396/325hp, 4-speed, Rally wheels with trim rings, Silvertown red line tires, Protect-O-Plate, 12-bolt rear end, power steering, Hurst shifter, bench seat, pushbutton radio. – Very good paint, chrome, roof vinyl and interior. Fresh and spotless underneath. Straight body with even gaps. Recently done to like new without being overdone. Represented as the original engine and rear axle. – Sold at B-J’s Las Vegas auction in 2016 for $45,100 and bought here for a similar, and realistic, price. The L34 won’t win many muscle car showdowns, but it is a very good choice for weekend cruises and road trips. 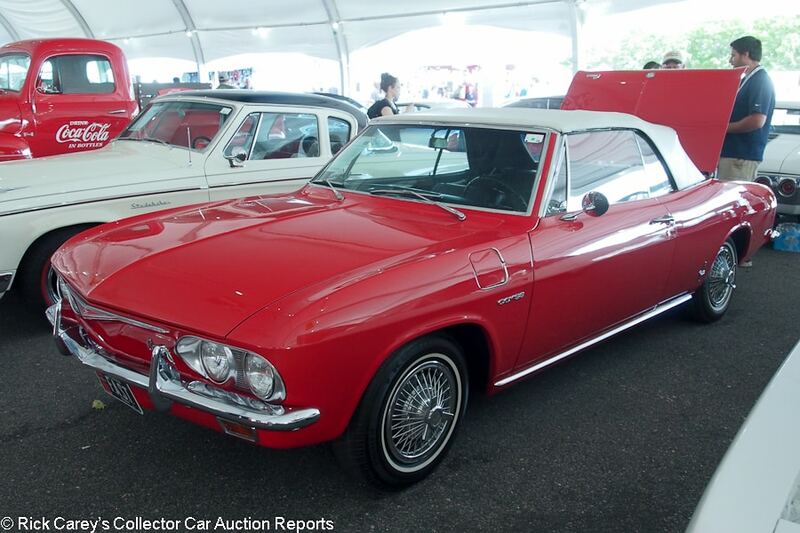 Lot # 85 1965 Chevrolet Corvair Corsa Convertible; S/N 107675W170500; Regal Red/Black vinyl; White vinyl top; Visually maintained, largely original, 3- condition; No Reserve; Hammered Sold at $21,000 plus commission of 10.00%; Final Price $23,100 – 164/180hp turbocharged, 4-speed, cassette stereo, wire wheel covers, narrow whitewalls, power top. – Quick erratically masked repaint, thin trim chrome. Sound interior. Old undercoat in the wheel wells. Oily engine compartment with an all over chassis black repaint. Battery positive lead run through a hole in the firewall with no grommet for protection. A neat car but it can be much better after some sympathetic attention. – Despite what the Hagerty Price Guide would lead readers to believe, this is an appropriate price for the condition and equipment of this Corsa convertible. 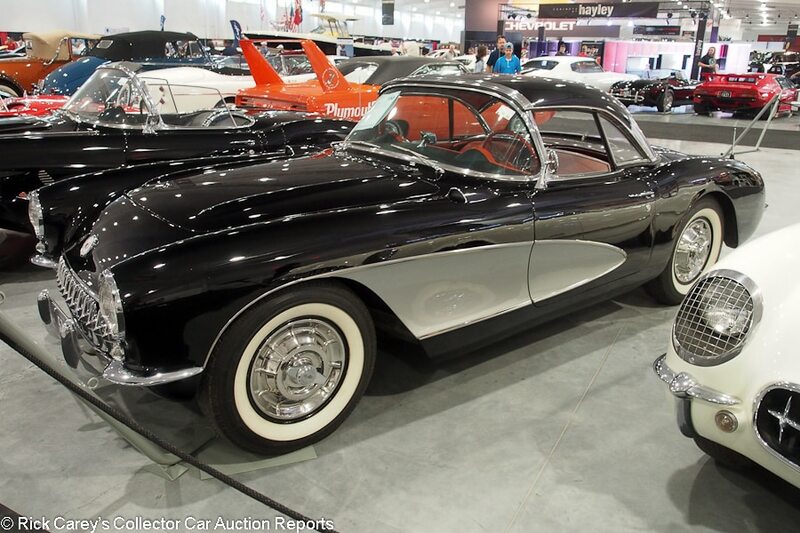 Lot # 385 1957 Chevrolet Corvette Convertible; S/N E57S101555; Black, Silver coves/Red vinyl; White vinyl top; Enthusiast restoration, 3 condition; No Reserve; Hammered Sold at $93,000 plus commission of 10.00%; Final Price $102,300 – 283/245hp dual quads, Powerglide, spinner wheel covers, whitewalls, WonderBar radio. – The car’s description says ‘complete body-off restoration.’ The car speaks of something much less. The paint appears to have been laid on over the old paint. The headlight wires are wrapped in electrical tape. The chrome is good but the top is soiled and has a small hole on the right quarter. It also doesn’t fit well. The interior is good, as are the dash and gauges but the dash knobs are scuffed. The underbody and frame have been superficially repainted assembled. It’s a driver-quality restoration that has aged, not seen particularly consistent care, and has Powerglide. – The six figures that this Corvette brought isn’t unprecedented but is generous by at least $10K and more reasonably $20K for this example’s superficial restoration and driver-quality upkeep. 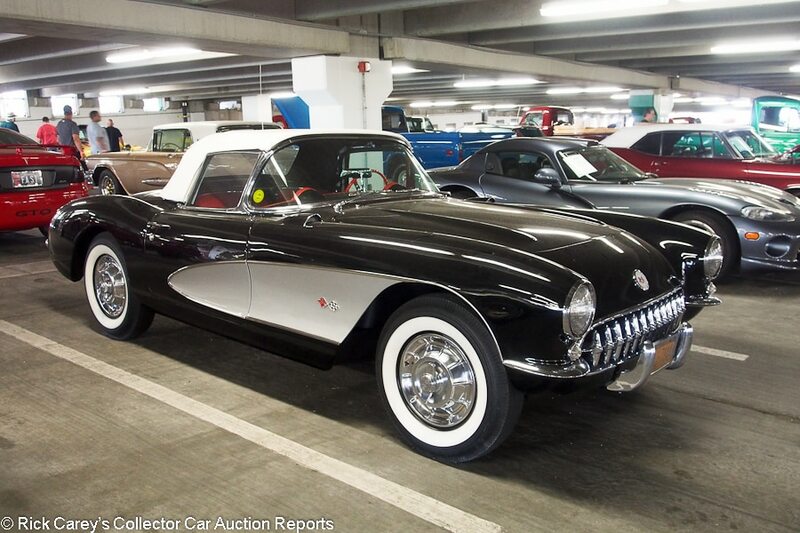 Lot # 700 1957 Chevrolet Corvette Convertible; S/N E57S104740; Engine # EH; Onyx Black, Silver coves, Black hardtop/Red vinyl; Black vinyl top; Older restoration, 3- condition; No Reserve; Hammered Sold at $53,000 plus commission of 10.00%; Final Price $58,300 – 283/245hp dual quads, 3-speed, WonderBar radio, whitewalls, two tops. – This was an NCRS Top Flight judged Corvette in 1989. It isn’t any more. The paint, chrome and interior are usable. The engine compartment is grubby, oxidized and neglected. The chassis and underbody are similar. Ashton Collection. – Sold by Russo and Steele at Monterey in 2006 for $88,000, then by Leake at Oklahoma City in 2013 for $73,700, this sadly neglected but honest ’57 with the hydraulic lifter dual quad engine brought a reasonable price for its condition and equipment in sharp contrast with several other Ashton Collection Corvettes which sold for much more that they were worth. 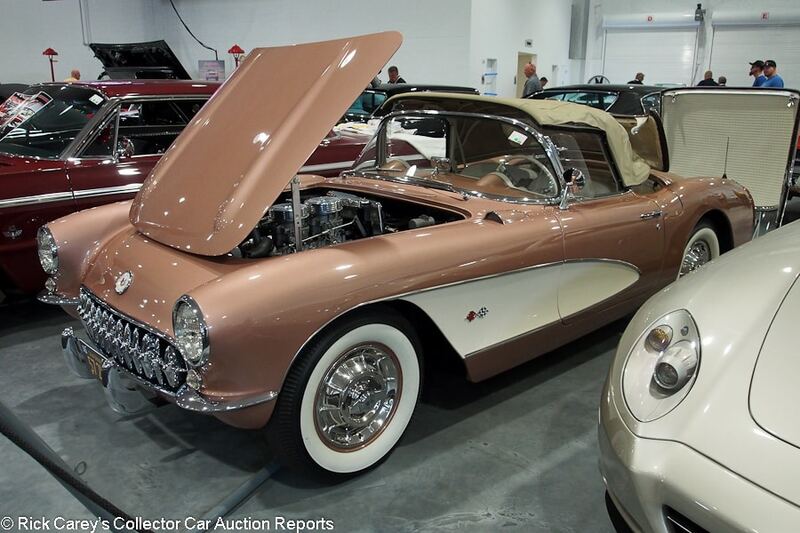 Lot # 727 1957 Chevrolet Corvette Convertible; S/N E57S104246; Aztec Copper, Beige coves, Aztec Copper hardtop/Beige leather; Beige cloth top; Modified restoration, 2- condition; No Reserve; Hammered Sold at $70,000 plus commission of 10.00%; Final Price $77,000 – 327/245hp dual quads, Muncie 4-speed, WonderBar radio, spinner wheel covers, whitewalls, two tops. – Upgraded engine and transmission with fuel residue on the intake manifold, silver painted exhaust manifolds and a little oil mist coating. Very good paint, interior, chrome and top. Restored nearly two decades ago and repainted since. Its 327 engine means it isn’t what it was originally, but it’s still a great driver. 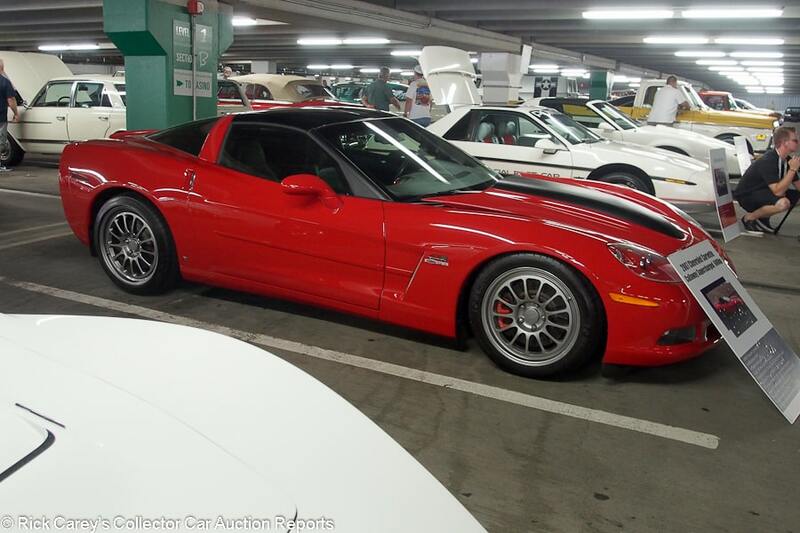 – This is a magnanimous result for a modified Corvette, even one in such good condition. It was offered essentially as seen here in 2000 at The Auction in Las Vegas where it was bid to $47,000 but not sold. This result more than makes up for that missed opportunity. 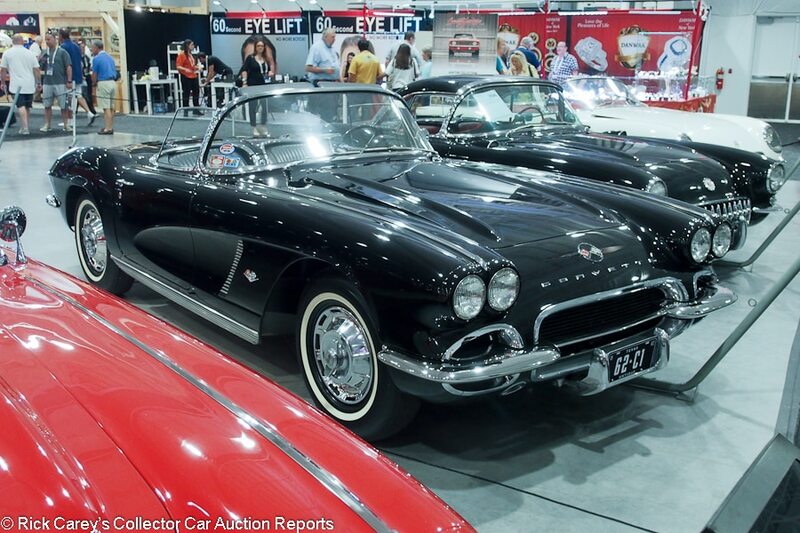 Lot # 697.1 1961 Chevrolet Corvette Convertible; S/N AZ113801; Black, Silver coves/Red vinyl; White vinyl top; Modified restoration, 3- condition; No Reserve; Hammered Sold at $65,000 plus commission of 10.00%; Final Price $71,500 – 327, dual quads, Powerglide, cassette stereo, spinner wheel covers, whitewalls. 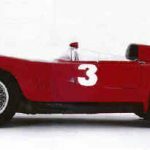 – With its 327 engine it is patently not matching numbers. Arizona assigned VIN. Tired old paint recently buffed out hurriedly and unevenly. Scratched chrome trim. Used and driven under the hood. Driven hard and put away wet. Ashton Collection. – Sold at WestWorld in 2013 for $60,500. With its neglected condition, replacement engine, Powerglide and the assigned VIN, a hammer bid of $35,000 makes much more sense than the $65,000 bid that bought it. The bidders must have been drinking the Kool-Aid. Lot # 698.1 1962 Chevrolet Corvette Convertible; S/N 20867S100317; Engine # 2100317 F0815SC; Black/Black vinyl; Black vinyl top; Older restoration, 3- condition; No Reserve; Hammered Sold at $65,000 plus commission of 10.00%; Final Price $71,500 – 327/250hp, Powerglide, WonderBar radio, spinner wheel covers, narrow whitewalls. – Sound older paint and interior. Dirty, neglected engine compartment and chassis. An old restoration that has not received much, if any, attention. Ashton Collection. – Sold at Barrett-Jackson WestWorld in 2004 for $66,960, then in 2013 for $69,300. The car card which represents it as a 3-speed when what’s in it is impossible to mistake for anything other than Powerglide is typical of the attention paid to this collection’s cars, but it brought a huge price at least 50% more than what its base engine, slushbox and neglected condition warranted. Lot # 642 1963 Chevrolet Corvette Convertible; S/N 30867S106830; Daytona Blue/Dark Blue vinyl; White vinyl top; Recent restoration, 2- condition; No Reserve; Hammered Sold at $52,000 plus commission of 10.00%; Final Price $57,200 – 327/340hp, 4-speed, 3.36 Positraction, power brakes, WonderBar radio, Spinner wheel covers, narrow whitewalls. – Not represented as the original engine or as-built. Restored in 2013 with good paint, chrome, interior and top. Crisp gauges but the painted bezels have been buffed through and the knobs are dusty. The underbody has been restored to factory appearance with some storage dust the hasn’t been cleaned up. Locked and couldn’t access the engine compartment. – Sold at Barrett-Jackson WestWorld in 2013 for $90,200, then at the B-J Las Vegas auction in 2016 for $57,200, this ’63 Corvette isn’t perfect, but it’s more than good enough and will be a delight to own and drive, particularly at this realistic price. 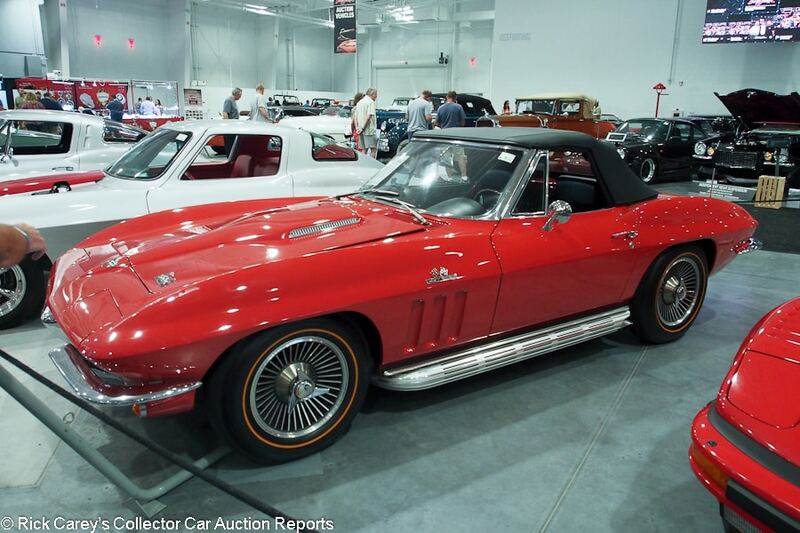 Lot # 652 1966 Chevrolet Corvette Convertible; S/N 194676S123677; Engine # T0526IL6123677; Rally Red/Black vinyl; Black vinyl top; Older restoration, 2- condition; No Reserve; Hammered Sold at $80,000 plus commission of 10.00%; Final Price $88,000 – 427/390hp, 4-speed, side pipes, air conditioning, centerlock alloy wheels, gold line tires, headrest seats, AM-FM, woodgrain steering wheel. – Excellent older paint, chrome and interior. 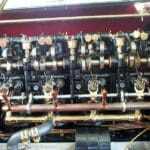 The engine compartment has been restored to showroom condition but now shows age and a little use. NCRS, Bloomington Gold and Chevy VetteFest Gold Spinner awards, restored in 2007 and still nearly impeccable. – Sold at WestWorld in 2009 nearly fresh from restoration for $139,700, then at Mecum Monterey in 2013 for $155,150 after being passed at Mecum Indy in 2012 and 2013 on widely disparate reported bids of $135,000 and $95,000. It almost seems like it’s hard for bidders to make up their minds what this nearly impeccable Corvette is worth. No one should dispute, however, that it is worth this much, even showing age under the hood. The new owner got a great car for an advantageous price. 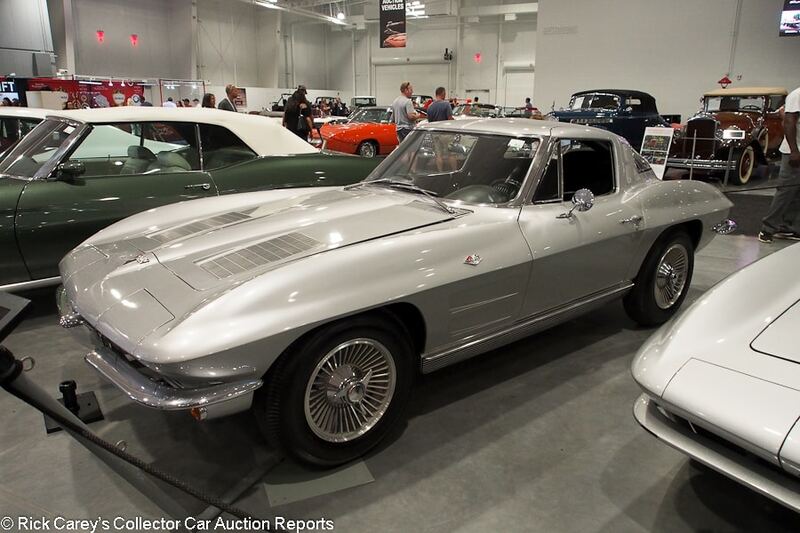 Lot # 663 1963 Chevrolet Corvette Coupe; S/N 30837S106801; Engine # 3106801 F0103RE; Silver/Black vinyl; Visually maintained, largely original, 3+ condition; No Reserve; Hammered Sold at $115,000 plus commission of 10.00%; Final Price $126,500 – 327/340hp, 4-speed, power windows, WonderBar radio, centerlock alloy wheels, 6.70-15 Firestone tires, – Represented as 22,740 miles from new and matching numbers. Decent clearcoat repaint, window pockets are loaded with bodyshop dust, window channels and body seals are old. Masking is fair. Old undercoat in the wheel wells. Old and cracking suspension bushings. Clean and orderly engine compartment. Wiper scratched windshield. Peeling right front bumper chrome. Door windows rattle. Small chip on top of the driver’s door. Decent trim chrome. A mostly original, maintained car but the repaint removes it from Preservation condition. – Sold at Kissimmee last January for $104,500, there is no reason for this ’63 Corvette with its many issues to be worth this much more five months later, but the ‘split window’ mystique is strong, along with the allure of the stated (although doubtful) low miles. This result is heady, with more reliance paid to representations than to the car’s condition. 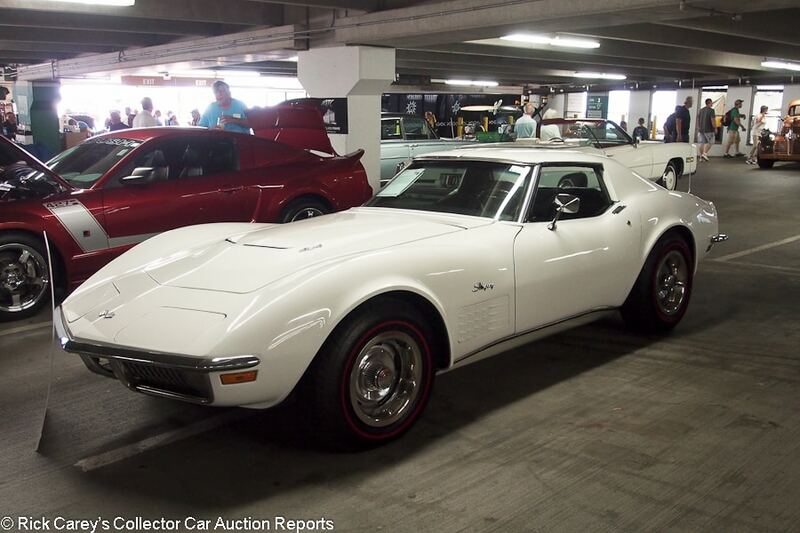 Lot # 78 1970 Chevrolet Corvette Coupe; S/N 194370S416125; White/Black; Visually maintained, largely original, 3 condition; No Reserve; Hammered Sold at $22,000 plus commission of 10.00%; Final Price $24,200 – 454/390hp, automatic, power windows, AM-FM, Rally wheels with trim rings, red line tires – Decent repaint with some fisheyes and dust flecks. Sound original interior and major chrome. Sun rotted dash top. Pitted door handles and thin rear bumper chrome. Uneven front bumper fit. Dirty dash switches and console trim. Aged underbody. Represented as 40,199 miles and matching numbers. – Sold at Mecum’s Dallas sale in 2014 for $27,540, at Kissimmee in 2015 for $23,760, and here a year ago for $20,350. The value trend is apparent, even with this minimal uptick for 2018 and this is what it’s worth. 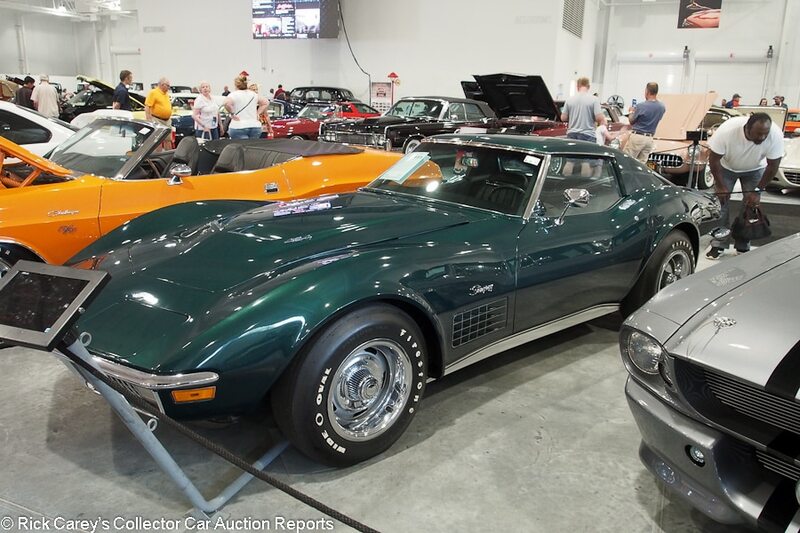 Lot # 691 1971 Chevrolet Corvette Coupe; S/N 194371S112983; Brands Hatch Green/Black vinyl; Older restoration, 2- condition; No Reserve; Hammered Sold at $98,000 plus commission of 10.00%; Final Price $107,800 – 454/425hp LS6, automatic, AM-FM, Rally wheels with trim rings, Wide Oval tires, T-tops, power windows, tilt steering column. – Restored in the early naughts, NCRS Top Flight, Bloomington Gold and represented as matching numbers. Still very good but showing its age. Good paint with a touched up scrape on the left hood edge. The engine compartment is orderly but aged. A strong Corvette with desirable credentials but the age of its restoration is starting to become obvious. 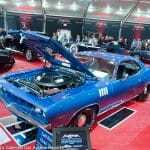 – Sold at Mecum’s Spring Classic in Indianapolis in 2011 for $89,040, it brought a strong price here at Mohegan Sun in a transaction bolstered by its abundant credentials. 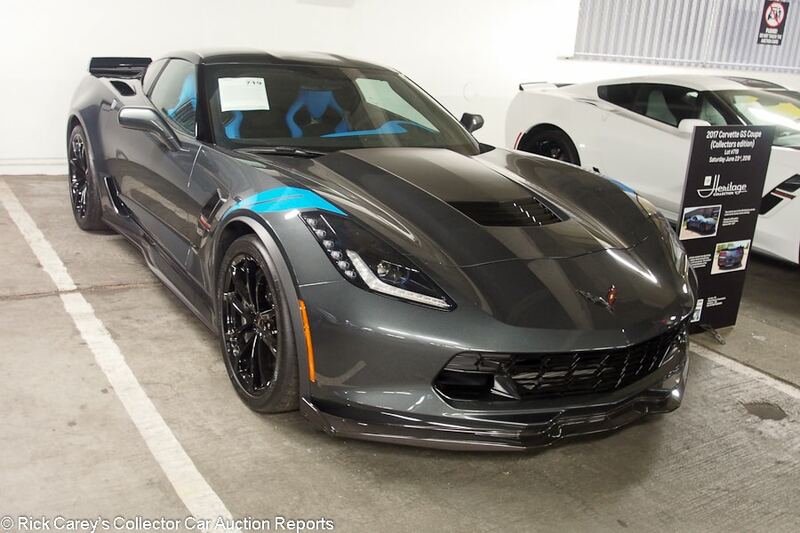 Lot # 719 2017 Chevrolet Corvette Grand Sport Coupe; S/N IG1YZ2D71H5300004; Watkins Glen Grey/Tension Blue leather, microfiber inserts; Unrestored original, 2 condition; No Reserve; Hammered Sold at $63,000 plus commission of 10.00%; Final Price $69,300 – 376/460hp LT1, 7-speed, Z07 package, heated and ventilated sport seats, leather covered instrument panel, doors and console, premium audio, heads-up display, performance data recorder, curb-view cameras, Collector Edition sill plates, carbon fiber interior trim. – From the GM Heritage Collection, 2017 early production, used by GM in events including ‘Chevy LMA Leaders’, Find New Roads, Daytona 500 in 2017. 408 miles and like new. – Loaded with comfort and trim accessories, barely used and like new, this result is a discount of nearly $20,000 from MSRP, a distinctive nearly new Corvette at an attractive price. 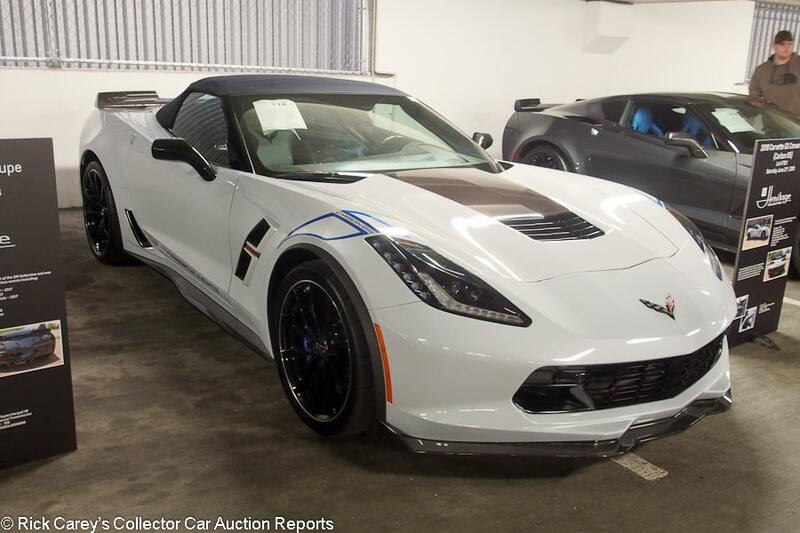 Lot # 719.1 2018 Chevrolet Corvette Grand Sport Coupe; S/N 1G1YY2D77J5000010; Arctic White, Yellow hash marks/Grey leather; Unrestored original, 2 condition; No Reserve; Hammered Sold at $65,000 plus commission of 10.00%; Final Price $71,500 – 376/460hp LT1, 8-speed paddle shift automatic, yellow calipers, heated and ventilated seats, premium audio, heads-up display, performance data recorder, curb-view front cameras, GS floor mats. – The 10th unit off the 2018 production line, GM Heritage Collection, 477 miles. Used for GM promotions including Bloomington Gold, Corvettes at Carlisle, MA Motorworks Funfest 2017. Includes a 2-day owner’s school at Spring Mountain Motor Resort, Pahrump, NV. Like new. – The described options add up to a little over $1,000 more than the final price here, not a bargain even with the 477 miles. 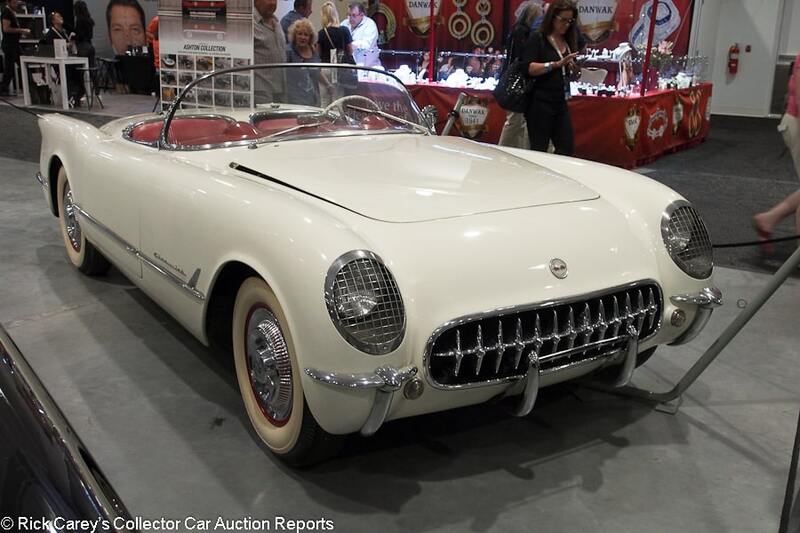 Lot # 700.1 1954 Chevrolet Corvette Roadster; S/N E54S003259; Engine # F1201BE; Polo White/Red vinyl; Beige cloth top; Visually maintained, largely original, 3- condition; No Reserve; Hammered Sold at $63,000 plus commission of 10.00%; Final Price $69,300 – 235/150hp, Powerglide, WonderBar radio, spinner wheel covers, wide whitewalls. – Alligatored old paint. Some scratched, peeling chrome trim, fair bumper and grille chrome. Decent interior. Dirty, disorganized engine compartment. A restoration project waiting to be tackled. Ashton Collection. – Sold by Mecum in Houston in 2013 for $68,900, similar optimism greeted this mostly original, undocumented, tired ’54 here at Mohegan Sun. 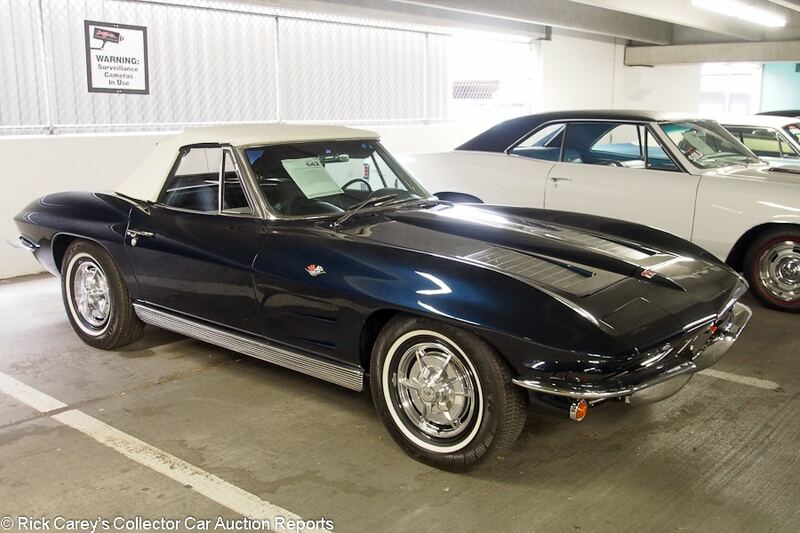 It is expensive, although not by as much as some of the other Ashton Collection Corvettes. 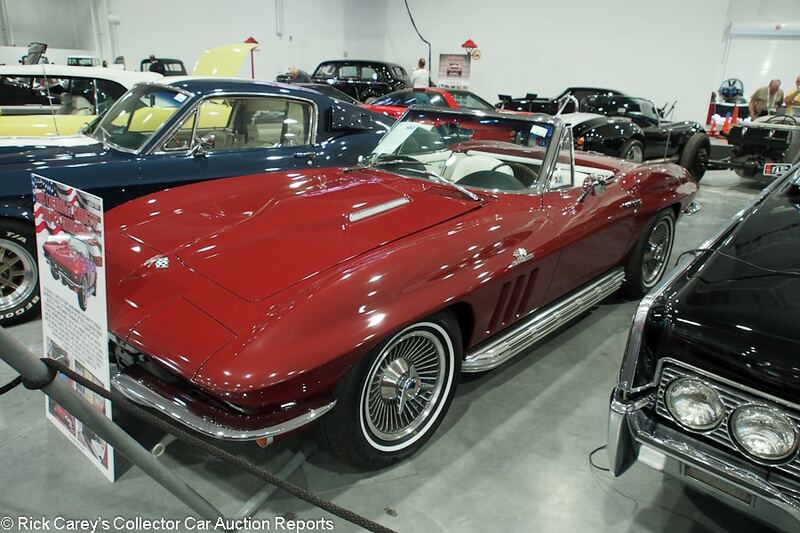 Lot # 680 1965 Chevrolet Corvette Roadster; S/N 194675S120007; Engine # T0527IF; Milano Maroon, Milano Maroon hardtop/White vinyl; White vinyl top; Older restoration, 2 condition; No Reserve; Hammered Sold at $155,000 plus commission of 10.00%; Final Price $170,500 – 396/425hp, 4-speed, AM-FM, side exhaust, alloy wheels, narrow whitewalls, teakwood steering wheel, two tops, power brakes, included are the original wheels and tires for judging. – NCRS Top Flight in 2007 and 2009. Excellent paint, interior and chrome. Clean, orderly nearly showroom engine compartment. Still capable of scoring well today. – This is an heroic NCRS Top Flight car that has been maintained in Top Flight condition for a decade, a tribute to its owners’ care and attention. 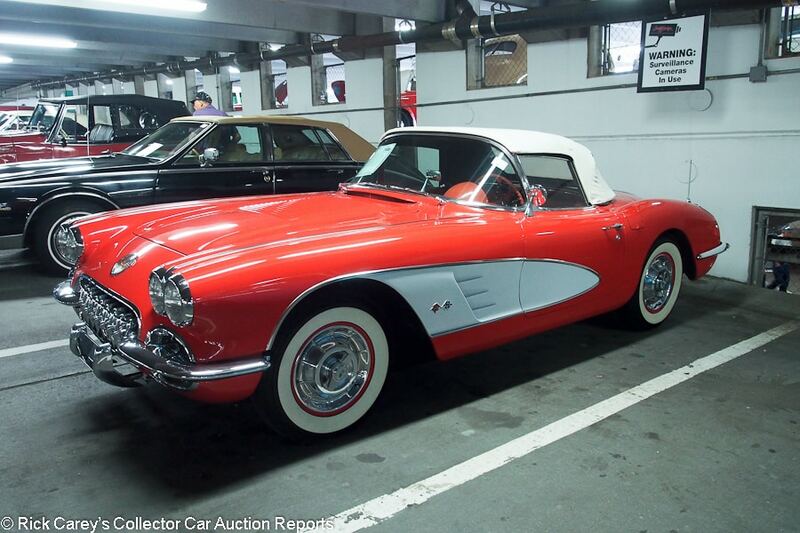 The B-J Mohegan Sun bidders rose up and accorded it a freshly restored price, and then some, a result that is even more heroic than the Corvette. 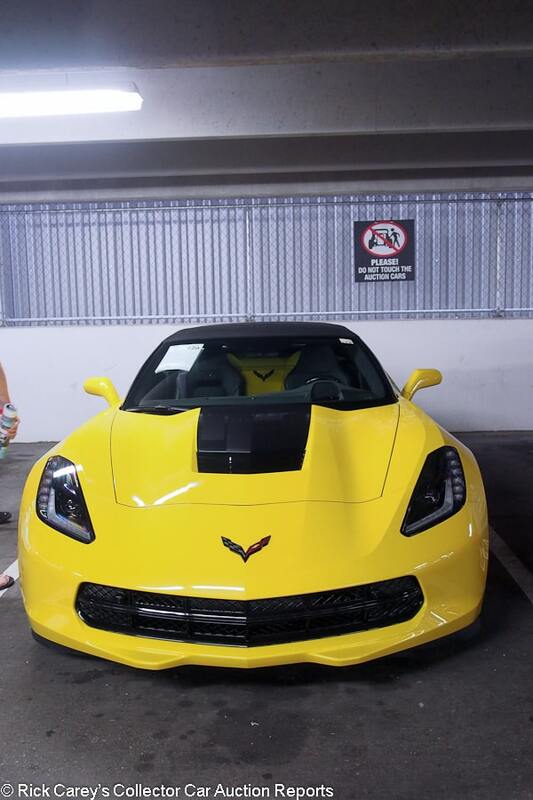 Lot # 720 2018 Chevrolet Corvette Stingray Convertible; S/N 1G1YE3D77J5000006; Yellow, Satin Black stinger/Black leather, Yellow stitching; Black top; Unrestored original, 2 condition; No Reserve; Hammered Sold at $78,000 plus commission of 10.00%; Final Price $85,800 – 376/460hp LT1, 7-speed, multi-mode exhaust, selective ride control, satin black yellow stripe wheels, power heated outside mirrors, yellow calipers, premium audio, heads-up display, performance data recorder, front curb-view cameras, carbon fiber leather wrapped instrument panel, leather interior trim. 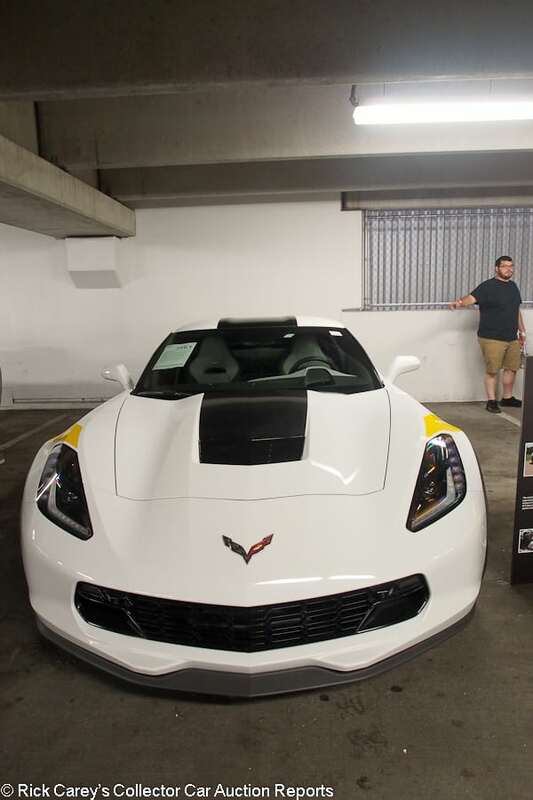 – 6th Corvette built for 2018, GM Heritage Collection, 1,440 miles. Used in GM promotions including Motor City Pride 2018, 2019 ZR1 Reveal, NHRA Nationals 2017, Atlanta Motor Show and Chevrolet Dealer Show 2018. Includes a 2-day owner’s school at Spring Mountain Motor Resort, Pahrump, NV. Like new. – This is approximately MSRP for all this equipment. Lot # 720.1 2018 Chevrolet Corvette Stingray Coupe; S/N 1G1YF2D79J5000001; Torch Red, Carbon Flash hood strip/Black leather; Unrestored original, 2 condition; No Reserve; Hammered Sold at $66,000 plus commission of 10.00%; Final Price $72,600 – 376/460hp LT1, 8-speed paddle shift automatic, performance exhaust, remote start, Carbon Flash badges, power heated outside mirrors, Z51-style red stripe wheels, heated and ventilated seats, premium audio, heads-up display, performance data recorder, front curb view cameras, leather instrument panel and interior panels. – The first 2018 Corvette off the line, GM Heritage Collection, 578 miles and like new. Displayed at Bloomington Gold, GM World Design Center 2017. Includes a 2-day owner’s school at Spring Mountain Motor Resort, Pahrump, NV. – Sold for a tiny discount from MSRP with little if any appreciation for its status as the first-built 2018 Corvette. 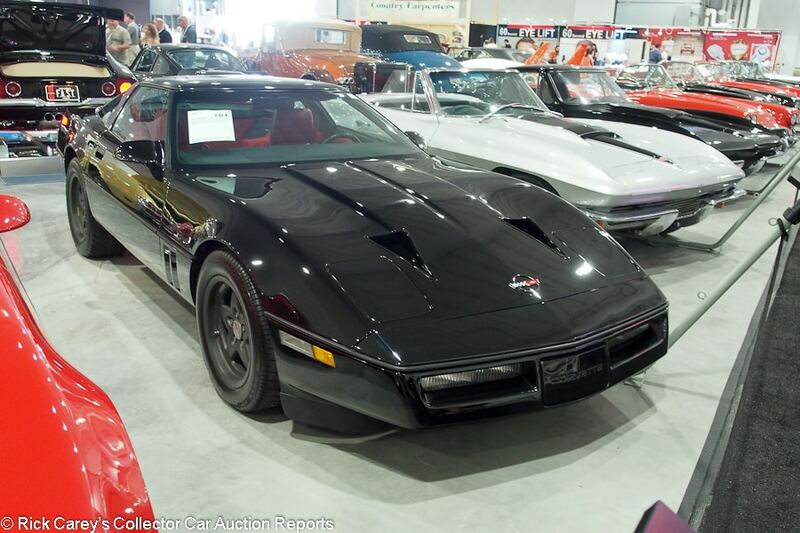 Lot # 701 1987 Chevrolet Corvette Twin Turbo Callaway Coupe; S/N 1G1YY2186H5123899; Black/Red leather; Visually maintained, largely original, 3 condition; No Reserve; Hammered Sold at $19,000 plus commission of 10.00%; Final Price $20,900 – 350/345hp twin turbo, Doug Nash 4+3, power windows, Dymag wheels, built in K40 radar detector, cassette stereo. – Good repaint over old paint. The seats are worn and surface creased. The nose is unmarked. Mileage is not stated, nor how well it runs. Ashton Collection. – The first year for the RPO B2K Callaway Twin Turbo, an important milestone in Corvette history, and it brought a price appropriate to its milestone status and the breathtaking performance of the twin turbo engine. The Doug Nash 4+3 isn’t the most driver-friendly gearbox which results in it being used mostly as a regular 4-speed with overdrive that takes full advantage of the engine’s stump-pulling torque. 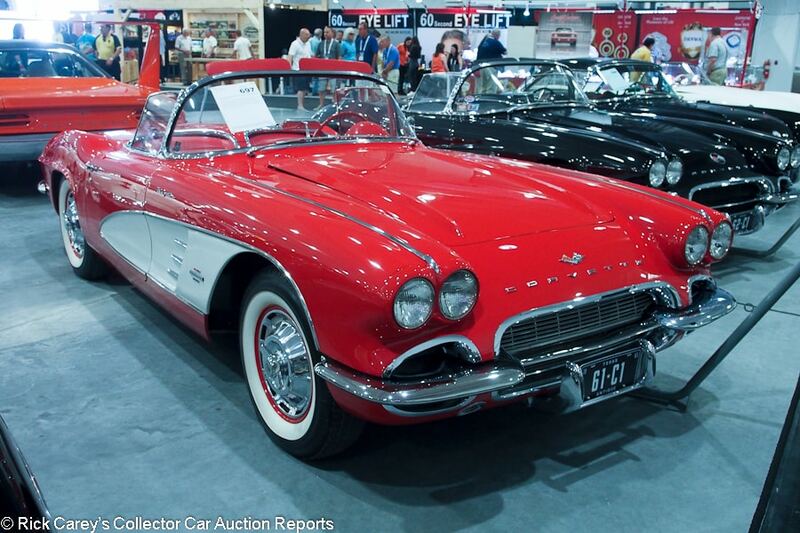 Lot # 708 1958 Chevrolet Corvette FI Convertible; S/N J58S105794; Red, White coves/Red vinyl; White vinyl top; Enthusiast restoration, 4 condition; No Reserve; Hammered Sold at $63,000 plus commission of 10.00%; Final Price $69,300 – 283/250hp fuel injection, 4-speed, spinner wheel covers, whitewalls, cassette stereo, heater. – Represented as 19,357 original miles but not as the original engine or anything else. Poor old repaint with dust inclusions, microblisters and edge chips. Paint was blown haphazardly around the hood opening. Right front fender chrome spear is loose. Both ends of the dashtop are cracked and superficially touched up. The underbody has old undercoat where it doesn’t have overspray. There is no Fuel Injection callout on the fenders. This is a car to avoid. – Reported sold here two years ago for $102,300 and bought much more reasonably this time considering its many flaws and issues, but still expensive for a car with so many issues and so little documentation. Lot # 697 1961 Chevrolet Corvette FI Convertible; S/N 10867S103188; Engine # F1116CS; Red, White coves/Red vinyl; White vinyl top; Older restoration, 3 condition; No Reserve; Hammered Sold at $80,000 plus commission of 10.00%; Final Price $88,000 – 283/315hp fuel injection, 4-speed, WonderBar radio, spinner wheel covers, whitewalls. – Good older paint that has recently been buffed out, with little attention to the margins and edges. The engine compartment is old, dry and neglected. The underbody is dusty and dry. An NCRS Top Flight in 1992, 1999 and 2000 but isn’t any more. Ashton Collection. – Sold at the Leake Dallas Fall auction in 2013 for $82,500 and changing hands here for a modest price appropriate to its neglected and aged condition. This was obviously a very good car eighteen years ago when it was judged Top Flight and its subsequent deterioration in the Ashton Collection is troubling. Lot # 682 1962 Chevrolet Corvette FI Convertible; S/N 20867S104895; Engine # 2104895 F1222RF; Roman Red/Black leather; Black cloth top; Older restoration, 2- condition; No Reserve; Hammered Sold at $70,000 plus commission of 10.00%; Final Price $77,000 – 327/360hp fuel injection, 4-speed, WonderBar radio, spinner wheel covers, narrow whitewalls, 3.73 Positraction. – Represented as the matching numbers engine. Very good paint, chrome and interior. Some of the bright trim is lightly scuffed. The engine compartment is orderly but not fresh and has some odd finishes. The underbody was done like new and also shows some age. Not pristine but more than good enough to be driven and shown with pride. – There’s a telling term on the car card: ‘Accident-free since completion of the restoration.’ But not accident-free before restoration? It was sold at WestWorld in 2005 for $99,360 and at Auburn Fall in 2015 for $79,750 and seems to be on a tapering-off trend as it ages with this realistic result. Lot # 718.1 2018 Chevrolet Corvette Grand Sport Carbon 65 Edition Convertible; S/N 1G1Y13D70J5000005; Ceramic Matrix Grey Metallic, Carbon fiber hood insert/Black leather, microfiber inserts; Black top; Unrestored original, 2 condition; No Reserve; Hammered Sold at $75,000 plus commission of 10.00%; Final Price $82,500 – 6.2/460hp LT1, 8-speed paddle shift automatic, carbon fiber hood insert, machine-grooved alloy wheels, carbon fiber spoiler, blue calipers, carbon painted outside mirrors, heated and ventilated seats, premium audio, heads-up display, data recorder, curb-view cameras, carbon fiber instrument panel, Grand Sport Carbon 65 badging. – From the GM Heritage collection, 1,529 miles, used for GM events including Bloomington Gold, Sturgis Bike Week, NHRA Nationals and Rolex 24 in 2017. 2-day owner’s school at Spring Mountain Motor Resort, Pahrump, NV included. – The result here is to all intents and purposes the MSRP on this exhaustive selection of features and options but it does bear unique and very obvious graphics. 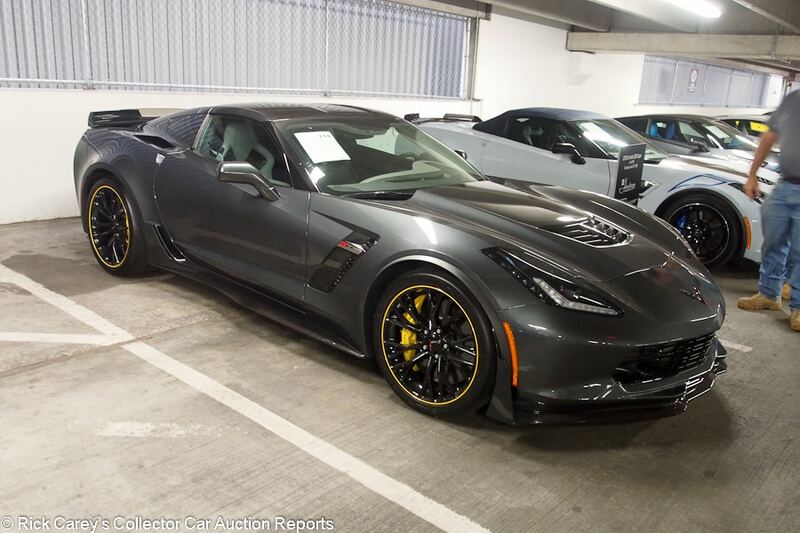 Lot # 718 2018 Chevrolet Corvette Z06 Coupe; S/N 1G1YT2D63J5500008; Watkins Glen Grey/Black leather, Microfiber inserts; Unrestored original, 2 condition; No Reserve; Hammered Sold at $85,000 plus commission of 10.00%; Final Price $93,500 – 376 (6.2)/650hp LT4, 7-speed, Z07 Package of Brembo ceramic brakes, Pilot Sport Cup tires and Z07 suspension, ground effects, yellow calipers, black wheels, power heated outside mirrors, premium audio, leather instrument panel, performance data recorder, curb-view cameras, heated/ventilated seats. 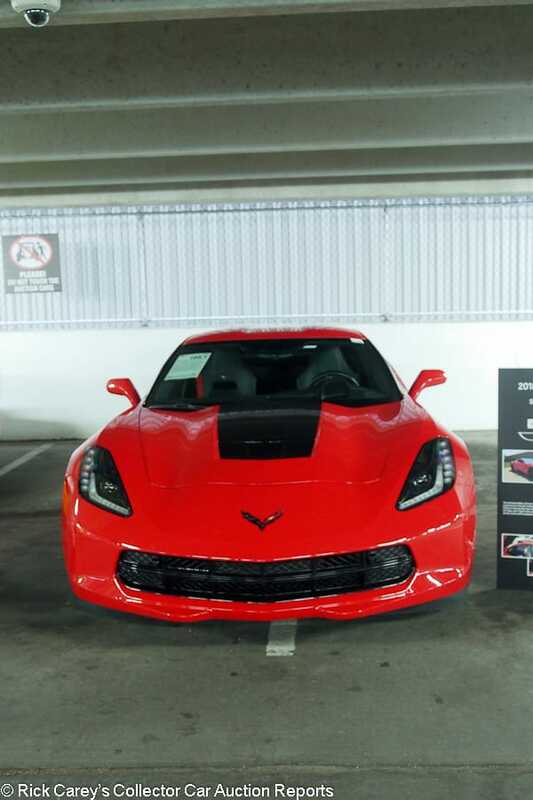 – From the GM Heritage Collection, the 8th Corvette built for 2018, used by GM for display and promotion including Bloomington Gold 2017, Corvettes at Carlisle, ZR1 Media Drive and more. 785 miles from new and like new, includes 2-day owner’s school at Spring Mountain Motor Resort, Pahrump NV. – This is to all intents and purposes a small discount from the sticker price for this loaded up Corvette. 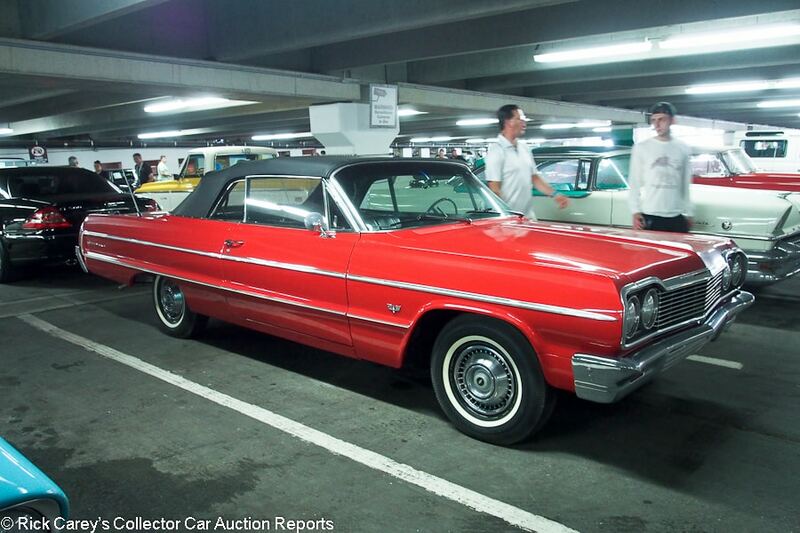 Lot # 96 1964 Chevrolet Impala Convertible; S/N 41867T220176; Red/Black vinyl; Black vinyl top; Cosmetic restoration, 3 condition; No Reserve; Hammered Sold at $32,000 plus commission of 10.00%; Final Price $35,200 – 283/195hp, Powerglide, wheel covers, narrow whitewalls, dual rear antennas. – Decent older repaint, sound chrome, interior and top. Clean repainted underbody. A presentable driver. – There were plenty of shiny, clean cars with endorphin-spinning drivetrains at B-J Northeast this year and this Impala wasn’t one of them, the type of car a Chevy dealer specified to spiff up the dealership’s front row with something flashy yet inexpensive. It brought a superior price for what it is and would have been more reasonably bought at $22,000 instead of $32,000. 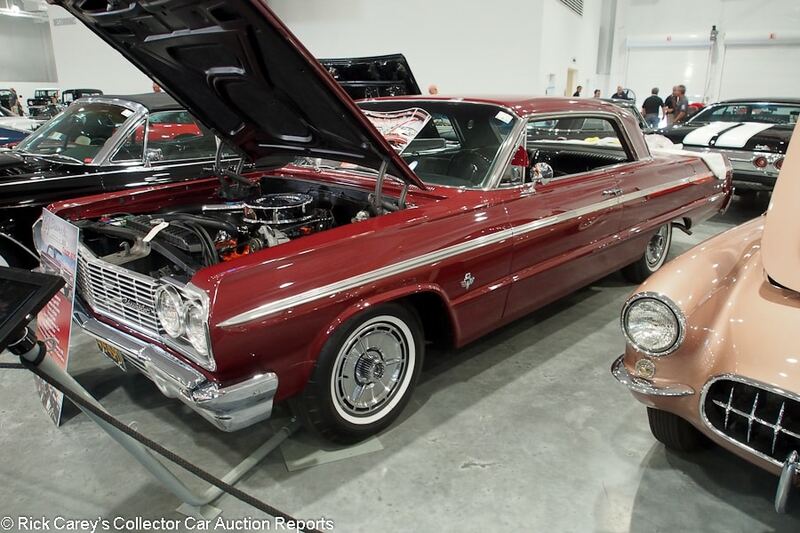 Lot # 736 1964 Chevrolet Impala SS 409 2-Dr. Hardtop; S/N 41447L121052; Engine # T1001QG; Palomar Red/Black vinyl; Older restoration, 2- condition; No Reserve; Hammered Sold at $57,000 plus commission of 10.00%; Final Price $62,700 – 409/340hp, 4-speed, buckets and console, pushbutton radio, wheel covers, narrow whitewalls, rear antenna, dash-mounted tach. – Good, lightly aged older paint. Good panel gaps. Good, mostly restored interior. Very clean and lightly used underneath. Very good engine compartment shows only a little age and some use. Body-off restored in 2010 and done professionally, but not to meticulous standards and it’s been lightly enjoyed over the past few years. Represented as the numbers matching engine but the QG suffix indicates it was originally driving a Powerglide slushbox. – Sold by Worldwide in Scottsdale five months ago for $44,000, a bargain but one that is somewhat ameliorated by subsequent work to remedy some of its fit and finish shortcomings in Scottsdale. The result here at Mohegan Sun is fair for both the buyer and the seller who took pains to present it to advantage. 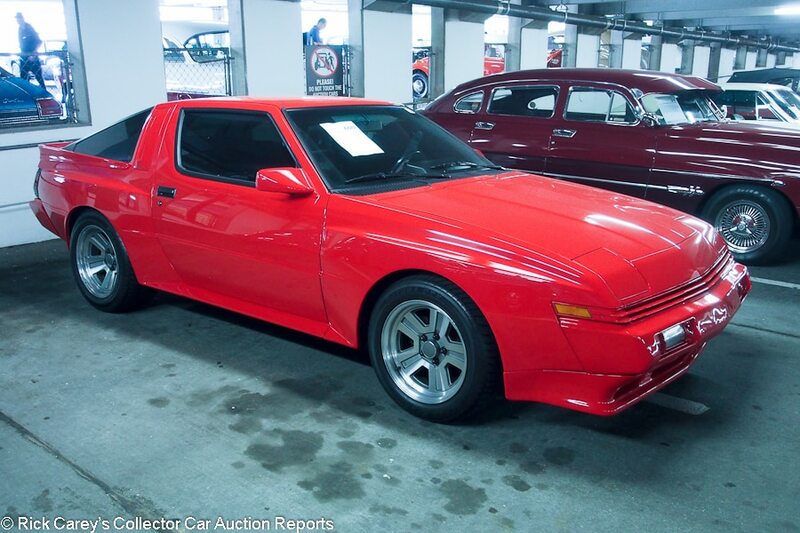 Lot # 600 1989 Chrysler Conquest TSI Coupe; S/N JJ3CC54N9KZ015004; Red/Black leather; Visually maintained, largely original, 3 condition; No Reserve; Hammered Sold at $9,000 plus commission of 10.00%; Final Price $9,900 – 2.6/176hp intercooled turbo four, alloy wheels, 5-speed, cassette stereo, air conditioning, power windows. – Good repaint over old paint. Good lightly worn and stretched original upholstery with one seam loose in the middle of the driver’s seat cushion. The underbody is original. Claimed to be 68,830 miles from new and looks like it. – A rebadged rear wheel drive Mitsubishi Starion, one of several similar 80’s imports this week at B-J Northeast, it’s a sound, mostly original car but looking for parts for it makes owning an RX7 seem simple. The new owner follows a poorly defined path fraught with mysterious diversions trying to keep this impressively powerful little rocket going. 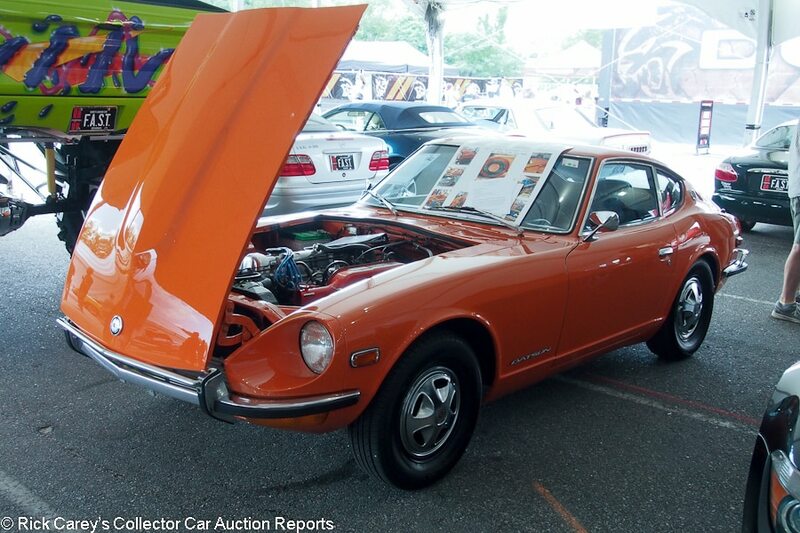 Lot # 142 1972 Datsun 240Z Coupe; S/N HLS3059760; Orange/Black vinyl; Enthusiast restoration, 3+ condition; No Reserve; Hammered Sold at $30,000 plus commission of 10.00%; Final Price $33,000 – 5-speed, Kenwood CD stereo, wheel covers, Yokohama tires. – Good repaint, otherwise original and tired including the engine compartment paint. Engine has been out and re-sealed (not ‘rebuilt’), 280Z 5-speed, new struts and tires. Everything else is old and corroded. The interior and gauges are original and good. Stated to be 82,388 miles from new. A lot of attention was paid to the mechanical work, but the cosmetics were not the ‘full restoration’ represented on its car card. – A sound 240Z given a new lease on life with attention to many mechanical things that will make it a satisfying driver, but this is not a ‘full restoration’ as represented by the seller. It promises to be a good driver, but no one will ever mistake this for a ‘full restoration.’ It brought a strong price, only a few thousand dollars on the side of generous. 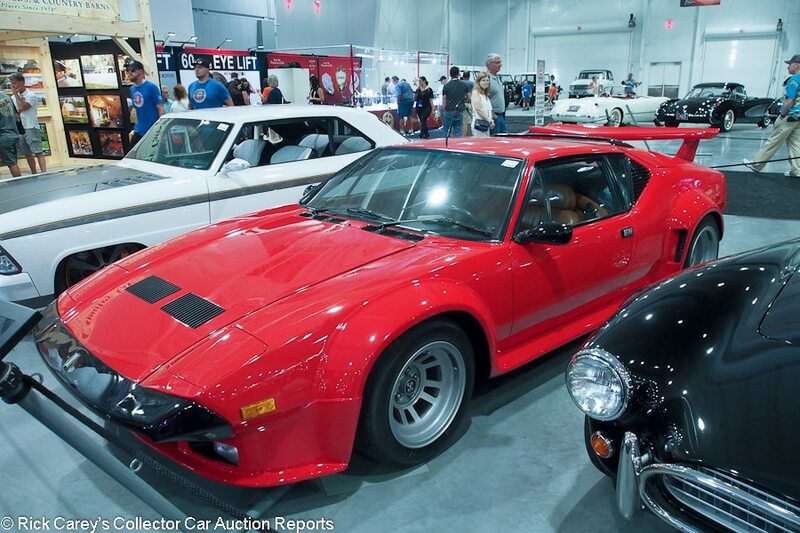 Lot # 684 1984 De Tomaso Pantera GT-5 Coupe; S/N THPNBM09294; Red/Tan leather; Visually maintained, largely original, 3 condition; No Reserve; Hammered Sold at $125,000 plus commission of 10.00%; Final Price $137,500 – Wing, flares, wide alloy wheels, Pirelli P7 tires, modern stereo. – Represented as 60,699 km from new. Auction repaint, erratically detailed and masked. Sound but aged original interior. Bits painted high gloss black where they should be matte. Original undercoat has been repainted. – De Tomaso tried to keep the Pantera alive by dressing it up with flares, wing, spoilers and wide wheels and tires in the GTS and GT-5, with production continuing into 1984. They were imported to the U.S. and federalized by Panteramerica and Stauffer Classics. This is a Canadian-delivery model, probably happily free of U.S. bumpers and smog devices and delivering the full 350 horsepower of the European versions. Its fresh, superficial, cosmetics are not encouraging but it brought a generous price on the strength of its Canadian origins and rarity, if not the good taste of its add-ons. 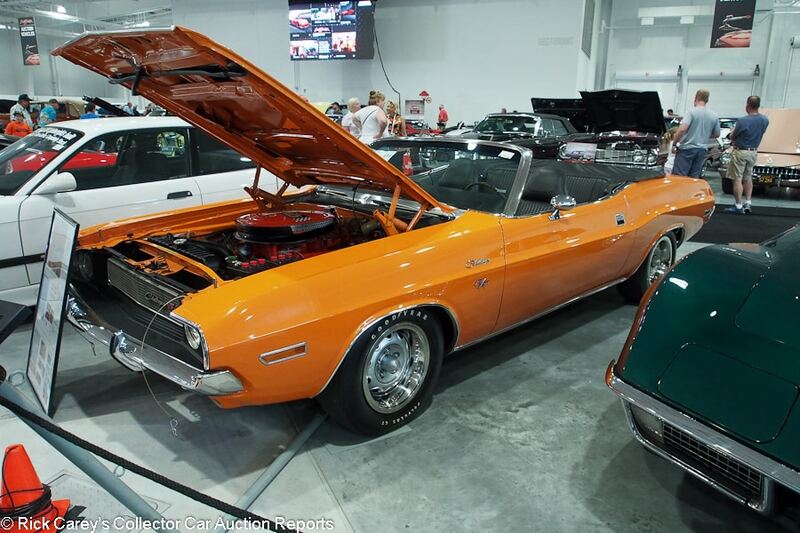 Lot # 673 1970 Dodge Challenger R/T SE Convertible; S/N JS27V0B203932; Go Mango/Black leather; Black vinyl top; Recent restoration, 2+ condition; With Reserve; Not sold at Hammer bid of $130,000 plus commission of; Final Price $130,000 – 440/390hp Six Pack, 4-speed, 8-track stereo, Rallye wheels, Polyglas GT tires, power steering and brakes, hood pins, Trac Pac. – Represented as matching numbers. Restored to showroom condition with better cosmetics. Seats are lightly stretched and surface creased like leather should be. The engine compartment is like new and clean as a whistle. As good as it gets. – Sold for $159,500 at WestWorld in 2016 with 18 fewer miles showing on its odometer, passed at Mecum Kissimmee in 2017 on a reported bid of $190,000, a mistake if there was money anywhere in the building at near that bid. One of just six cars at B-J Northeast with reserves, it would have been tragic if it had changed hands at this bid, but this is a No Reserve auction and bidders shy away from getting enthusiastic on the few cars with reserves. There’s so much else from which to choose. 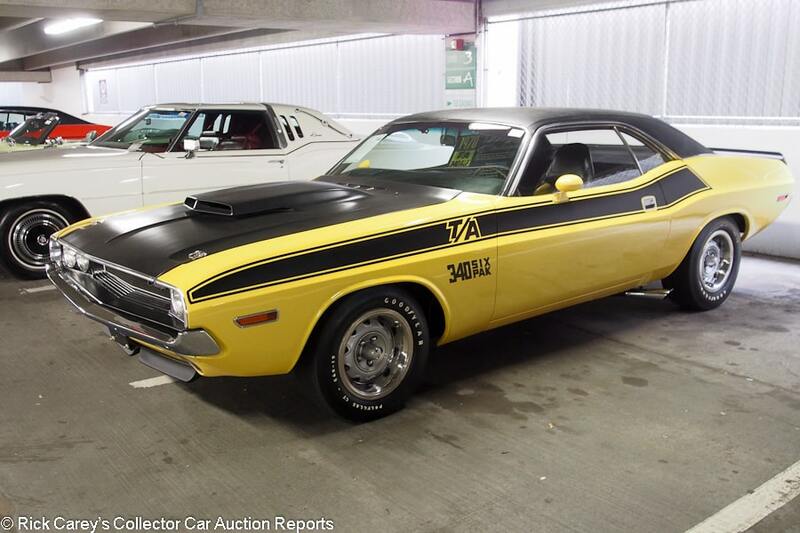 Lot # 740 1970 Dodge Challenger T/A 2-Dr. Hardtop; S/N JH23J0B291213; Banana Yellow, Matte Black hood, Black vinyl roof/Black vinyl; Older restoration, 3+ condition; No Reserve; Hammered Sold at $66,000 plus commission of 10.00%; Final Price $72,600 – 340/290hp Six Pack, automatic, 3.90 Sure-Grip, power steering, power brakes, factory tach, fiberglass scoop hood, Rallye wheels with trim rings, E60-15 Polyglas GT tires, side exit exhaust, woodgrain steering wheel and interior trim, broadcast sheet documented. – Bowed fiberglass hood. Even gaps and flush panel fits. Good paint with some light texture and small ripples along some panel edges. Very good gauges and interior woodgrain but nicked and scratched shift quadrant. Restored underbody with light age and use. Restored, driven carefully and well-maintained. – Sold at B-J Las Vegas in 2015 for $40,700, at WestWorld in 2016 for $59,400, and again at Las Vegas last October for $71,500. It’s not the best restoration in the world, but it’s more than good enough for the new owner to hold his or her head high in almost every situation, including the price. 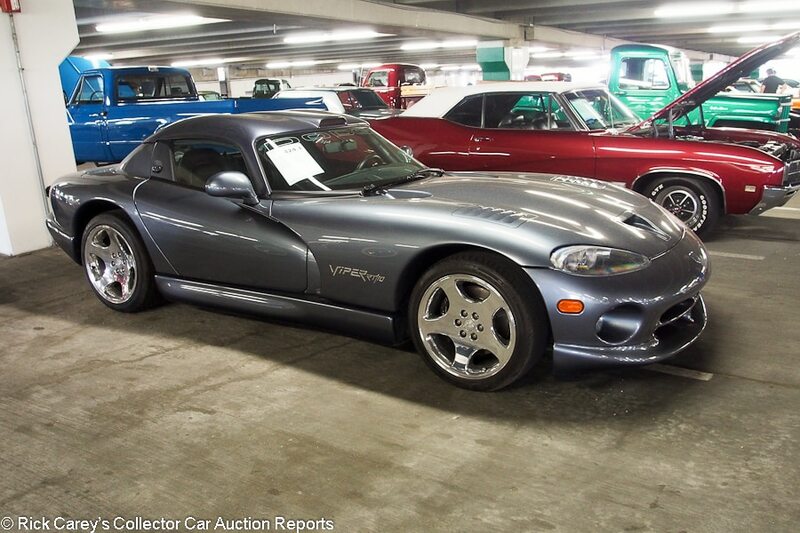 Lot # 424.1 2000 Dodge Viper RT/10 Convertible; S/N 1B3ER65E4YV602628; Metallic Grey/Black leather; Unrestored original, 2 condition; No Reserve; Hammered Sold at $36,500 plus commission of 10.00%; Final Price $40,150 – 6-speed, air conditioning, CD stereo, chrome wheels, Michelin tires, Borla exhaust. – Clean and nearly like new with 5,559 miles. – This Viper is modestly inexpensive, especially in its one-year-only grey, and could have brought another $10,000 without unduly abusing the new owner’s pocketbook. 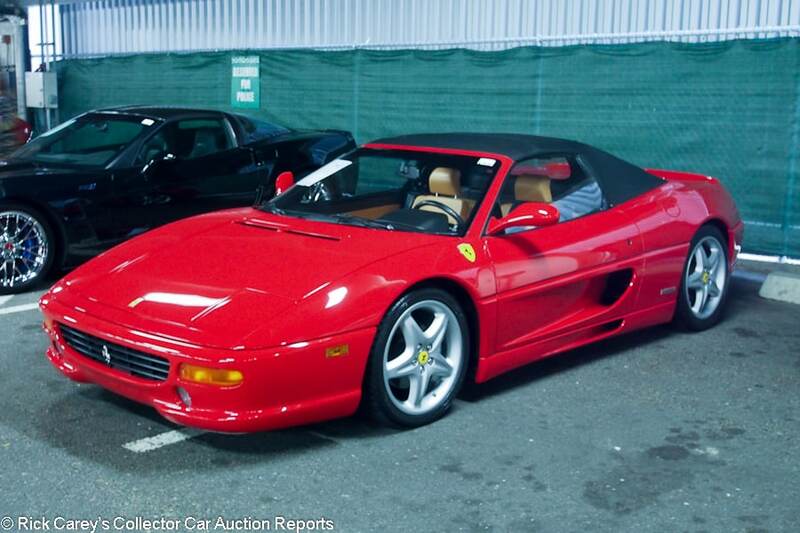 Lot # 743.1 1998 Ferrari 355 Spider Convertible; S/N ZFFXR48A8W0112810; Red/Tan leather; Black cloth top; Unrestored original, 3 condition; No Reserve; Hammered Sold at $53,000 plus commission of 10.00%; Final Price $58,300 – F1 gearbox, factory cassette stereo, air conditioning, factory alloy wheels with Bridgestone tires, SF shields, Tubi exhaust. – Represented as 23,841 miles. Sound original paint with a few nicks and scuffs. Good interior. Clean CarFax but no service history described. Used but not neglected. – This is a fair price, but one hedged toward the seller who couldn’t be bothered to provide a service history, a crucial element in these timing belt Ferraris. The new owner took a bit of a risk and shouldn’t delay in taking it to a specialist for a thorough inspection. If a belt service is in order its cost will make this an expensive indulgence. Lot # 686 2010 Ferrari 458 Italia Coupe; S/N ZFF67NFA9A0174638; Red, Matte Black roof/Beige, Black leather; Unrestored original, 2- condition; No Reserve; Hammered Sold at $155,000 plus commission of 10.00%; Final Price $170,500 – SF shields, carbon fiber interior trim, matte Black Vosse 21-inch wheels, Pirelli tires, F1 gearbox. – 18,830 miles. Lightly scuffed driver’s seatback bolster and shrinking dashtop cover. Good paint with some spots on the nose and a small chip on the edge of the front deck. – Another wholesale result for a Ferrari at B-J Northeast where late model exotics didn’t seem to do as well as they might have anticipated in the prosperous northeast. This is a sound value for the new owner. 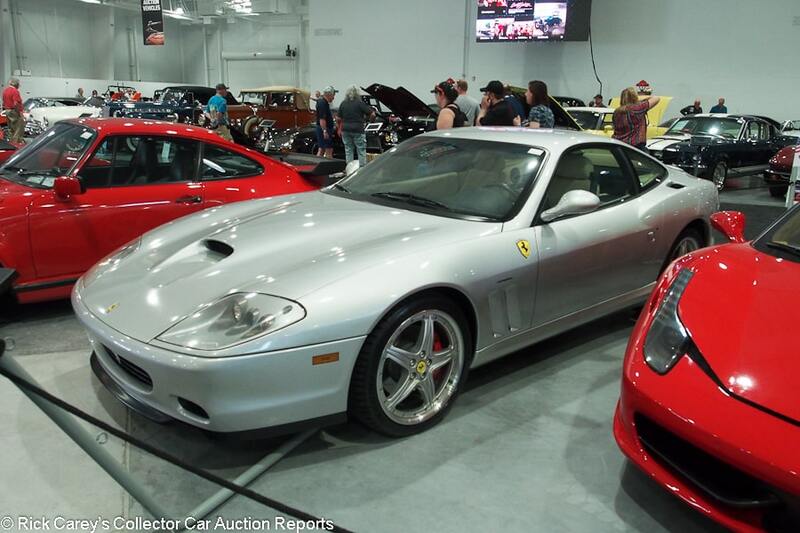 Lot # 683 2003 Ferrari 575M Maranello Coupe; S/N ZFFBV55A630133408; Argento/Parchment leather; Unrestored original, 2- condition; No Reserve; Hammered Sold at $72,000 plus commission of 10.00%; Final Price $79,200 – F1 gearbox, aftermarket wheels, Michelin tires, SF shields, factory books, tools, keys. – Chipguarded nose, lightly worn driver’s seat. sun rotted dashtop. Otherwise like new and represented as 8,912 miles. – Advertisers in Ferrari Market Letter are going to be seriously disappointed with this public sale result when they’re offering similar cars at $125,000. Reality bites. 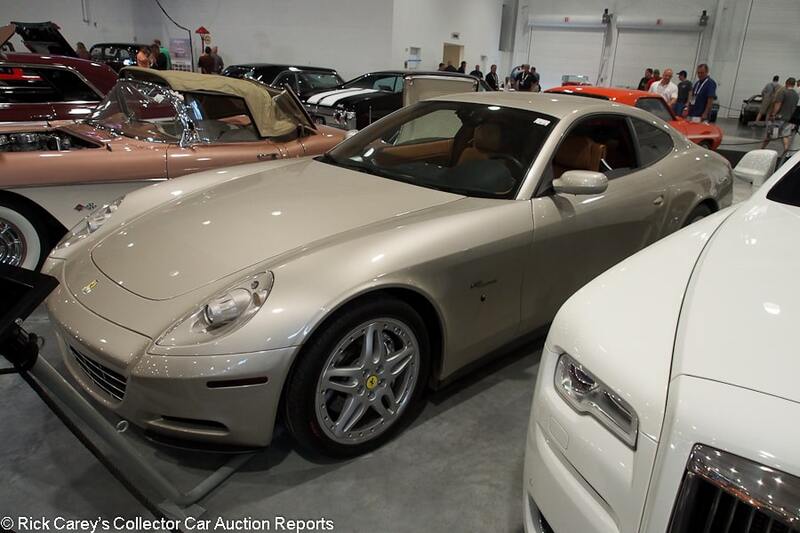 Lot # 675 2005 Ferrari 612 Scaglietti Coupe; S/N ZFFAA54A450141308; Grigio Ingrid/Tan leather; Unrestored original, 2 condition; No Reserve; Hammered Sold at $68,000 plus commission of 10.00%; Final Price $74,800 – Paddle shift, Daytona seats, Bordeaux bars, diamond-stitched leather headliner, modular performance wheels, PZero tires. – Owned by Ferrari from 2005-09, 20,600 miles. Very good original paint and interior with spots on the passenger’s seat cushion. Offered with ‘extensive service history’ but not detailed. – This is a wholesale result although the 20,600 miles, Ferrari demo history and spots on the seat suggest it was lent to favored journalists to be abused and the light blonde color is perhaps of limited appeal. Nevertheless it is a good value at this price. 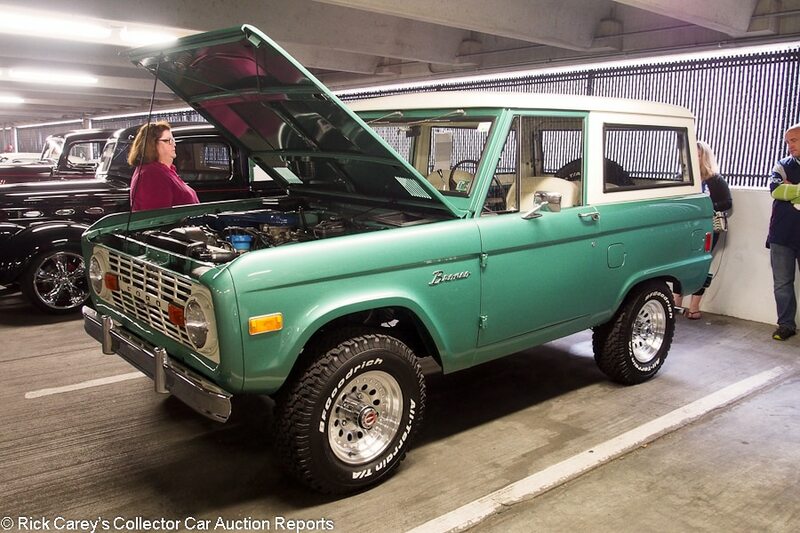 Lot # 721 1977 Ford Bronco Utility; S/N U15GLX92817; Metallic Green, White roof/White vinyl; Recent restoration, 2- condition; No Reserve; Hammered Sold at $53,000 plus commission of 10.00%; Final Price $58,300 – 302/205hp, automatic, power steering, American Racing modular alloy wheels, All-Terrain T/A tires, lift off roof, headers, 2-row seating, Echlin ignition module, chrome bumpers, original window sticker documented. – Represented as 45,028 miles. Very good paint, chrome and interior. The frame and suspension are in nearly showroom condition. The engine compartment is nearly like new condition except for some odd oversights like an old fuel stained carburetor and linkage and faded and stained label on the valve cover. Panel fits are unusually good for a Bronco and the window grommets are either new or unusually well-preserved. A vehicle that, contrary to most Broncos, hasn’t been abused and has been treated to a fairly thorough restoration with a few shortcuts. – A remarkably good, orderly, example of the first-year Bronco desirably equipped with the V8 and lift-off roof. Its price reflects its quality and rarity with a generous result that highlights how much demand for early Broncos has taken off. 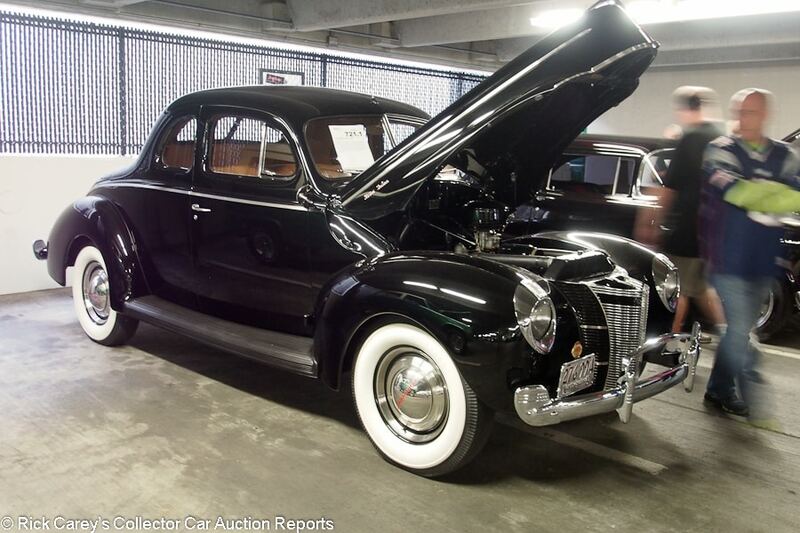 Lot # 721.1 1940 Ford Deluxe Coupe; S/N 185714888; Black/Saddle leather; Older restoration, 2 condition; No Reserve; Hammered Sold at $38,000 plus commission of 10.00%; Final Price $41,800 – Radio, clock, no heater, wide hubcaps and trim rings, wide whitewall tires, dual outside mirrors. – Cracked steering wheel hub. AACA Senior Award winner. A little dusty from storage and a few light scratches, probably from the auction preview, but otherwise impeccable. – After a spate of late model GM Heritage Corvettes this impeccably restored and maintained ’40 Ford was a welcome change of pace and the bidders responded with a generous but responsible price for it. 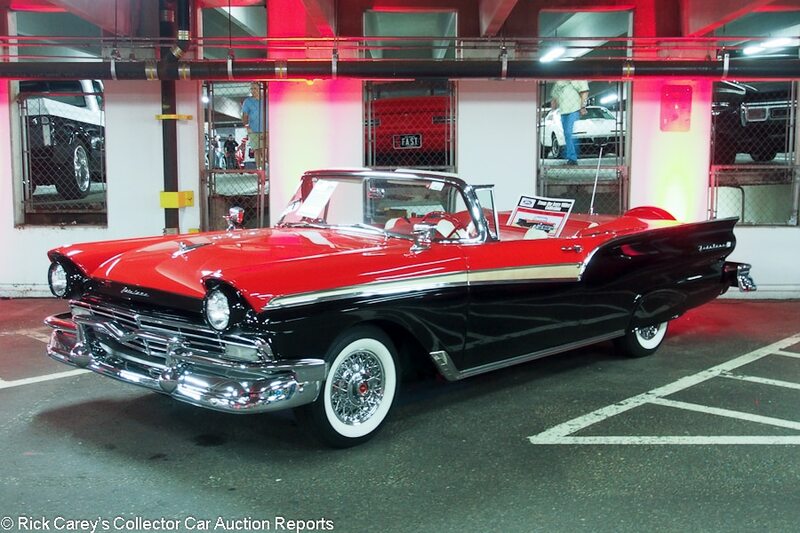 Lot # 377 1957 Ford Fairlane Sunliner Convertible; S/N D7KC137439; Flame Red, Raven Black/Red, White vinyl; Black cloth top; Older restoration, 2- condition; No Reserve; Hammered Sold at $100,000 plus commission of 10.00%; Final Price $110,000 – 312/245hp, automatic, power steering, power seat and windows, V-bar grille guard, skirts, chrome wire wheels, wide whitewalls, pushbutton radio, skirts, continental kit. – Sound repaint applied to an assembled body with some masking misses. Sound chrome but the left side top boot molding was replated over unfilled small pits and the fin rear trim chrome is thin. The engine, chassis and suspension were restored like new but now are aged, lightly oil misted and a little grimy. Showy, but not showable. – Reported sold at Mecum’s Houston auction in April 2015 for $86,400, it attracted a bid of only $60,000 at the GAA auction in March but fully captivated the attention of the bidders here at Mohegan Sun with this rather stunning price. It’s a very good example but this much money should have bought a flawless one, and it isn’t flawless. Lot # 121 1930 Ford Model A Pickup; S/N A4138752; Pine Green, Black fenders/Black leatherette; Older restoration, 3+ condition; No Reserve; Hammered Sold at $18,000 plus commission of 10.00%; Final Price $19,800 – Black wire wheels, oak bed floor and sideboards, dual taillights, alternator, windshield visor, chrome front bumper. – Sound older paint, chrome and interior. There is some dust in the paint and it has recently been buffed out with consistent misses along body accents after being neglected and allowed to dull. The engine and chassis were restored, then driven. Some cleanup products, water, polishing compound and elbow grease will make it a lot better. – Offered by Auctions America at Ft. Lauderdale in 2014 with a reported high bid of $22,000, then sold at the same venue in 2016 for a generous $33,550. It missed the mark here, by a wide margin, and is a bargain. 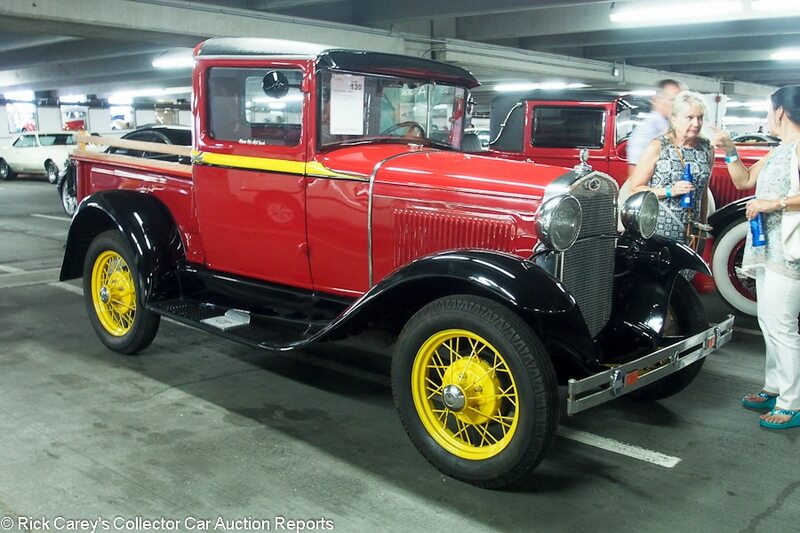 Lot # 130 1930 Ford Model A Pickup; S/N A1506823; Red, Black fenders, Yellow accent and wire wheels/Black, Red vinyl; Older restoration, 3 condition; No Reserve; Hammered Sold at $21,500 plus commission of 10.00%; Final Price $23,650 – Single sidemount, windshield visor, radiator stoneguard, oak bed sideboards, running board step plates, turn signals. – Fresh paint, new interior and new wood bed floor and sideboards. The rest of the truck is old and dirty from a long ago restoration and more than a few miles since the restoration was done. Its odometer shows 5,821 miles and if this is the mileage since restoration they were not easy on the pickup. 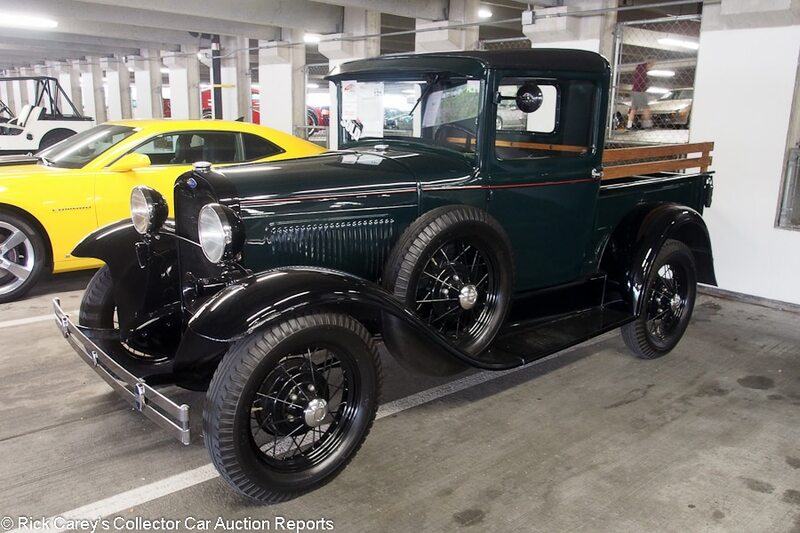 – The one that crossed the block earlier (#121) was a marginally better Model A pickup. It wasn’t painted bright red with canary yellow wheels and sold for materially less than this one. It didn’t pay to wait. 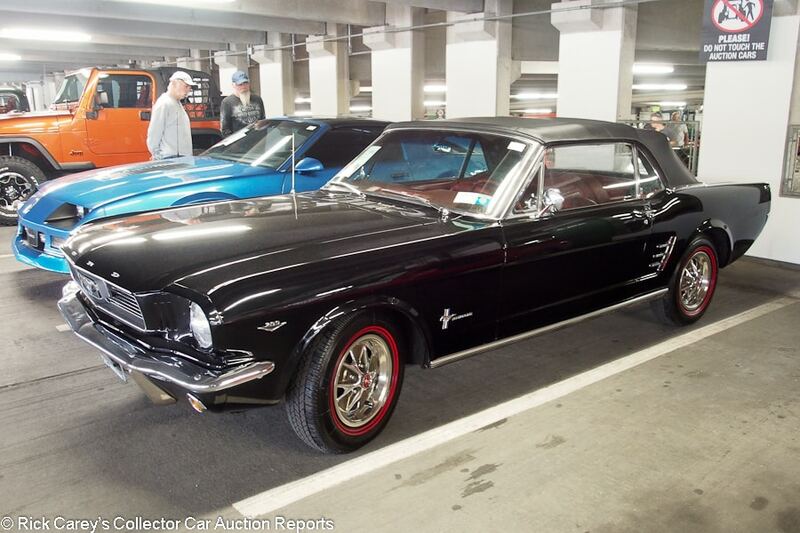 Lot # 155 1966 Ford Mustang Convertible; S/N 6T08C134819; Black/Burgundy vinyl; Black vinyl top; Visually maintained, largely original, 3- condition; No Reserve; Hammered Sold at $29,000 plus commission of 10.00%; Final Price $31,900 – 289/200hp, automatic, pushbutton radio, Magnum wheels, dual red line tires, gauges. – Sound repaint and upholstery, good chrome. Sander scratched driver’s door window. Original underneath. Filled lower rear quarters. Locked; engine compartment inaccessible. A sound but unexceptional Mustang convertible. – This is a Mustang driver, in many ways a good thing for enjoyment, parts availability, an enthusiastic owners’ club and a car that is always liquid in the sense that it can be bought, driven, kept up, enjoyed and when it’s time to sell will find a ready market. In this case, however, that market will be less than the price paid here which is excessive by a few thousand dollars. 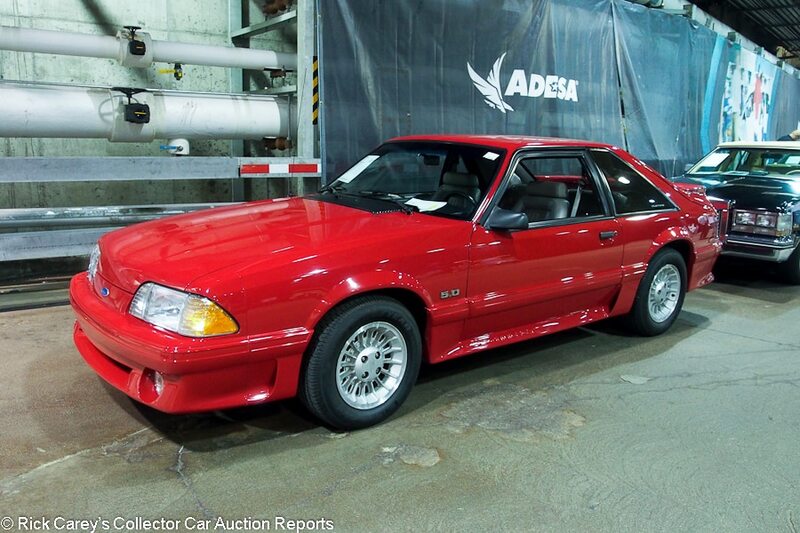 Lot # 3.1 1990 Ford Mustang GT Coupe; S/N 1FACP42E0LF226118; Red/Grey leather; Unrestored original, 3+ condition; No Reserve; Hammered Sold at $20,000 plus commission of 10.00%; Final Price $22,000 – 5.0/225hp, 5-speed, air conditioning, alloy wheels, Eagle GT tires, cassette stereo, power windows, Traction-Lok, Marti Report documented. – One family owned, 40,155 miles, a clean and orderly used car. – Desirably configured, but this is heroic money for what it is. The current Fox-body Mustang infatuation is well known, but prices like this will quickly dull the fascination. 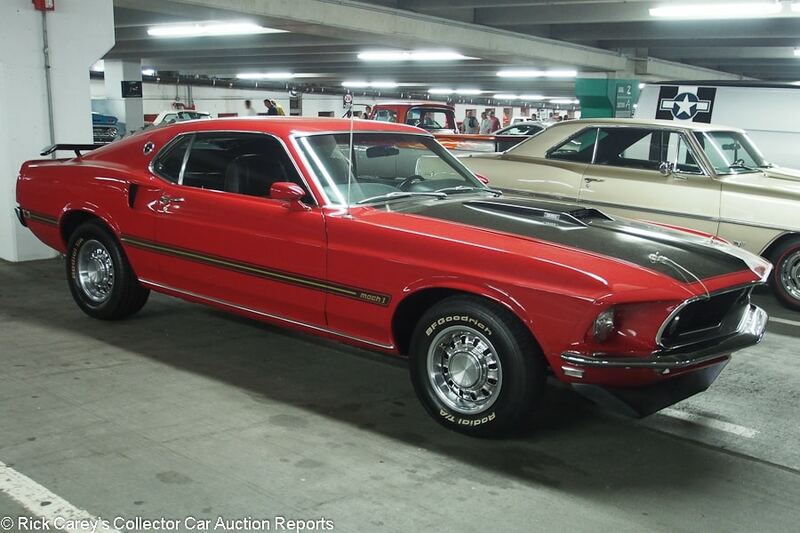 Lot # 429 1969 Ford Mustang Mach 1 Fastback; S/N 9F02M165341; Ruby Red, Black hood/Black vinyl; Visually maintained, largely original, 3- condition; No Reserve; Hammered Sold at $36,000 plus commission of 10.00%; Final Price $39,600 – 351/290hp, 4-speed, 8-track stereo, chrome Rally wheels with trim rings, Radial T/A tires. – Mediocre repaint over old paint, some overspray in the wheel wells. Poor masking. Pitted trim and bumper chrome. Old undercoat in the wheel wells. Foggy gauge lenses. A tired but honest Mustang. 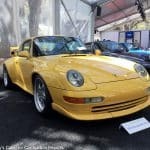 – Sold at Barrett-Jackson Westworld in January for $34,100, then at RM in Ft. Lauderdale in April for $33,550, it brought a little bit more here, but not enough to be expensive. Now the new owner must decide what to do with it, although just driving it seems the most prudent course. 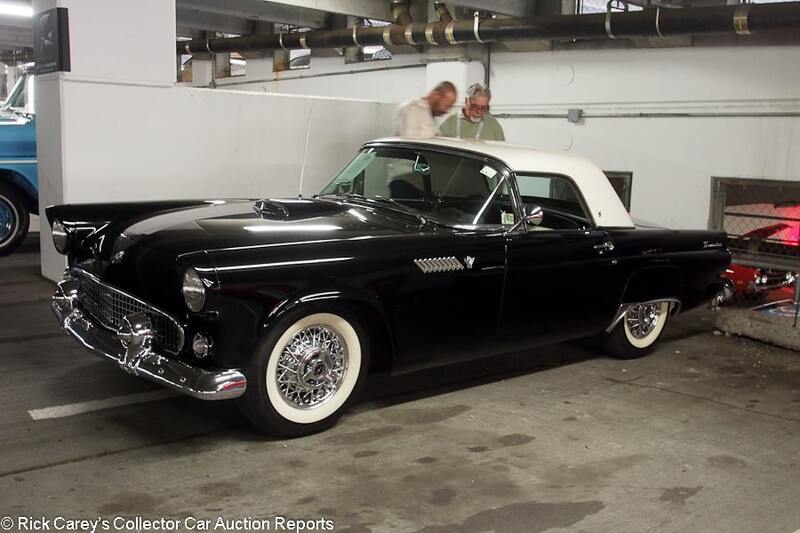 Lot # 325 1955 Ford Thunderbird Convertible; S/N P5FH191216; Black, White hardtop/Black, White vinyl; Black vinyl top; Visually maintained, largely original, 3 condition; No Reserve; Hammered Sold at $24,000 plus commission of 10.00%; Final Price $26,400 – 292/193hp, Kelsey Hayes wire wheels, wide whitewalls, overdrive 3-speed, aftermarket Thunderbird cassette player, power seat, power windows, two tops. – The paint has seen better days with quite a few chips in body and panel edges, scratches and cracking. Brightwork is good. Panel fit is erratic. The engine bay looks original and is showing expected wear and tear. Underneath has a decent amount of surface rust and shows signs of an oil leak. The interior is good in general but the dash is fairly worn. A maintained, mostly original driver. – Sold at Auburn Fall in 2015 for $29,150, then here in 2016 for $39,600, the odometer today shows just 1 mile more than it did in 2015. Today’s result reflects a return to rationality. This is a tired car that’s most notable attribute is the overdrive 3-speed. 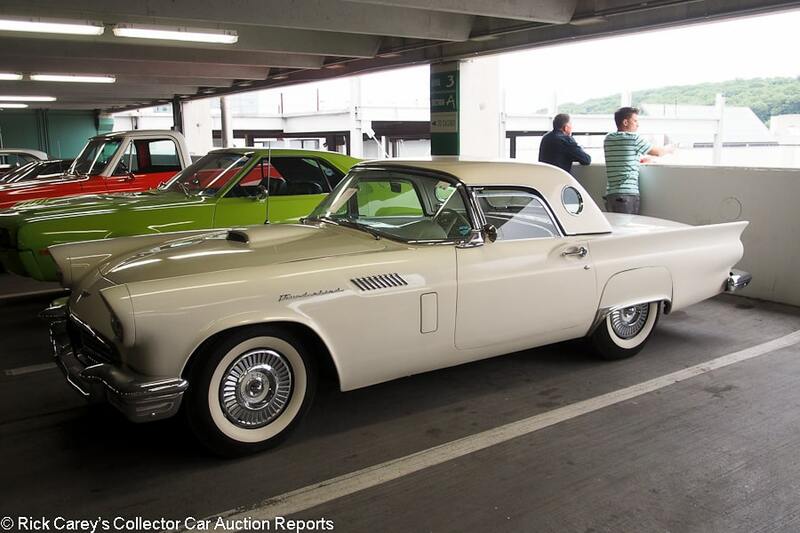 Lot # 65 1957 Ford Thunderbird Convertible; S/N D7FH133454; Colonial White, Colonial White hardtop/White vinyl; White vinyl top; Older restoration, 3- condition; No Reserve; Hammered Sold at $25,500 plus commission of 10.00%; Final Price $28,050 – 312/245hp, automatic, two tops, skirts, wheel covers, bias ply whitewalls, aluminum radiator, stainless steel exhaust. – Fair, dull, old repaint with door and hood edge chips. Dusty, dirty underbody. Sound older upholstery. Dirty, faded, dyed old dashtop. A driven T-bird that was never better than driver quality. – A sound and useable T-bird bought for a price appropriate to its indifferent condition and presentation. The new owner has room, however, to make significant but not expensive improvements that will materially enhance its value. Lot # 631 1970 Ford Torino Cobra SportsRoof; S/N 0A38J156317; Red, Matte Black hood/Dark Red vinyl; Recent restoration, 2+ condition; No Reserve; Hammered Sold at $70,000 plus commission of 10.00%; Final Price $77,000 – 429/375hp Ram Air Cobra Jet, automatic, power steering and brakes, AM-FM, buckets and console, Magnum wheels, Eagle ST tires, shaker hood, Marti report and owner card documented. – Represented as the matching numbers engine and transmission, 31,324 miles from new. Freshly restored and like new everywhere. – Impressively restored and essentially flawless without going beyond reason, this is a sweet car, and it is moderately priced for the equipment and condition. 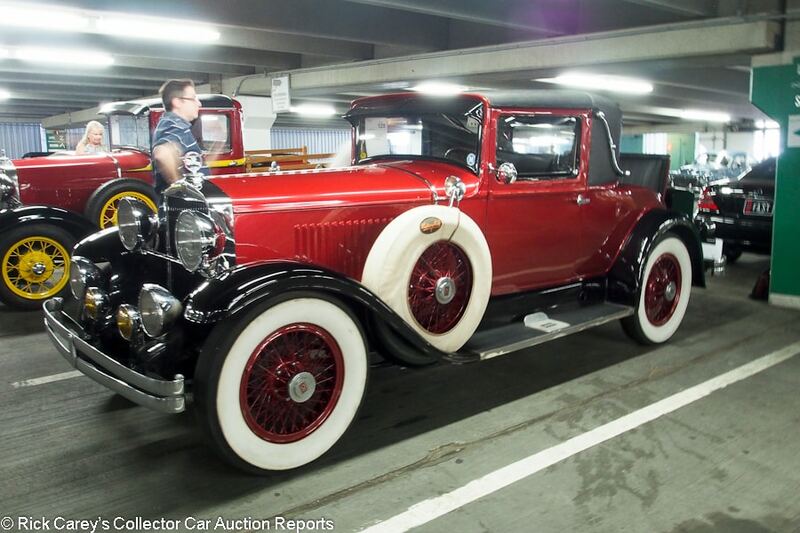 Lot # 129 1929 Hupmobile Series M Coupe; S/N M25573; Ruby Red, Black fenders/Black vinyl; Older restoration, 3 condition; No Reserve; Hammered Sold at $22,000 plus commission of 10.00%; Final Price $24,200 – 269/40hp inline eight, 3-speed, body color wire wheels, wide whitewalls, rumble seat, metal luggage trunk, dual sidemounts with mirrors, Trippe lights, Seelite fog lights. – Repainted assembled with some dust inclusions and a few fisheyes. Sound interior, mixed chrome. An older restoration that has gotten a quick repaint to look good on the block. – Barrett-Jackson often consigns unusual cars, but usually the unusual were classic luxury cars. 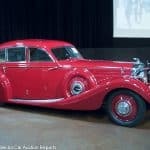 This is an unusual ordinary car, even with its 80 horsepower inline eight, and it took unusually perceptive bidders to recognize its style and rarity, and to look past its superficial repaint to recognize its potential. The result here is probably what it’s ‘worth’, but it is Model T or Model A money and a sound value at this price. Lot # 449 1949 International KB2 Pickup; S/N KB270357; IH Red/Black leatherette; Truck restoration, 2+ condition; No Reserve; Hammered Sold at $27,000 plus commission of 10.00%; Final Price $29,700 – 214/82hp six, 4-speed, hubcaps and trim rings, heater, turn signals. – Restored almost two decades ago and still impressive. The paint is bright and free of chips or scratches. Even the running boards and bed floor look like they’ve never been touched. The only knock is that the odometer reels weren’t redone and are faded. Better than the vast majority of truck restorations. – A better-than-new IH pickup bought for less than a comparable Ford or Chevy, the new owner of this truck will be immensely pleased with its condition and rarity. Comparable transactions are thin but none of them suggest that this is anything less than a superior value for the new owner in a quality, rare, distinctive pickup. 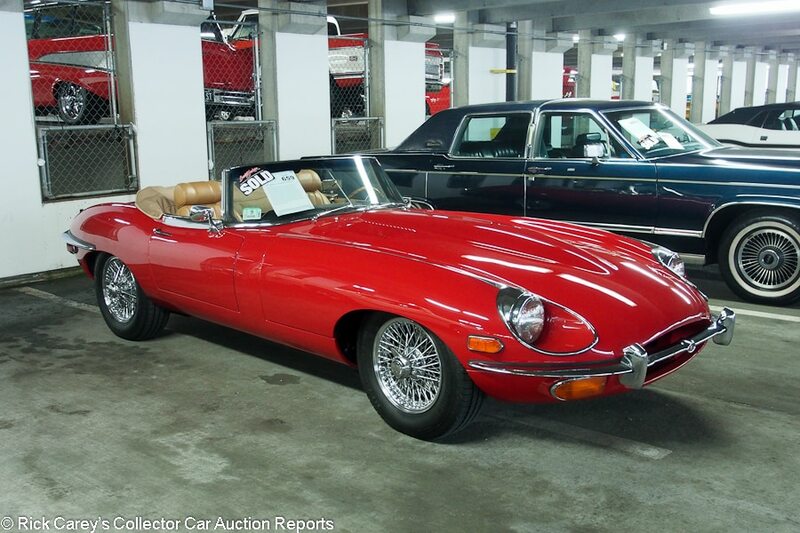 Lot # 659 1969 Jaguar XKE SII Roadster; S/N 1R10086; Signal Red/Biscuit leather; Beige cloth top; Older restoration, 3+ condition; No Reserve; Hammered Sold at $77,000 plus commission of 10.00%; Final Price $84,700 – 4-speed, Moto-Lita woodrim steering wheel, JVC cassette stereo, air conditioning, chrome wire wheels, BFG tires, headrest seats, aluminum radiator (comes with the original radiator), JDHT certificate documented, jack and tool kit. – Represented as 34,081 miles from new. Good paint, better chrome. Good interior with lightly stretched seat cushions. Clean restored engine compartment and underbody show use. Restored to good driver standards and used for the purpose intended. – It wouldn’t take much attention to raise this XKE’s condition closer to showroom, just some cleanup. That possibility is reflected in the result it reached here, which reasonably reflects its issues but also its underlying quality restoration. 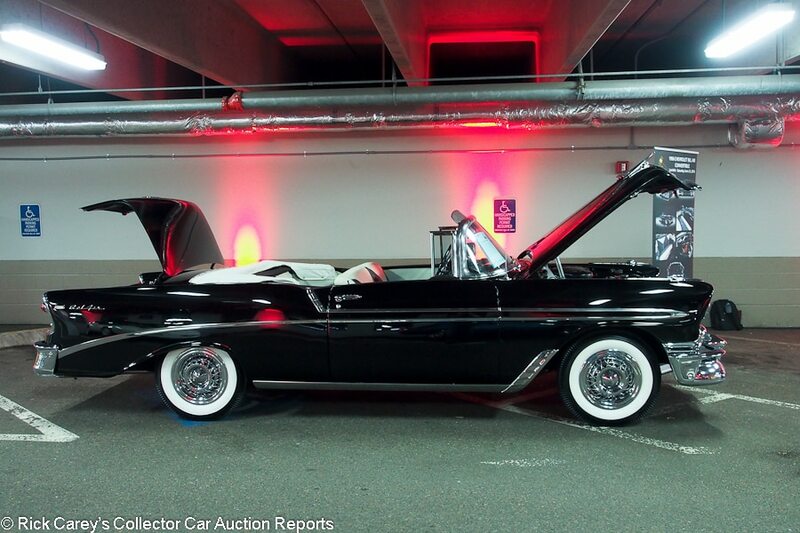 Lot # 386 1966 Lincoln Continental Convertible Sedan; S/N 6Y86G453579; Black/Black leather; Black vinyl top; Visually maintained, largely original, 3- condition; No Reserve; Hammered Sold at $49,000 plus commission of 10.00%; Final Price $53,900 – 462/340hp, automatic, Town & Country AM-FM, air conditioning, power brakes and steering, wheel covers, whitewalls, power windows, upgraded with disc front brakes. – Weak bumper chrome, scuffed and dented bright trim, scratched instrument panel. Dirty engine compartment with some blue paint blown on the valve covers and air filter housing. Rather sad. – This result should have bought a really good Continental, not this rather sad example that has seen (much) better days. The result here could have bought two similar Continentals without either of them being a bargain. 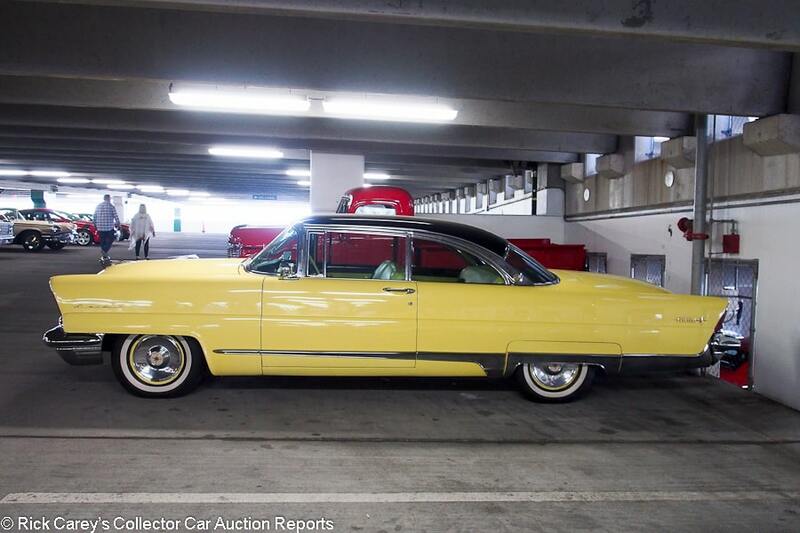 Lot # 446 1956 Lincoln Premiere 2-Dr. Hardtop; S/N 56WA47237L; Yellow, Black roof/Yellow, White vinyl, Black cloth; Cosmetic restoration, 3- condition; No Reserve; Hammered Sold at $17,000 plus commission of 10.00%; Final Price $18,700 – 368/285hp, automatic, Town & Country radio, wheel covers, whitewalls, power windows and steering. – Mediocre repaint with fisheyes and orange peel. Erratic chrome. Sound interior. Dusty, chipped instrument panel and knobs. Clean but unrestored underneath. – This isn’t a car show standout Lincoln, but it is a sound and honest old car with evidence of consistent maintenance as needed. There is nothing about it that makes it anything more or less than an honest value at this price. 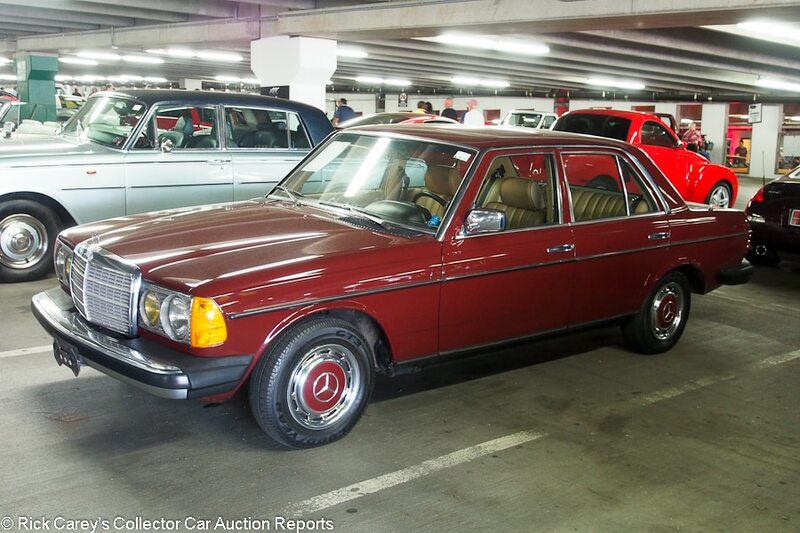 Lot # 9 1983 Mercedes-Benz 240D 2-Dr. Sedan; S/N WDBAB23A7DB396001; Maroon/Tan vinyl; Visually maintained, largely original, 3+ condition; No Reserve; Hammered Sold at $7,500 plus commission of 10.00%; Final Price $8,250 – Automatic, sunroof, wheel covers, Goodyear tires, cassette stereo, power windows, air conditioning, bill of sale and original window sticker documented. – Orange peely waterspotted repaint, good original interior with worn driver’s door pillar trim. Clean original underbody. Sound original bright trim. A sound mostly original car showing 128,953 believable miles. – It was sold here a year ago for $7,150. Owning a 240D in New England means connecting it up to a block heater and putting a 150w incandescent drop light under the sump to heat it up three months of the year so it will start on winter mornings. Fuel mileage and leisurely performance (especially with the automatic) is not worth it and it takes a masochist to own one today. 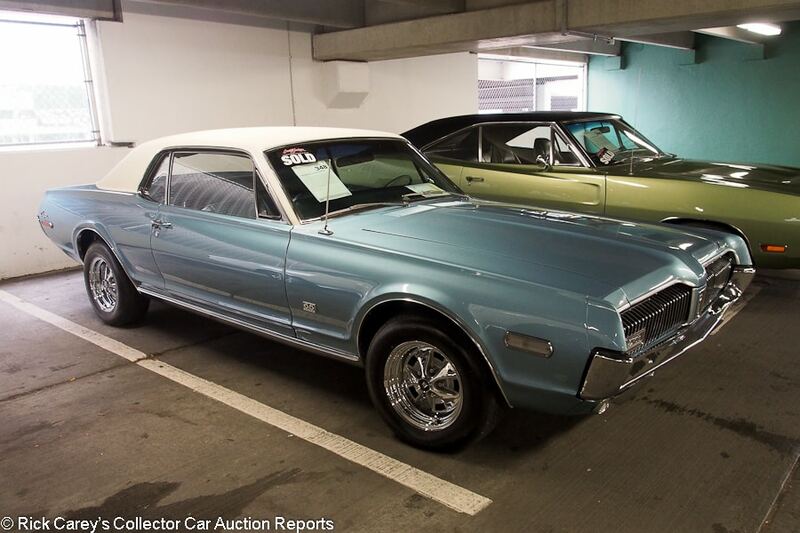 Lot # 348 1968 Mercury Cougar 2-Dr. Hardtop; S/N 8F91S569829; Brittany Blue, White vinyl roof/Blue vinyl; Older restoration, 3+ condition; No Reserve; Hammered Sold at $30,000 plus commission of 10.00%; Final Price $33,000 – 390/325hp, automatic, tilt steering column, aftermarket CD stereo and gauges, 4-wheel disc brakes, chrome Magnum wheels, Michelin radial tires, Traction-Lok. – Good repaint with a school of fisheyes and insufficiently wet sanded sides. The rear deck is lightly scratched. Good chrome and interior but the front and rear seats have different material. Represented as the original engine. A sound and presentable older restoration with a few easily addressed issues. – The 4-wheel disc brakes are an upgrade, but well worth doing. The flawed paint is disappointing but the price it brought is anything but, a serious premium for thoughtful upgrades that isn’t offset by any significant features. 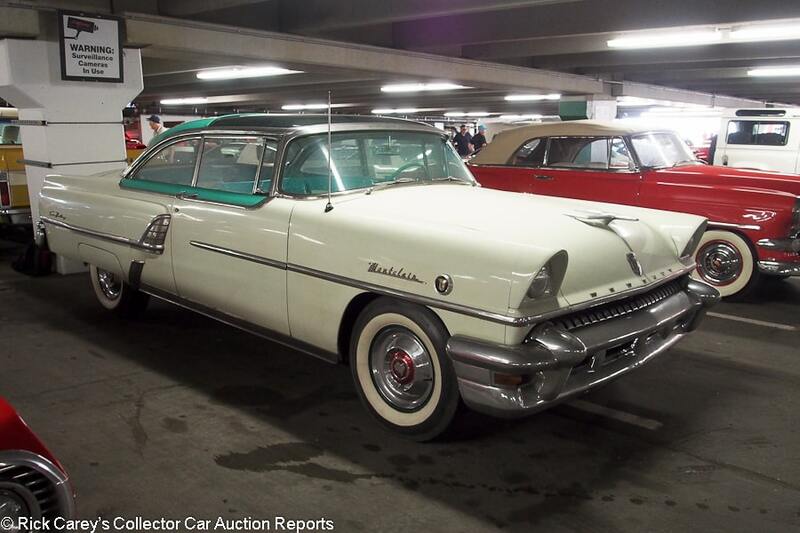 Lot # 95 1955 Mercury Montclair Sun Valley 2-Dr. Hardtop; S/N 55WA46398M; Ivory, Turquoise Green/Green, White vinyl; Visually maintained, largely original, 3- condition; No Reserve; Hammered Sold at $19,500 plus commission of 10.00%; Final Price $21,450 – 292/188hp, automatic, wheel covers, whitewalls, pushbutton radio, green-tinted Plexiglas roof panel – Dirty and neglected. Flawed old repaint, sound interior, Weak, pitted chrome. Scratched Plexiglas roof panel. Orderly repainted underbody. There might be a sound car under the dirt, but there might not, too. It was cleaned up a little before crossing the block but still got hammered for its scruffy presentation. – At this price the new owner has substantial opportunities to improve the car, as long as its mechanical condition is no worse than ‘neglected.’ It is potentially worth three or four times this, but is a long way from being in tip top condition. 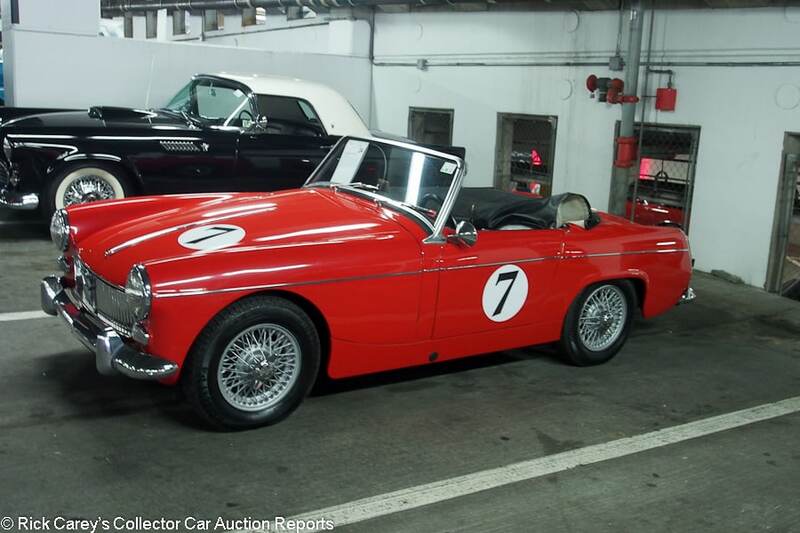 Lot # 24 1964 MG Midget Mk I Roadster; S/N GAN2L23232; Red/Black vinyl; Visually maintained, largely original, 3 condition; No Reserve; Hammered Sold at $6,800 plus commission of 10.00%; Final Price $7,480 – Painted centerlock wire wheels, Pirelli P4 tires, tonneau cover, Grant leather-wrapped steering wheel, wood shift knob. – Dull, lightly scratched chrome and pitted brightwork. Dull windshield frame and rubber gaskets. Very good seats and dash. Cracked steering wheel cap. The bottom of the “T” in the Midget badge on the tail has broken off. Decent older paint with a handful of chips and scratches. Has numbers on it, but there’s no roll bar, it has a full interior, and it doesn’t look like it has led the life of a competition car. Maybe it’s done a few rallies or autocrosses, but that’s probably it. The underbody has been resprayed over old undercoat and dirt. A cute and attractive driver that looks fantastic at 20 feet. – Sold here two years ago for $10,450 with 77 fewer miles on the odometer that now shows 6,120 miles. This is a realistic price for an ordinary Spridget. Lot # 303 1995 Mitsubishi 3000GT Spyder SL Retractable Hardtop; S/N JA3AV65J1SY819757; Caracas Red/Black leather; Unrestored original, 3 condition; No Reserve; Hammered Sold at $7,200 plus commission of 10.00%; Final Price $7,920 – 2972/222hp V6, automatic, air conditioning, power steering and brakes, Infinity CD stereo, chrome alloy wheels, Michelin tires. – Sound original paint and well-worn but sound original interior. The clear headlight covers have some sort of rash and there are water spots, a few scratches and one scraped area on the hood, but all in all it’s remarkably well-preserved. The odometer shows 76,304 believable miles. – Sold at B-J Scottsdale in 2014 for $13,750. The buyer here got a more realistic deal. 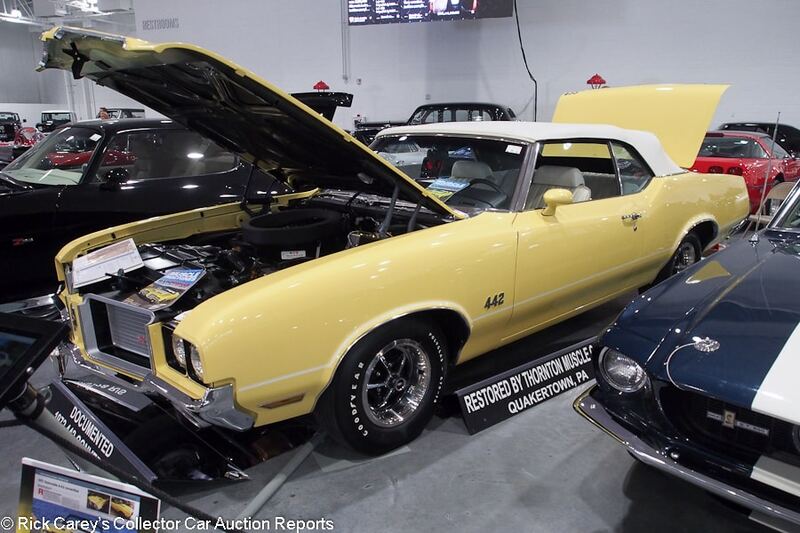 Lot # 722 1972 Oldsmobile Cutlass 4-4-2 Convertible; S/N 3J67M2M217076; Sunfire Yellow, White stripes/White vinyl; White vinyl top; Recent restoration, 2+ condition; No Reserve; Hammered Sold at $85,000 plus commission of 10.00%; Final Price $93,500 – 350/200hp, automatic, power steering, power brakes, air conditioning, dual exhaust, SS wheels, G70-14 Polyglas tires, AM-FM, documented with two build sheets, Protect-o-Plate, owner’s manual, pre-delivery checklist and more. – Excellent show quality paint, chrome and interior, represented as the original engine. The engine compartment is like new. 2016 AACA National First Prize winner at Hershey and Hemmings Muscle Car cover feature. An outstanding Thornton restoration. – Being a ’72 and powered by a 350 instead of a 455 this isn’t the most desirable Cutlass 4-4-2 but it is thoroughly documented and impeccably restored. Its result here reflects that fresh, AACA winning restoration and nothing else. It is a huge price for the underlying car. 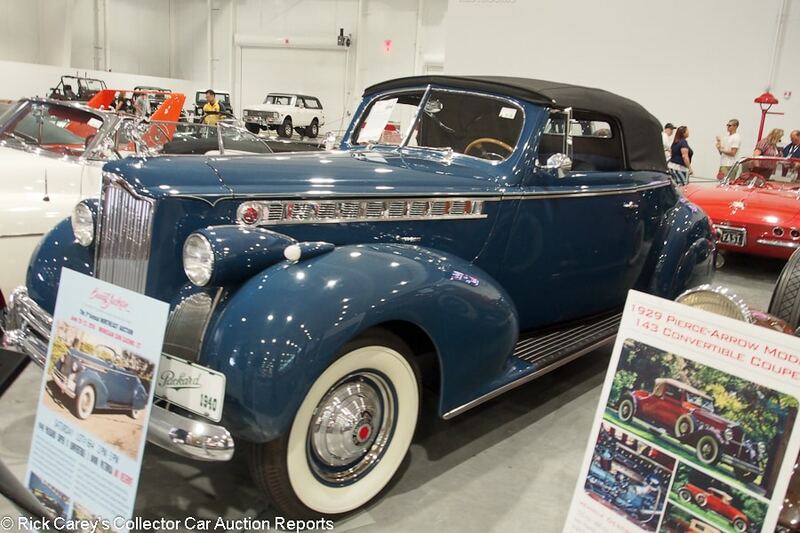 Lot # 664 1940 Packard 1803 Convertible; S/N 13792030; Centennial Blue/Blue-Grey leather; Black cloth top; Older restoration, 3+ condition; No Reserve; Hammered Sold at $57,000 plus commission of 10.00%; Final Price $62,700 – Hubcaps and trim rings, wide whitewalls, cormorant mascot, heater, clock, grille guard, skirts. – CCCA National First Prize #2820. Very good paint and interior, better chrome. The underbody was restored like new and now shows some age and storage dust. The engine, however, hasn’t seen much attention and is surface rusted. A John Hollingsworth restoration, this a good car that deserves a home as good as it is. – Sold at WestWorld in 2014 for $148,500. With that taken as a benchmark, which it should be with some reservations, it is a superior car in need of uncomplicated attention to bring it back to condition worthy of being shown at the end of a day’s CCCA CARavan. It is a seriously good car bought for a seriously economical price, not quite a bargain but close. 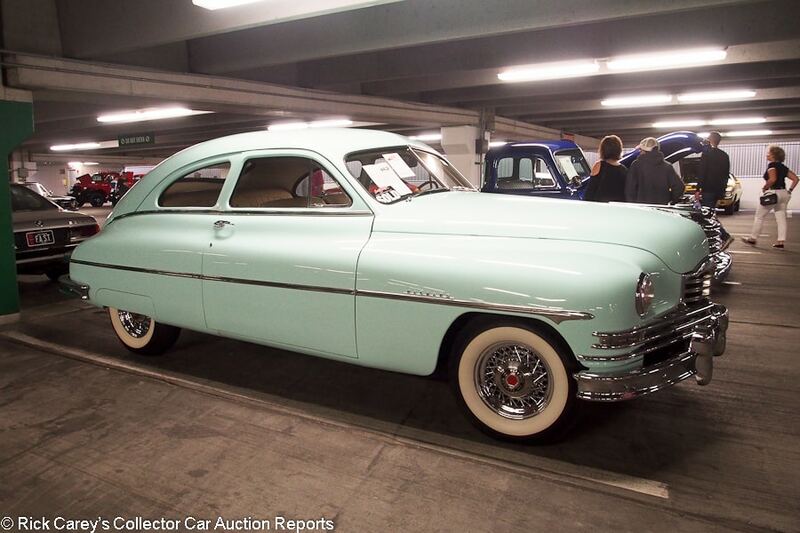 Lot # 462 1950 Packard Standard 8 Club Sedan; S/N 2395510161; Turquoise Blue/Parchment leather; Recent restoration, 3 condition; No Reserve; Hammered Sold at $30,000 plus commission of 10.00%; Final Price $33,000 – 288/135hp, 3-speed, column shift, chrome wire wheels, wide whitewalls, heater, turn signals. – Represented to have 65,211 miles. Good fresh repaint, chrome and full interior. The underbody has been done but reassembled with old rusty parts like the parking light housings. Gauges are very good but the dashboard woodgraining is awful and the steering wheel hasn’t been touched. The glass is excellent except for delamination of the right-hand vent window. This has all the earmarks of a long term restoration that has been rushed to completion. – This much money should have bought the very best 1950 Packard Standard 8 Deluxe Club Sedan in the world. This isn’t even a Deluxe (Body Style 2385) and it’s far from the best with many egregious oversights and shortcomings. It’s a $10,000 car on its best day and a buyer who’s going to awaken on Saturday with a bad hangover. 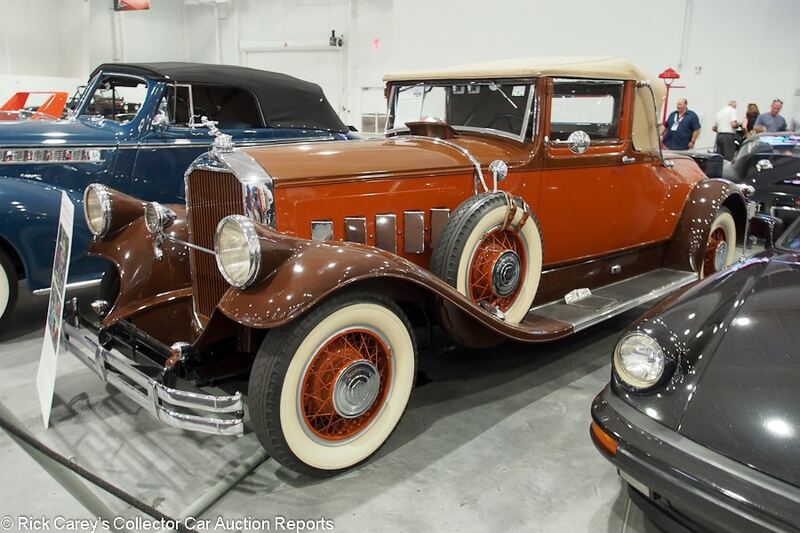 Lot # 709 1929 Pierce-Arrow Model 143 Convertible; S/N A4308; Brown, Pumpkin sides/Brown leather; Beige cloth top; Older restoration, 2- condition; No Reserve; Hammered Sold at $45,000 plus commission of 10.00%; Final Price $49,500 – Pumpkin wire wheels, whitewall tires, dual sidemounts with mirrors, Dawley headlights, rumble seat, black metal trunk, dual outside and inside mirrors, Philco radio, turn signals. – Good older paint, chrome and interior. Top fits well, with some creases from being folded. The engine is only lightly used. A quality older restoration in great touring condition. 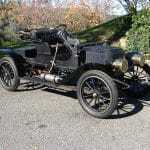 – 1929 saw the introduction of Pierce-Arrow’s eight-cylinder engine, coincident with its consolidation with Studebaker. This is a highly usable and attractive car with 125 horsepower that should tour well in all kinds of weather and is priced in this transaction as attractively as the car itself, a big discount from the princely $102,000 it was reported to have sold for at Auburn Fall last year. 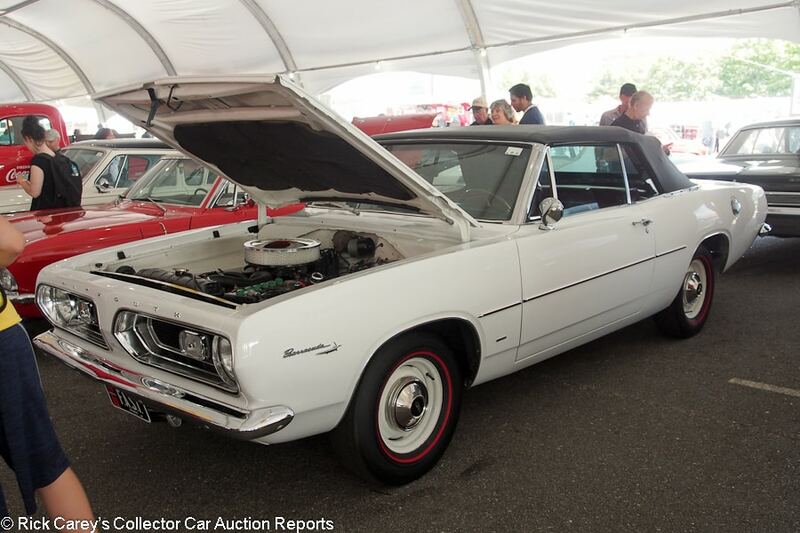 Lot # 87 1967 Plymouth Barracuda Convertible; S/N BH27D72289678; White/Ruby Red vinyl; Black vinyl top; Visually maintained, largely original, 3- condition; No Reserve; Hammered Sold at $32,500 plus commission of 10.00%; Final Price $35,750 – 273/180hp with 4-barrel added, 4-speed, Hurst shifter, body color steel wheels, red line tires, pushbutton radio, woodgrain steering wheel. – Repainted assembled with some overspray under the hood. Sound original interior and chrome. The engine compartment is a mess and benefits not at all from a sloppy brush repaint of the valve covers and water pump. Represented as matching numbers. – The seller should be very pleased with this price for a superficially presented car with a notably ugly engine compartment. $20,000 would have made more sense. This result is extravagant. 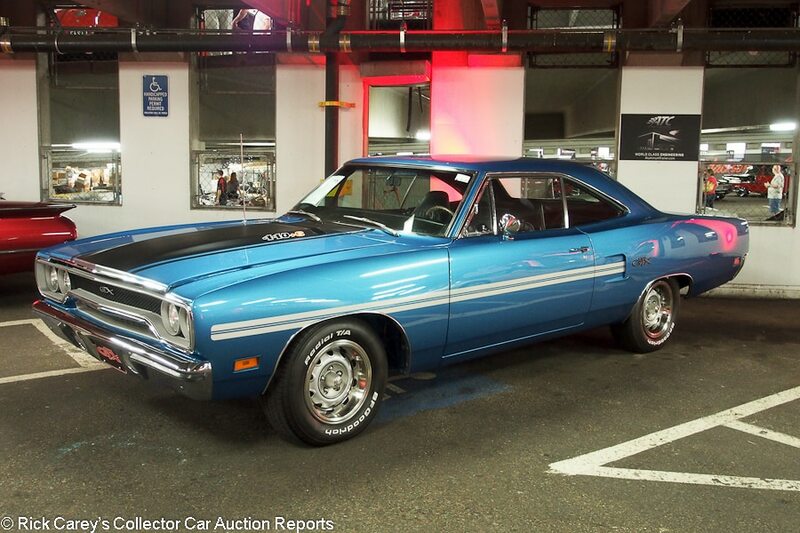 Lot # 715 1970 Plymouth GTX 2-Dr. Hardtop; S/N RS23V0A137111; Bright Blue, Matte Black hood/Black vinyl; Older restoration, 2- condition; No Reserve; Hammered Sold at $70,000 plus commission of 10.00%; Final Price $77,000 – 440/390hp, Six-Barrel, automatic, buckets and console, Rallye wheels with trim rings, Radial T/A tires, power brakes, Sure-Grip 3.54, woodgrain steering wheel, AM-FM, KYB shocks, original Broadcast Sheet documented. – Very good paint and interior but weak bumper and trim chrome. The engine and underbody were restored like new but now show age even if there is little evidence of use. Flat panels and even gaps. Not fresh but very good and represented as the matching numbers engine. – This is an appealing GTX, done to high standards in desirable colors and agreeably equipped. Its appeal to the bidders at Mohegan Sun is apparent in this ample but reasonable result. 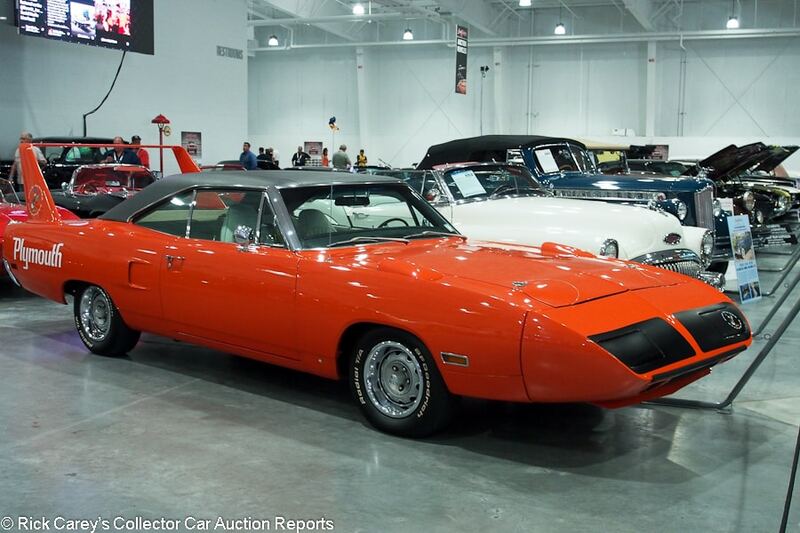 Lot # 671 1970 Plymouth Road Runner Superbird 2-Dr. Hardtop; S/N RM23V0A172645; Torch Red, Black vinyl roof/White vinyl; Older restoration, 3+ condition; No Reserve; Hammered Sold at $155,000 plus commission of 10.00%; Final Price $170,500 – 440/390hp Six Barrel, automatic, 3.55 Sure Grip, power steering and brakes, Rally wheels, Radial T/A tires, buckets and console, pushbutton radio, Rally gauges, woodgrain steering wheel. – Very good paint with some polishing swirl, good chrome and interior that is lightly soiled. The engine compartment has been cleaned up for the auction, but not the recesses or the chassis. Described as having 5,000 miles since restoration, it’s still presentable but its age is showing and it has a ‘date code correct’ engine. – The color helps, but this much money could have bought an equally good Road Runner Superbird with its original engine. 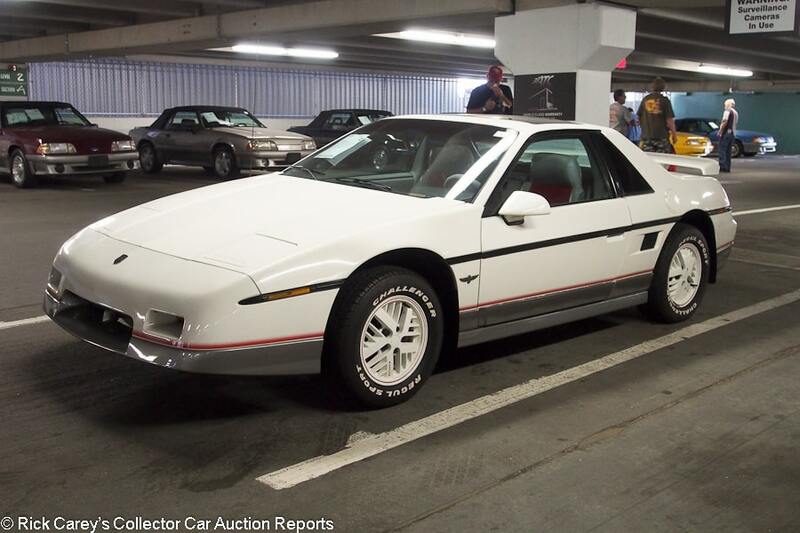 Lot # 2 1984 Pontiac Fiero Coupe; S/N 1G2AF37RXEP255962; White/Grey vinyl, Red cloth; Unrestored original, 3 condition; No Reserve; Hammered Sold at $4,000 plus commission of 10.00%; Final Price $4,400 – Automatic, air conditioning, power windows, cassette stereo, white alloy wheels, sunroof, Regul Sport tires, no Pace Car graphics. – 53,236 miles. One of sixty Indy Fieros. Dull, shrinking original paint with peeling clearcoat, lightly worn and stretched original upholstery. An interesting and sound car but cosmetically challenged. – There were two Fiero Pace Cars at B-J Northeast. This was, despite the known mileage, by far the worse of the two and it brought a price appropriate to its condition. 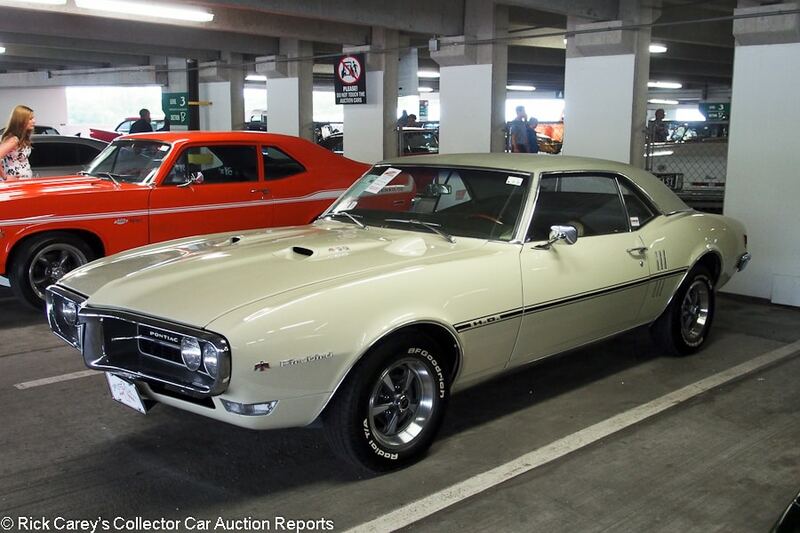 Lot # 98 1968 Pontiac Firebird 400 Coupe; S/N 223378U138897; Primavera Beige, Gold vinyl roof/Gold vinyl; Older restoration, 3+ condition; No Reserve; Hammered Sold at $37,000 plus commission of 10.00%; Final Price $40,700 – 400/335hp, Hydramatic, Safe-T-Track, power steering and brakes, 8-track stereo, rear deck antenna, Rally gauges, fold-down rear seat, buckets and console, tilt steering column, Sport steering wheel and many more options, bill of sale, Protect-o-Plate, warranty book and PHS documented – Good older repaint but the hood tach enclosure is lighter than the hood. Driver’s seat cushion is stretched and a seam is starting to pull. Good roof vinyl and panel gaps. Clear gauges and good interior trim and knobs. The underbody was restored like new and gently driven. – The options list on this Firebird is as long as your arm and even though the cosmetics are showing some use and age it represents a solid value at this price. Keeping all the bells and whistles functioning may be an ongoing challenge, but when it is displayed the onlookers are going to be amazed. 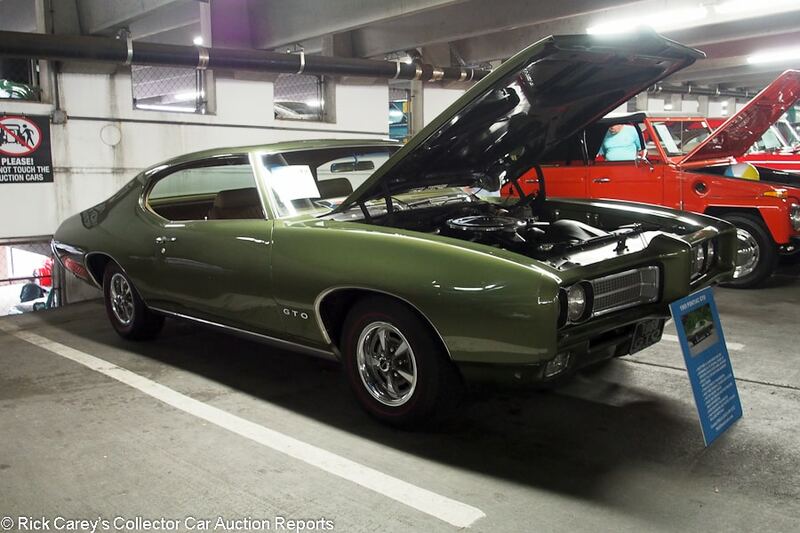 Lot # 73 1969 Pontiac GTO 2-Dr. Hardtop; S/N 242379G135564; Engine # 057916YS; Verdoro Green/Camel vinyl; Visually maintained, largely original, 3+ condition; No Reserve; Hammered Sold at $35,000 plus commission of 10.00%; Final Price $38,500 – 400/350hp, automatic, power steering and brakes, air conditioning, hood tach, Rally 2 wheels with trim rings, red line tires, pushbutton radio, Safe-T-Track, PHS documented. – Fresh clearcoat repaint with a few fisheyes. Orderly unrestored engine compartment, air blows cold. Clean unrestored underbody. Scuffed cowl chrome. Dusty interior switches. A usable, presentable driver. 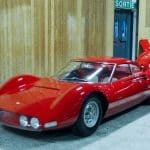 – A result that is fair to both the buyer and the seller and on the face of it an inherently good value even if this is what collectors seem to think GTOs like this are worth. 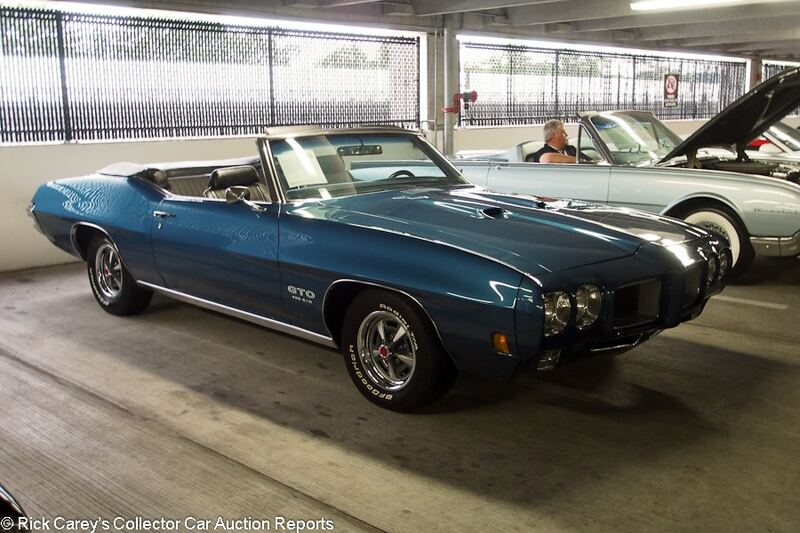 Lot # 760 1970 Pontiac GTO Convertible; S/N 242670P229369; Metallic Blue/Black vinyl; Black vinyl top; Cosmetic restoration, 3+ condition; No Reserve; Hammered Sold at $40,000 plus commission of 10.00%; Final Price $44,000 – 455/360hp, 4-speed, Hurst shifter, console, Rally II wheels, Radial T/A tires, Formula steering wheel, Rally gauges, power steering. – Good repaint but not wet sanded diligently along some panel edges. Flush panel fits and even gaps. Several small chips on the back edge of the passenger’s door. Scrofulous paint on the steering wheel hub and center cap. Clean but not restored underbody and chassis. Attractive color. – Sold at Mecum Harrisburg last August for $44,000, the same price it brought here. Both are good, sound results for the drop top and 455/360 4-speed drivetrain in cosmetically restored condition like this, but both are wholesale and the new owner can expect to invest a little time in addressing some of its more notable needs and bring it to the next level of presentation with a worthwhile boost in value. Lot # 319 2005 Pontiac GTO Coupe; S/N 6G2VX12U95L348707; Red, Black accents/Red leather; Unrestored original, 2- condition; No Reserve; Hammered Sold at $9,000 plus commission of 10.00%; Final Price $9,900 – 364/400hp, automatic, air conditioning, CD stereo, factory alloy wheels, Toyo tires, dashtop gauges, air dam and side skirts. – The added body parts fit fairly well and match the factory paint. The interior, glass and headlight covers match the stated 52,779 miles. There is a dull area on the paint above the left rear window. CarFax reports rear end damage in 2015, which probably accounts for the aero add-ons. – The CarFax report and aero gew-gaws don’t do this GTO any favors, suggesting it may have been hammered, but even at that this is a performance bargain (speaking as a 2005 GTO owner.) It would not have been unreasonable to purchase this car as a rolling store of its now frequently unavailable parts. 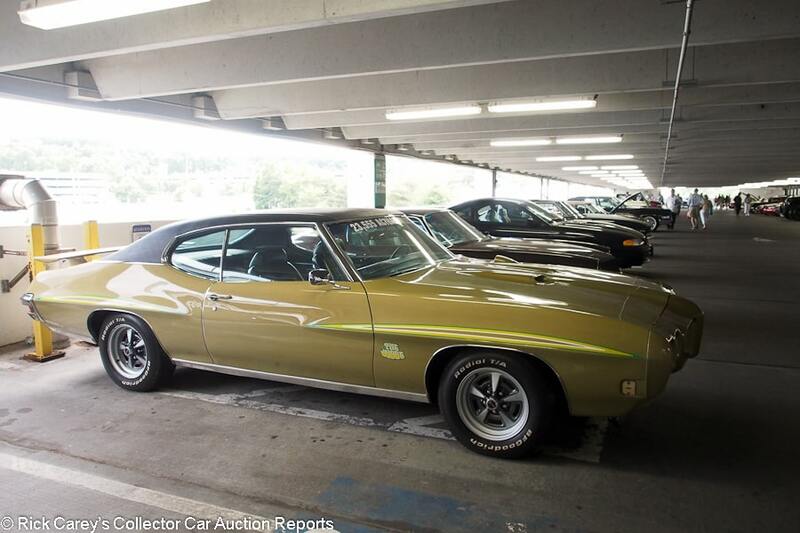 Lot # 730.1 1970 Pontiac GTO Judge 2-Dr. Hardtop; S/N 242370R128986; Engine # 0157380 WS; Medium Green, Black vinyl roof/Black vinyl; Visually maintained, largely original, 3 condition; No Reserve; Hammered Sold at $50,000 plus commission of 10.00%; Final Price $55,000 – 400/366hp Ram Air III, 4-speed, Hurst shifter, pushbutton radio, Magnum wheels, Radial T/A tires, hood tach, Endura nose, wing, PHS documented. – Mediocre clearcoat repaint over old paint and some flaws such as on the hood vents. The nose, hood and left front fender are out of line. The engine compartment was restored like new, then driven. The gauge lenses are foggy. The underbody has been hit with a superficial squirt of black over old undercoat and dirt. Upholstery and vinyl roof are sound. Good vinyl graphics. Said to be 23,357 miles and matching numbers. – Offered at Kissimmee five months ago but bid to only $35,000 there, it realized its potential here taking into account the mostly original and aged condition. 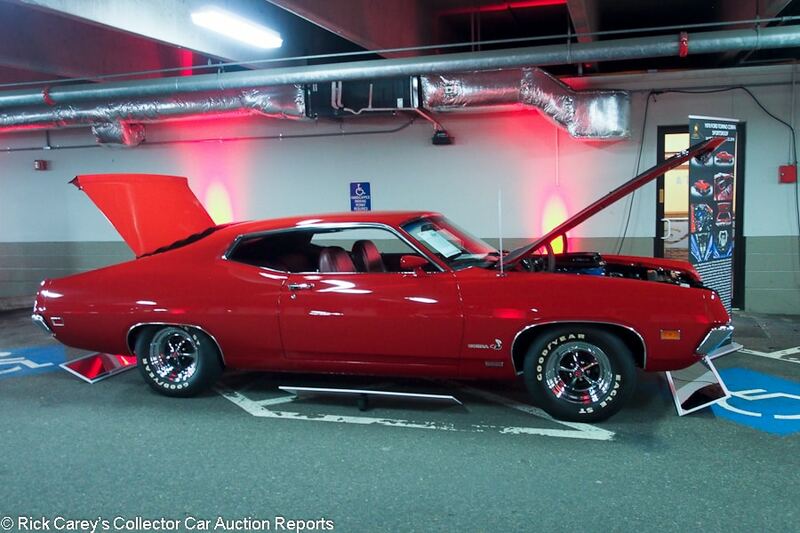 The new owner got a highly desirable GTO Judge and can live with the foggy gauges and flawed paint at this price. 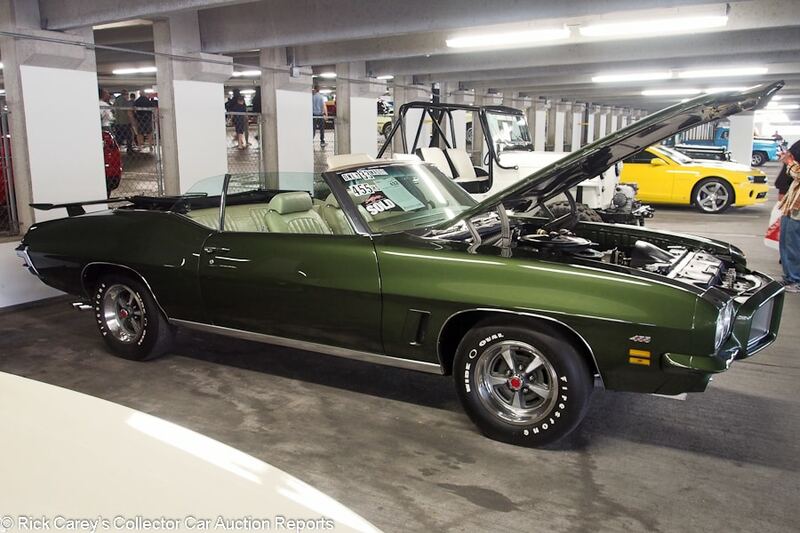 Lot # 432 1972 Pontiac LeMans Convertible; S/N 2D67X2P133151; Springfield Green Metallic/Parchment vinyl; Black vinyl top; Older restoration, 2- condition; No Reserve; Hammered Sold at $44,000 plus commission of 10.00%; Final Price $48,400 – 455/300hp 34X (?) engine, automatic, buckets and console, air conditioning, power steering and brakes, pushbutton radio, sport steering wheel, Rally II wheels, Wide Oval tires, Ram Air hood, Endura front bumper, rally gauges, wing, PHS documented. – Restored like new with very good cosmetics. Clean underhood. An attractive car in very good, nearly new, condition showing only a little use and age although the engine compartment is close to needing an engine-out detailing and freshening. – This highly unusual, loaded, LeMans is memorable not only for its equipment but also for its exceptionally attractive colors. It was sold at Mecum Indy in 2010 for $60,950, then at B-J Palm Beach in 2012 for $68,200. It made an appearance at Mecum Kissimmee in January where it was inexplicably reported bid to only $20,000. The odometer shows only 74 miles more now than it did in 2012 and the car is in comparable condition. Given the 2010 and 2012 results this is an advantageous purchase that put the new owner in a car that is probably uniquely lavishly equipped, a GTO in LeMans garb. 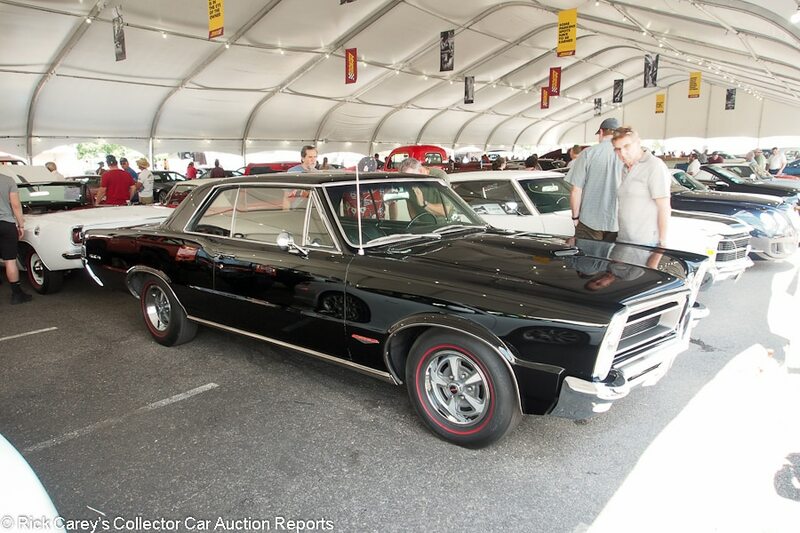 Lot # 425 1965 Pontiac LeMans GTO 2-Dr. Hardtop; S/N 237375P352379; Black/Black vinyl; Visually maintained, largely original, 3- condition; No Reserve; Hammered Sold at $38,000 plus commission of 10.00%; Final Price $41,800 – 389/335hp, automatic, SS wheels, red line tires, console, air conditioning, power steering, PHS documented. – Freshly repainted over old paint but with good masking. Good upholstery. Pitted windwing chrome. Bright trim scuffed during sanding. The underbody is original and scruffy. 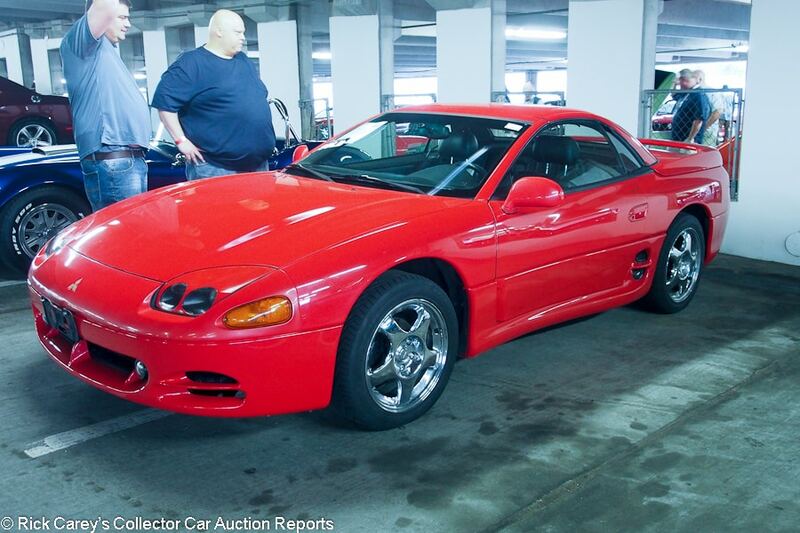 Dressed up for the auction, this is a GTO to be taken with a grain of salt. 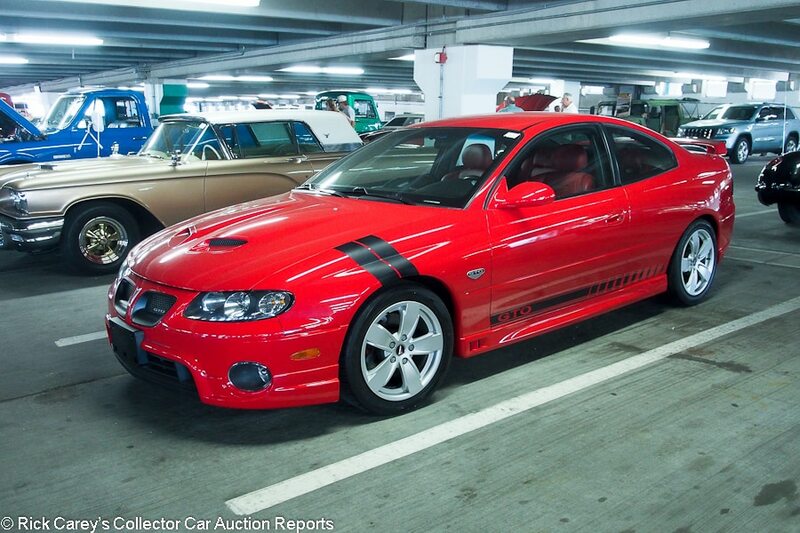 – The salt shakers at Mohegan Sun must have been empty, or the bidders were dazzled by the shiny new paint to get them to pay this much for a mediocre LeMans GTO, a $30,000 car in this condition and configuration. 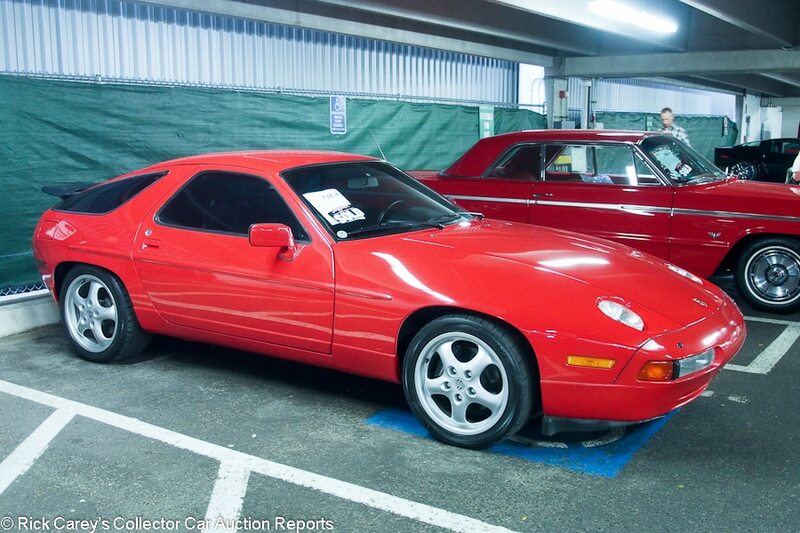 Lot # 157 1987 Porsche 928 S4 Coupe; S/N WP0JB0928HS862210; Red/Black leather; Visually maintained, largely original, 3- condition; No Reserve; Hammered Sold at $18,500 plus commission of 10.00%; Final Price $20,350 – Automatic, silver painted alloy wheels, air conditioning, sunroof, power windows, recent Alpine CD stereo – 56,008 miles. Good repaint with some overspray in the rear wheel wells and some masking misses. Sound lightly stretched original upholstery. Both door key bezels are scratched. Dressed up and sound but ordinary. 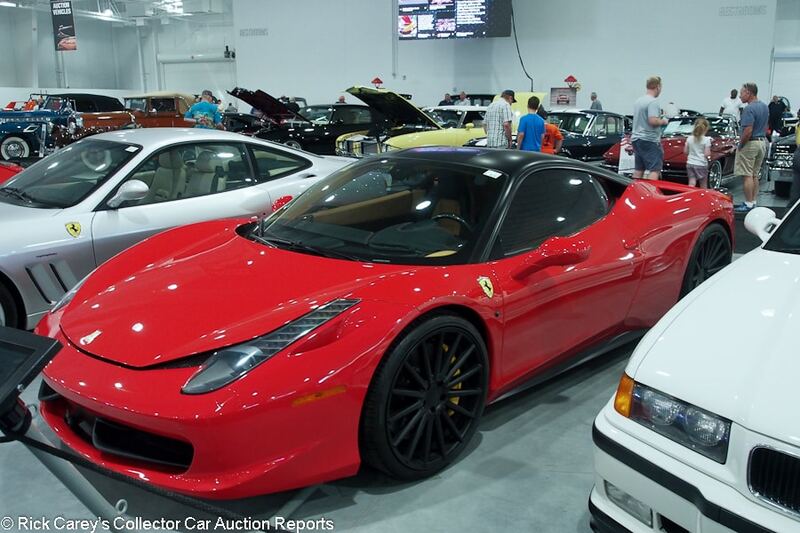 – Sold here a year ago for $22,000, one of three red, automatic, 928 S4s in this auction. Despite recent work in early 2017 this was the least appealing of the three, and it brought (by <$2,000) the lowest price, which it deserved. 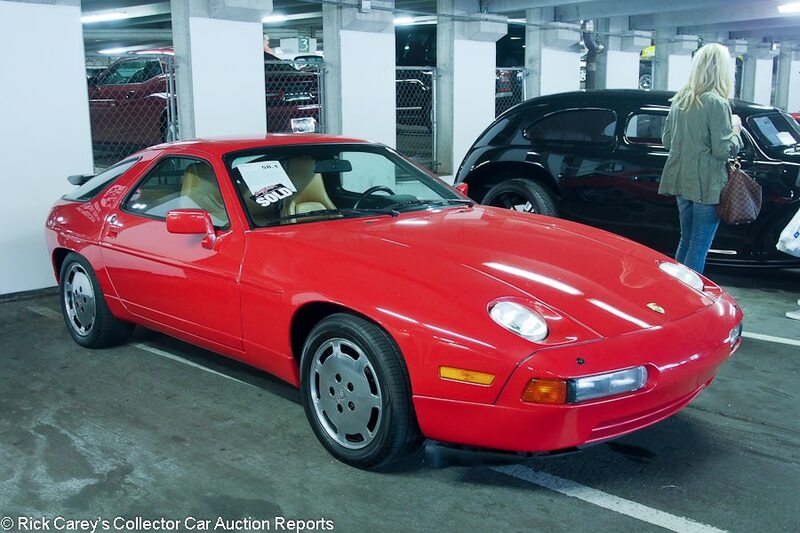 Lot # 58.1 1988 Porsche 928 S4 Coupe; S/N WP0JB0920JS860747; Red/Tan leather; Unrestored original, 3- condition; No Reserve; Hammered Sold at $20,000 plus commission of 10.00%; Final Price $22,000 – automatic, air conditioning, power windows, Porsche alloy wheels, Rapid tires. – Sound original paint. Badly worn and surface cracked original upholstery on the driver’s seat; the other three seats are good. The right air dam is falling off. Generally sound but definitely aged more than the 43,284 claimed original miles would indicate. 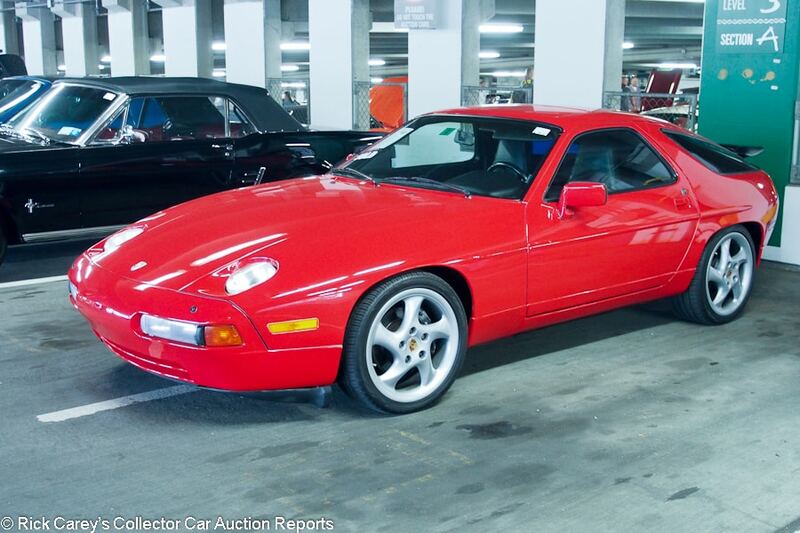 – There were three Porsche 928 S4s at B-J Northeast, all of them red, all of them automatics. All brought similar prices although this one was expensive for its condition. Lot # 331.1 1988 Porsche 928 S4 Coupe; S/N WP0JB0922JS861074; Red/Black leather; Unrestored original, 3+ condition; No Reserve; Hammered Sold at $20,000 plus commission of 10.00%; Final Price $22,000 – Automatic, sunroof, silver Porsche alloy wheels, Sumitomo tires, Blaupunkt cassette stereo, air conditioning with climate control, matte Black wing. – Represented as 26,648 miles and looks like it. Very good original paint and upholstery. Gauge pod covering is starting to sun rot. Gauges, knobs and controls are clear and crisp. The underbody looks as expected for the stated mileage. A sound and apparently consistently maintained car. – The third of the three red, automatic 928 S4s in this auction and arguably the best, with the lowest mileage and the most original. It brought the same price as one of the earlier ones, a little bit more than the other, and was worth waiting for, the best of the S4 litter. 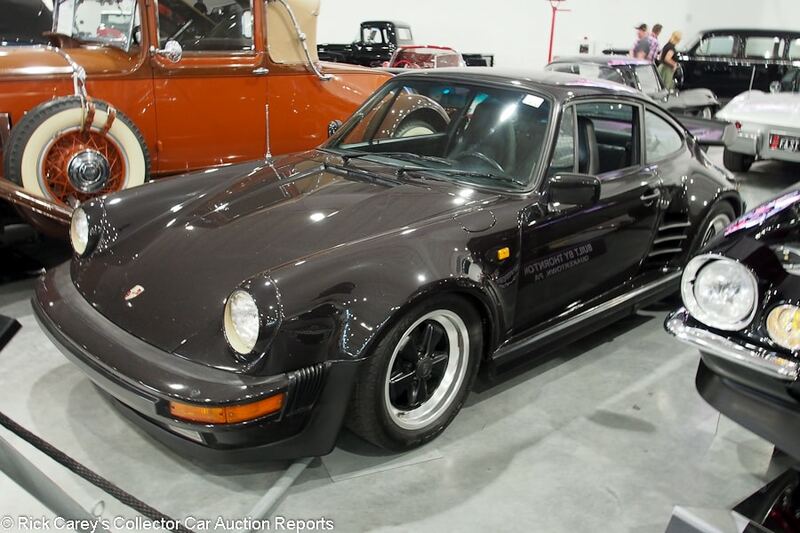 Lot # 707 1984 Porsche 930 Turbo Coupe; S/N WP0ZZZ93ZES000620; Dark Indigo/Black leather; Unrestored original, 3 condition; No Reserve; Hammered Sold at $75,000 plus commission of 10.00%; Final Price $82,500 – 3.3 liter/300hp intercooled turbo, 4-speed, sunroof, black center Fuchs wheels, Dunlop tires, whale tail, air conditioning, Blaupunkt Nassau cassette stereo, represented as a Euro spec car. – Paint to sample Dark Indigo. Represented as matching numbers and 52,042 miles. Marked up, stone chipped original paint. Good original interior with heavily scuffed driver’s seat back bolsters. Dusty original underbody and chassis. – Bought for a reasonable price taking its equipment and grey market status into account. 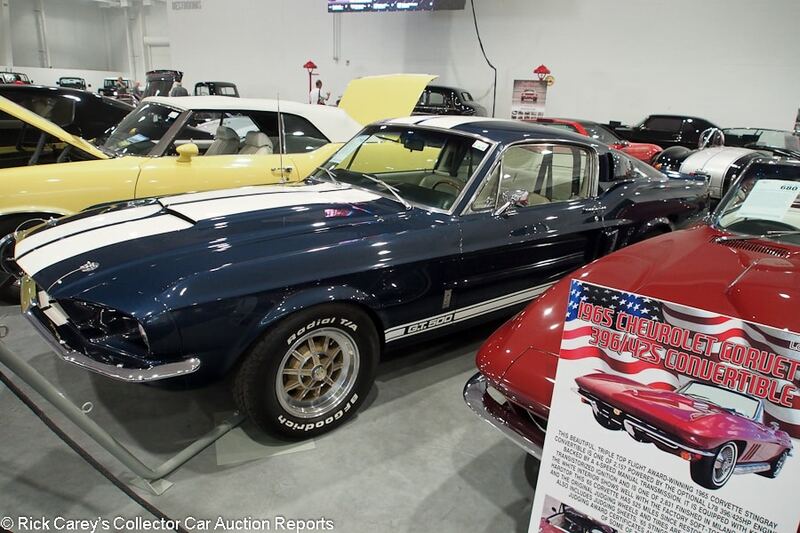 Lot # 712 1967 Shelby Mustang GT500 Fastback; S/N 67410F2U01724; Dark Blue, White stripes/White vinyl; Modified restoration, 3- condition; No Reserve; Hammered Sold at $85,000 plus commission of 10.00%; Final Price $93,500 – 428/335hp with dual quads, automatic, Shelby alloy wheels with Radial T/A tires, woodrim steering wheel. – Failing old repaint with microblisters and blisters in the hood creases. Nasty factory gauges. Dusty underbody. Closed hood, probably for a reason, concealing what is described as a dual quad, 10:1, high lift camshaft engine. – Condition and modifications combined to take a serious whack out of the value of this GT500, a whack it deserved but still makes it attractive, if on the tenuous side. 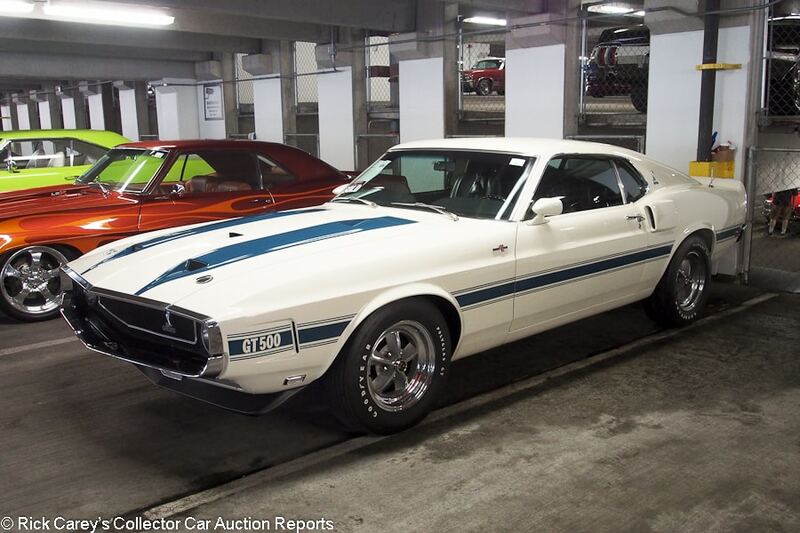 Lot # 656 1970 Shelby Mustang GT500 Fastback; S/N 0F02R483281; Wimbledon White, Blue stripes/Black vinyl; Cosmetic restoration, 3+ condition; No Reserve; Hammered Sold at $90,000 plus commission of 10.00%; Final Price $99,000 – 428/335hp, 4-speed, 10-spoke Shelby alloy wheels, Polyglas GT tires, 8-track stereo, woodrim steering wheel, 3.91 Traction-Lok, oil cooler, Marti Report, original build sheets and window sticker documented. – Good, unblemished paint, clean underbody. Good interior but the steering wheel rim is badly worn. Good gauges and knobs but the console trim is badly worn. Lumpy original undercoat in the wheel wells. Both doors close slightly proud. A good but not exceptional GT500. – And that is precisely where the Mohegan Sun bidders put its value, an accurate reflection of its quality, restoration and the restoration’s preservation. 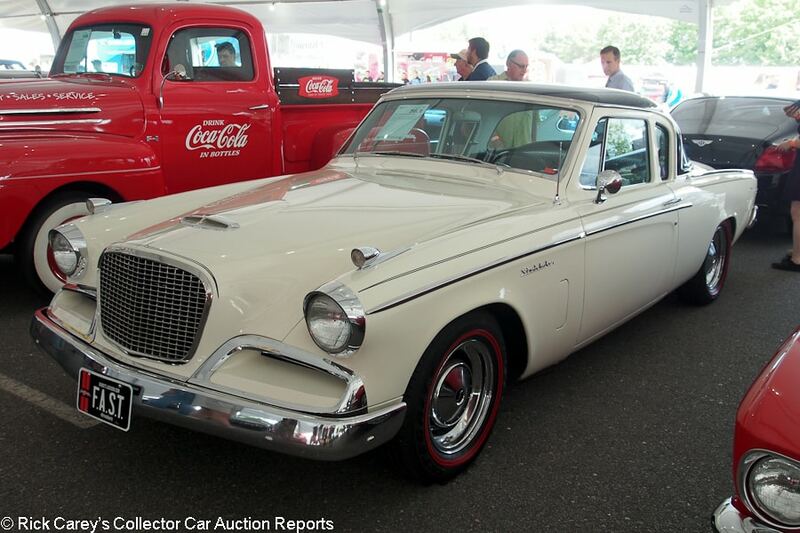 Lot # 56.1 1956 Studebaker Power Hawk Coupe; S/N 8852059; White, Black roof/White, Black vinyl; Visually maintained, largely original, 3- condition; No Reserve; Hammered Sold at $24,500 plus commission of 10.00%; Final Price $26,950 – 259/170hp, automatic, chrome wheels, Goodyear double red line tires, pushbutton radio. – Repainted assembled and erratically masked. Sound original interior. Pitted cast trim chrome, dead original windwing gaskets. The underbody has original gloppy undercoat and has been quickly squirted with black paint over everything. An auction car. – In many respects this is a neat old car let down by its aftermarket chrome wheels and the parking light excrescences on the front fenders. It’s difficult to argue with this result for an externally attractive but indifferent Studebaker. 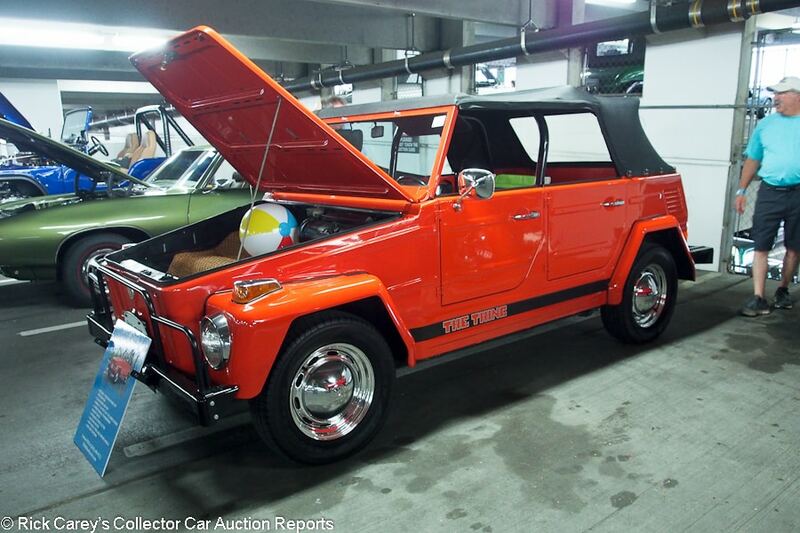 Lot # 107 1973 Volkswagen Type 181 Thing; S/N 1832653610; Orange/Black vinyl; Black vinyl top; Visually maintained, largely original, 3 condition; No Reserve; Hammered Sold at $16,000 plus commission of 10.00%; Final Price $17,600 – 1.6 liter, Kenwood CD stereo, EMPI shifter, chrome wheels, hubcaps, Goodyear tires, bumper overrider, gasoline heater. – Serviceable repaint, scuffed door handle chrome, sound interior and top. Old undercoat has been given a quick black respray. A Thing to be driven and enjoyed. – This is a Thing of some appeal. It’s pretty enough that it won’t be embarrassing to drive, but it’s not so good that grandkids, ice cream cones and wet dogs are intolerable. This is a completely reasonable price to pay for it. 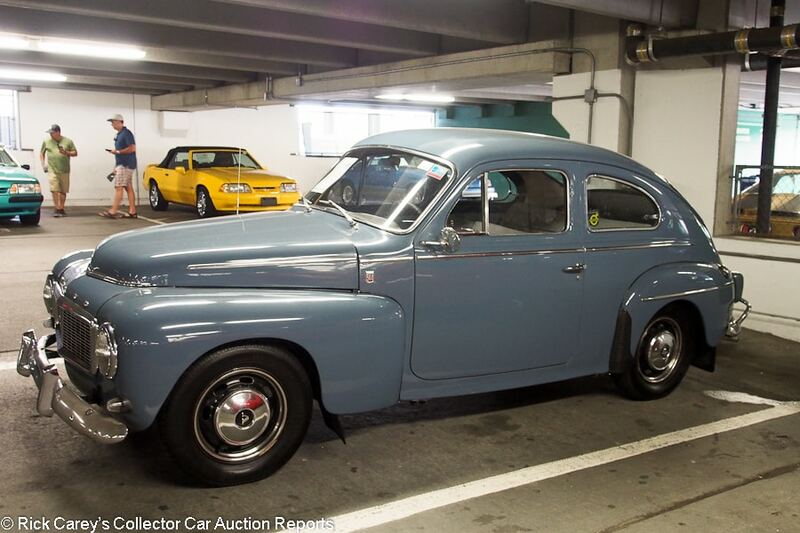 Lot # 605 1965 Volvo PV544 2-Dr. Sedan; S/N 432117; Grey/Light Grey vinyl; Visually maintained, largely original, 3- condition; No Reserve; Hammered Sold at $15,000 plus commission of 10.00%; Final Price $16,500 – Hubcaps, Vredestein tires, vinyl wrapped steering wheel, pushbutton Volvo radio, bumper overriders. – Sound but dull repaint with light orange peel, Scratched windshield trim, Thin bumper chrome and pitted hood trim. Dirty, original and used engine compartment. Crudely taped headlight wiring. The gas cap leaks but proves that the seller filled it up before bringing it to the auction. – Beloved by denizens of the north woods of New England, the PV544 has proven itself on rough roads, ice and snow for three generations. It helps that it looks like a ’40 Ford Tudor. A sound if occasionally bodged example, it’s going to be a hoot to fling down dirt roads, summer or winter, and is realistically priced here. 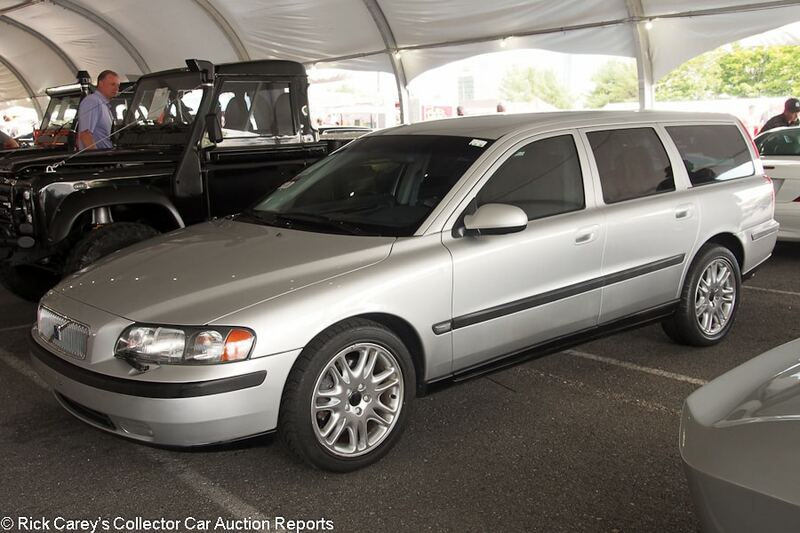 Lot # 10.1 2001 Volvo V70 Sport Wagon; S/N YV1SW53D111097993; Silver-Grey/Black; Unrestored original, 3 condition; No Reserve; Hammered Sold at $5,000 plus commission of 10.00%; Final Price $5,500 – Automatic, heated seats, climate control, CD stereo, navigation. – Clean used car without mileage stated and an electronic odometer that is invisible. Represented as having a clean CarFax. – Why is this car here? Some might surmise it wouldn’t sell at ADESA’s wholesale auction so it was offered to a more flexible audience. It was not alone in this category at B-J Northeast. 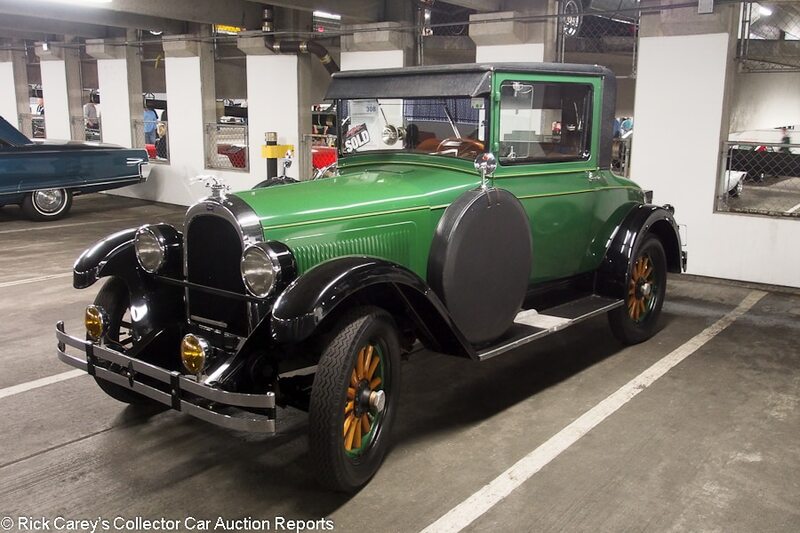 Lot # 308 1928 Whippet Model 98 Coupe; S/N 9826337; Green, Black fenders/Beige cloth; Older restoration, 3 condition; No Reserve; Hammered Sold at $12,700 plus commission of 10.00%; Final Price $13,970 – Through the windshield spotlight, dual vinyl covered sidemounts with mirrors, varnished wood spoke wheels, windshield visor, drum headlights, fog lights, windwings, trunkback body with added luggage trunk, temperature gauge mounted on the steering column. – Dull but sound older paint, good chrome and interior. Orderly engine compartment showing miles, as is the chassis. – Sold by RM at Hershey last October for $8,800, which was a bargain that was compensated for here with this reasonable price. The Whippet was John North Willys’ successor to the Overland, an economical small car priced at just over $500. It just couldn’t compete with Ford’s Model A or Chevy’s National and has largely been forgotten despite being one of the earliest ‘compact’ cars. It’s a bit of American automobile industry history bought here for a nice price.